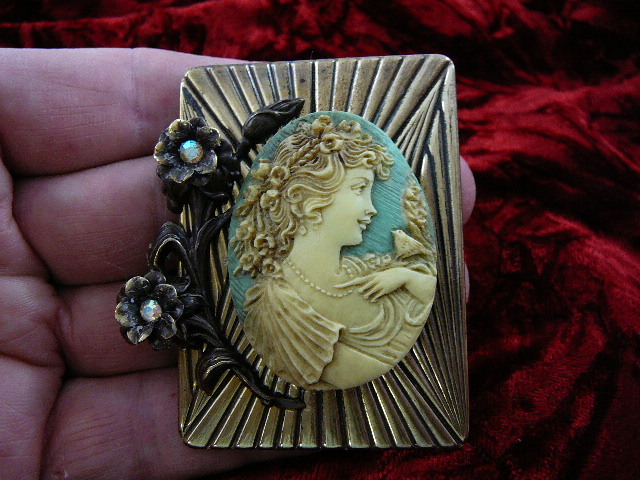 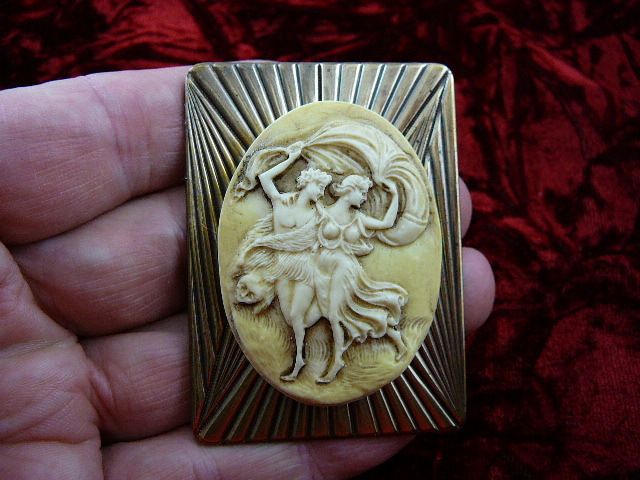 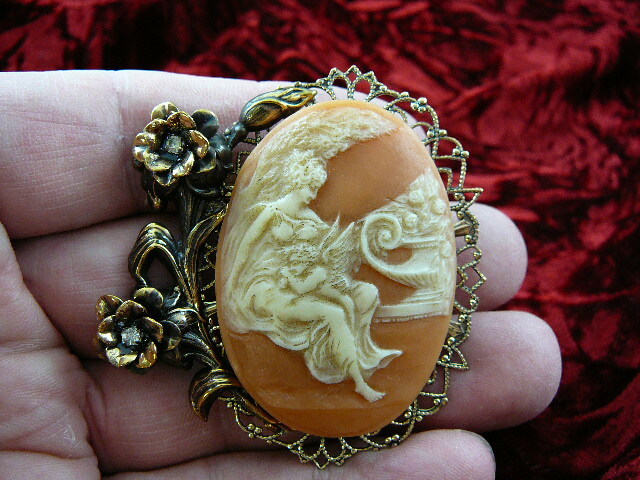 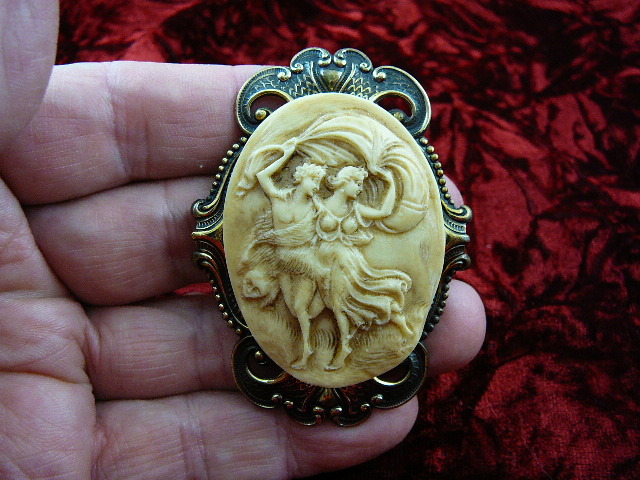 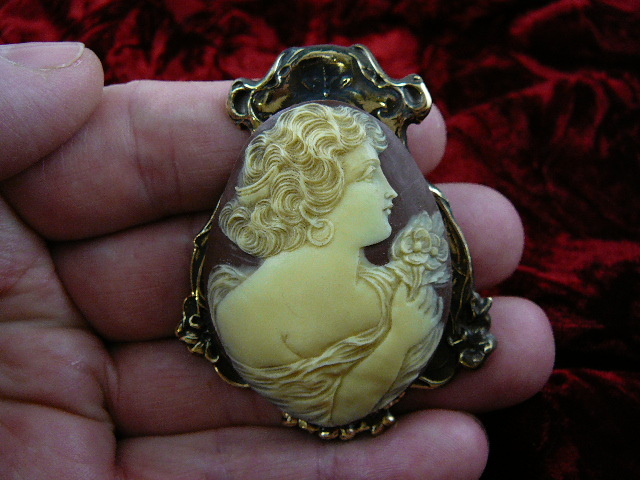 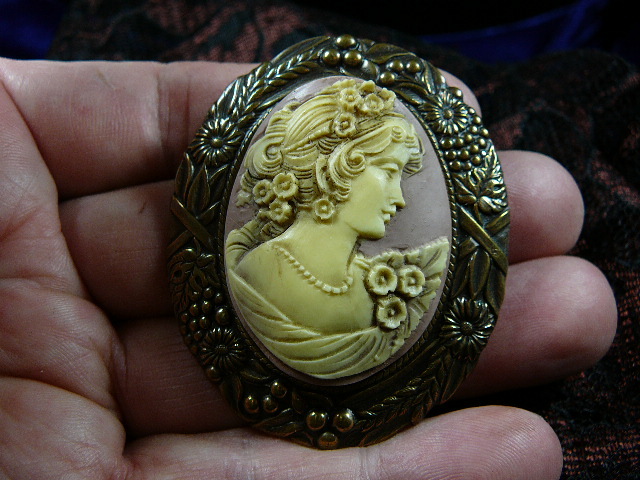 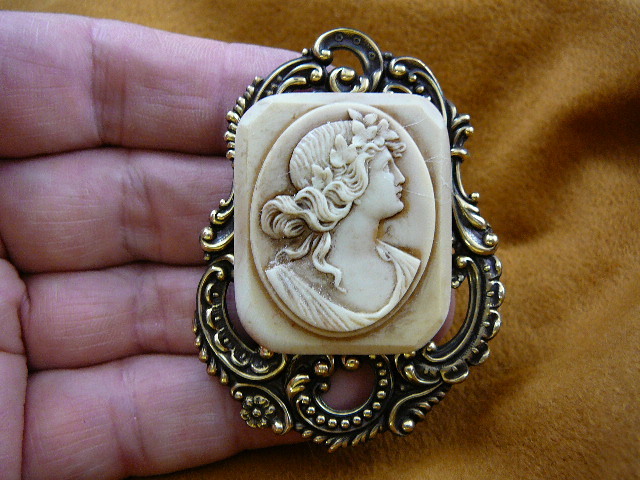 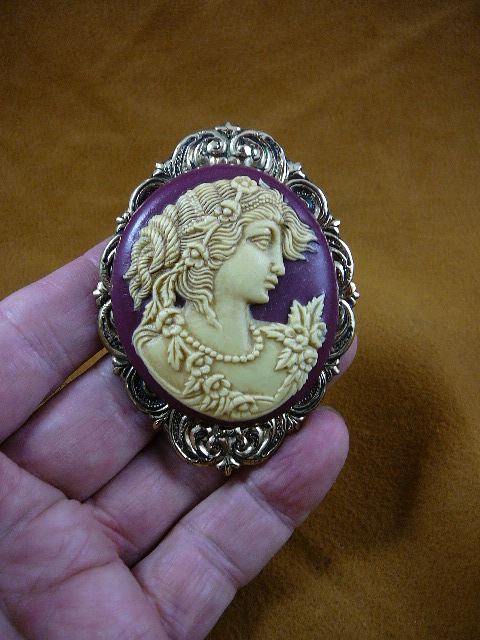 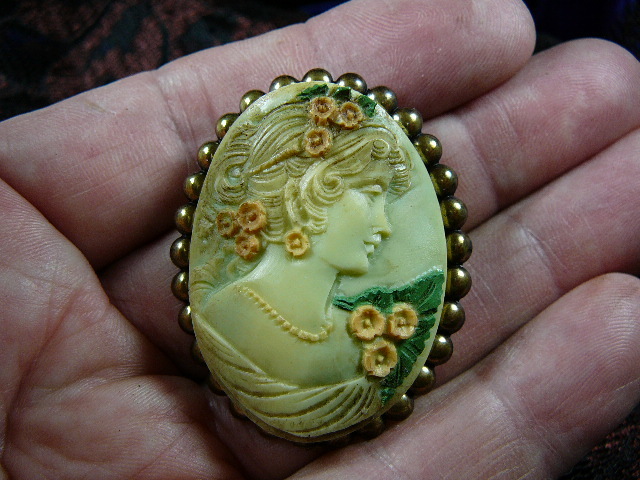 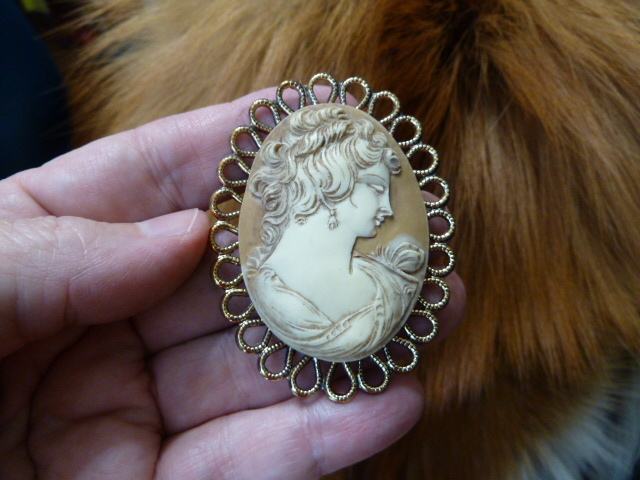 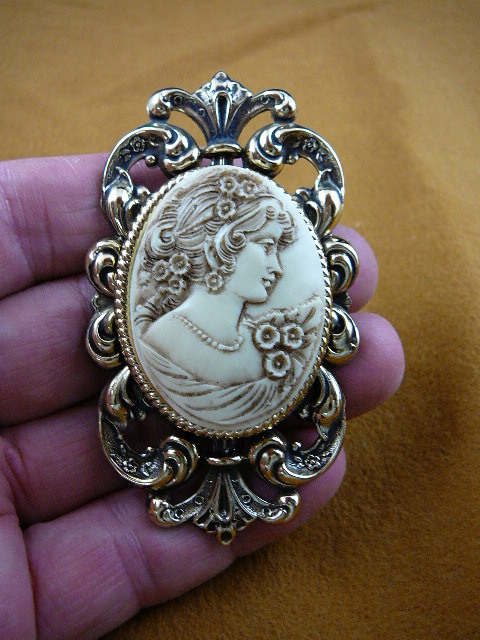 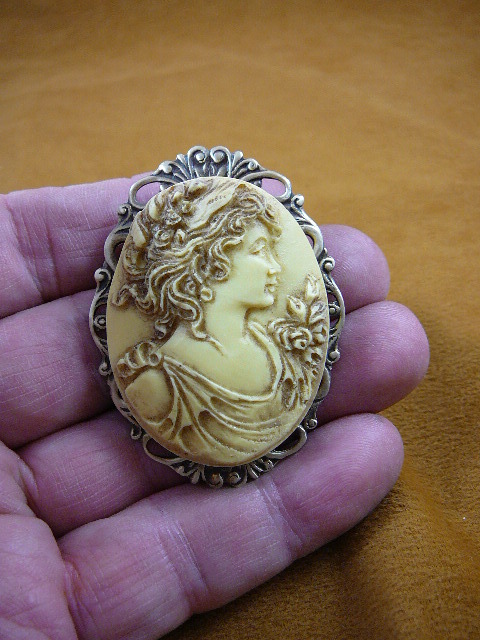 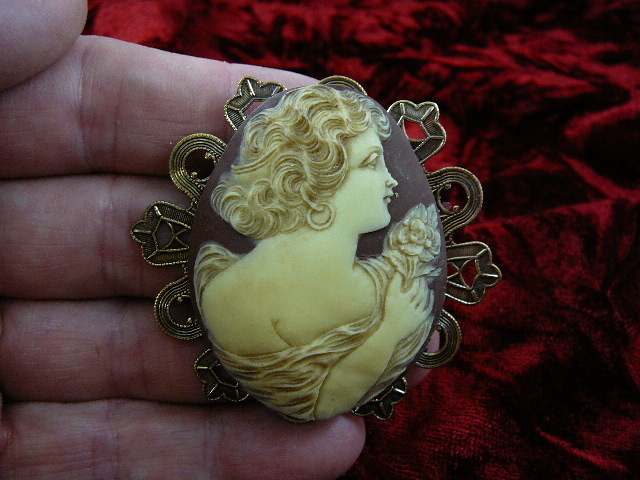 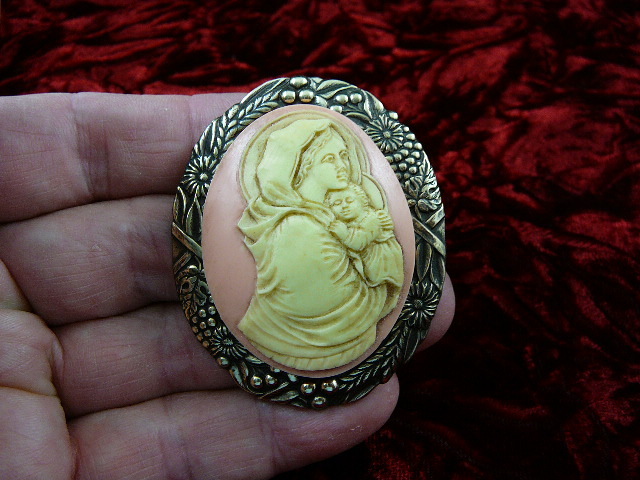 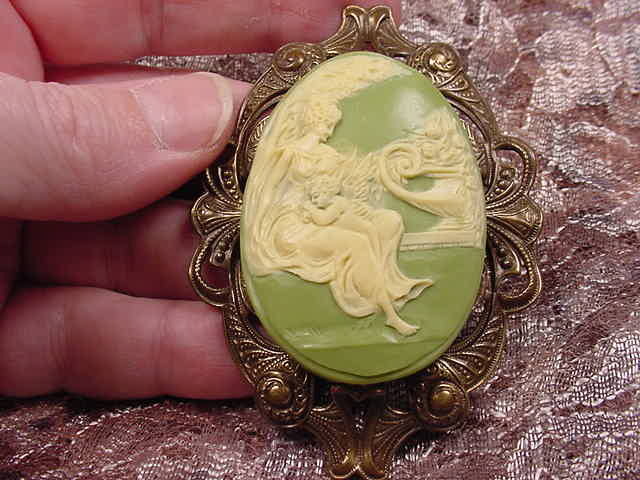 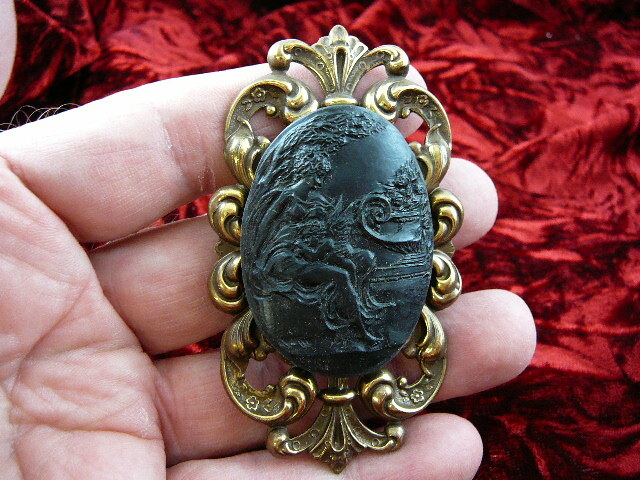 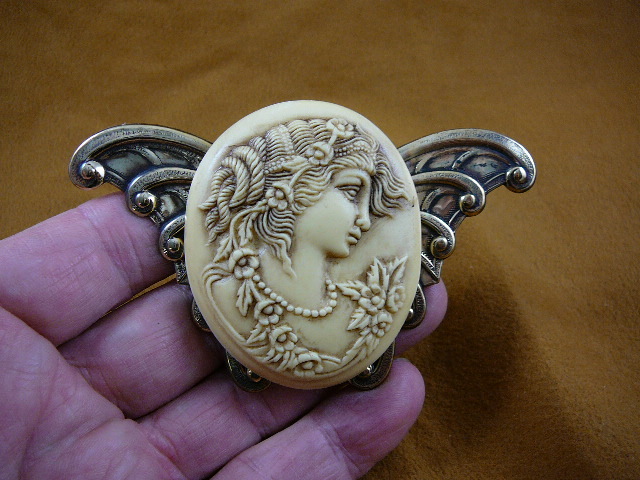 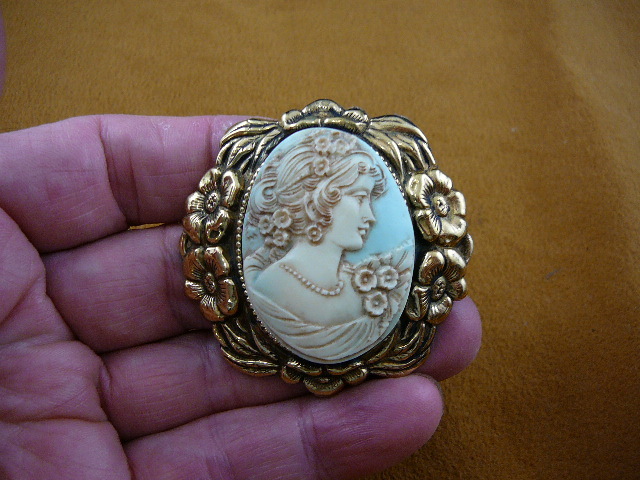 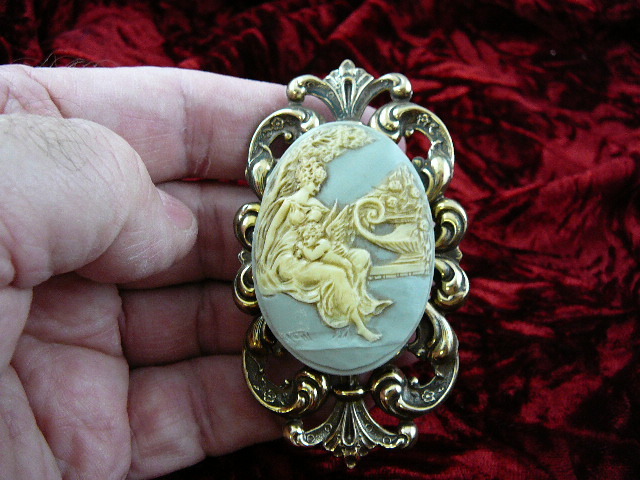 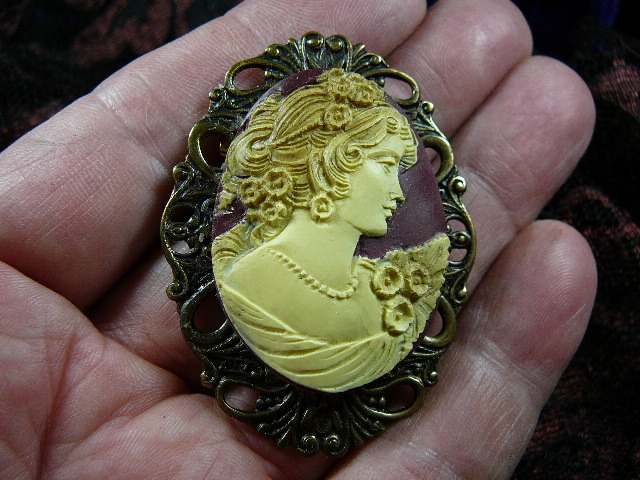 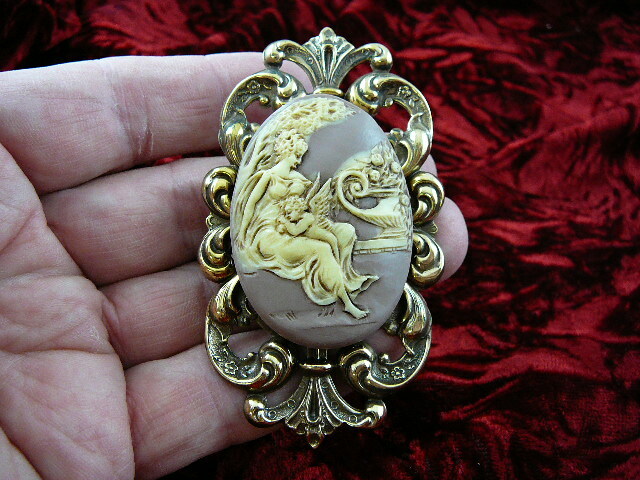 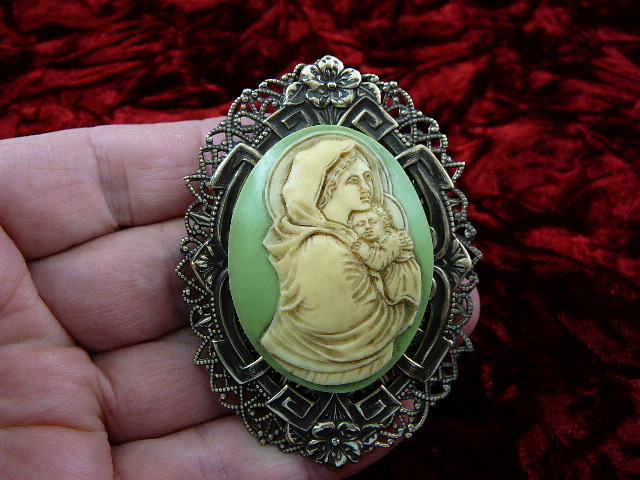 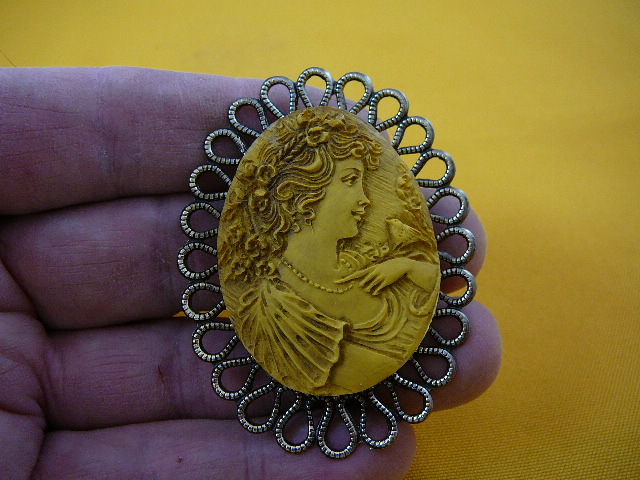 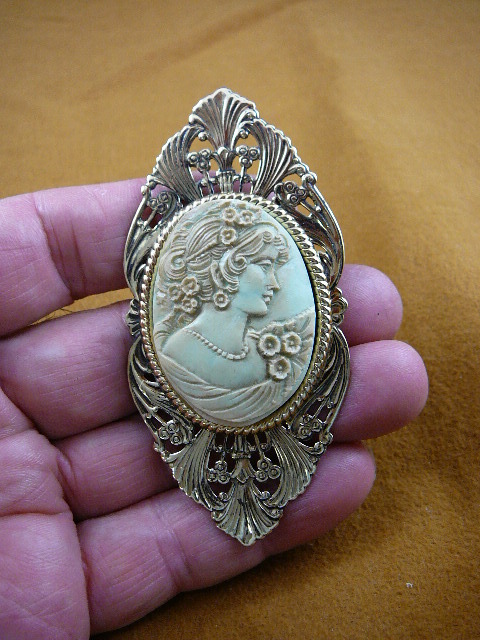 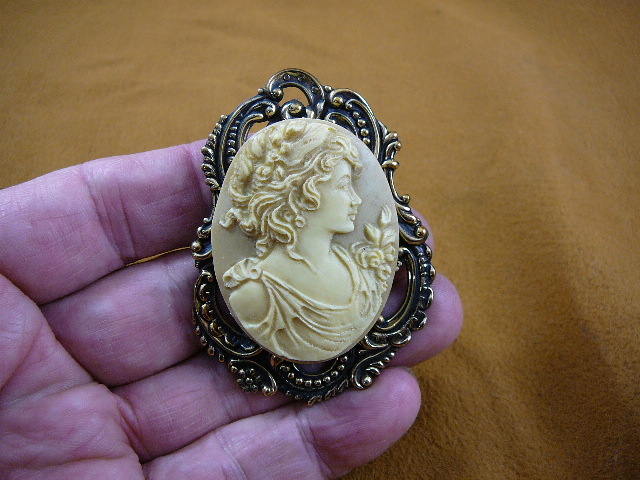 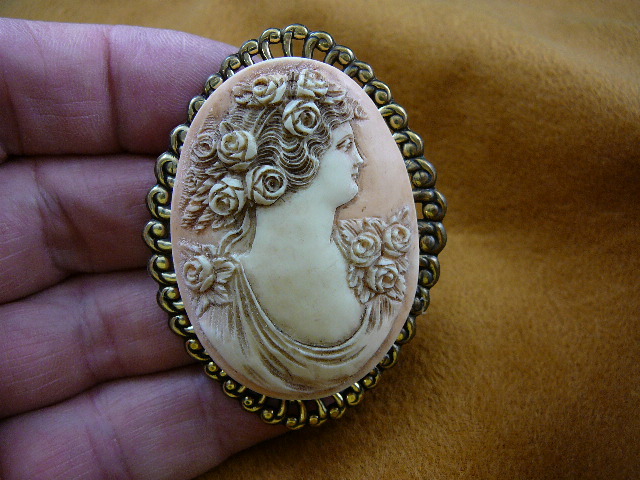 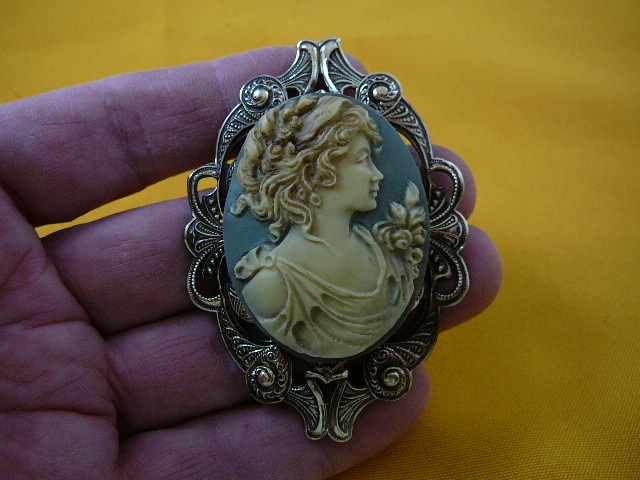 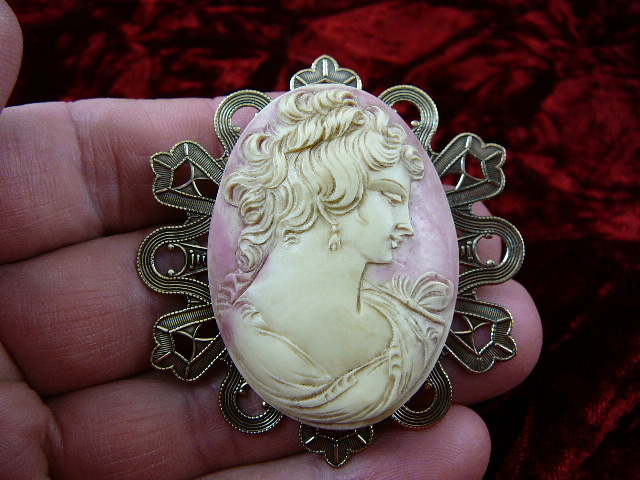 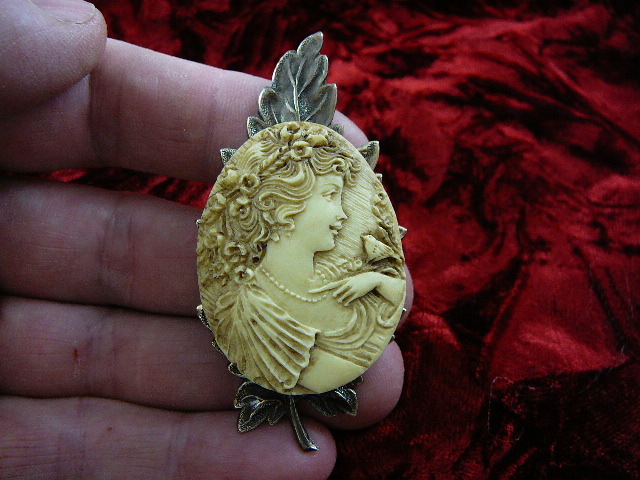 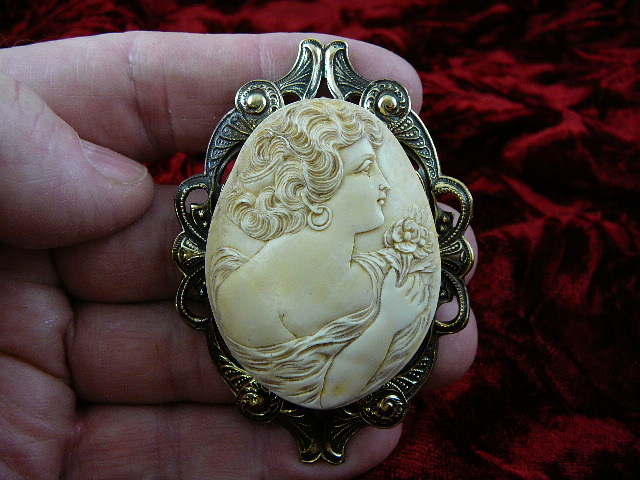 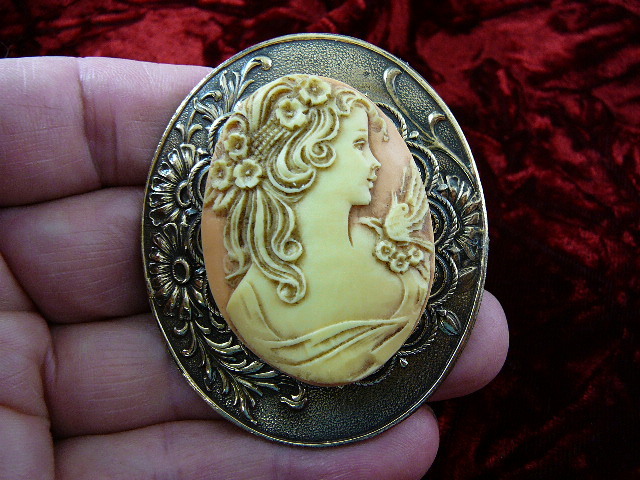 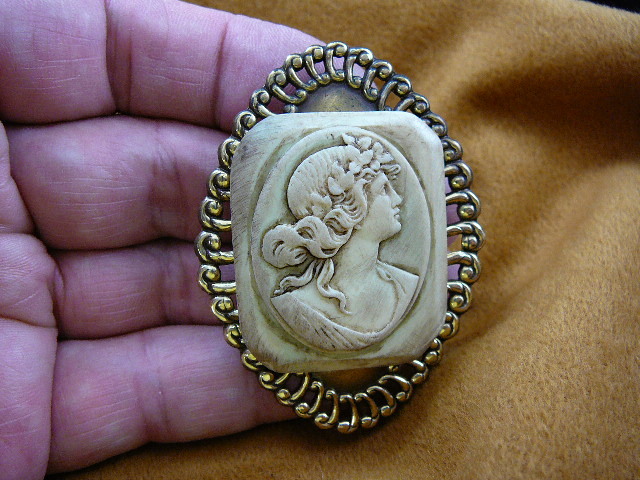 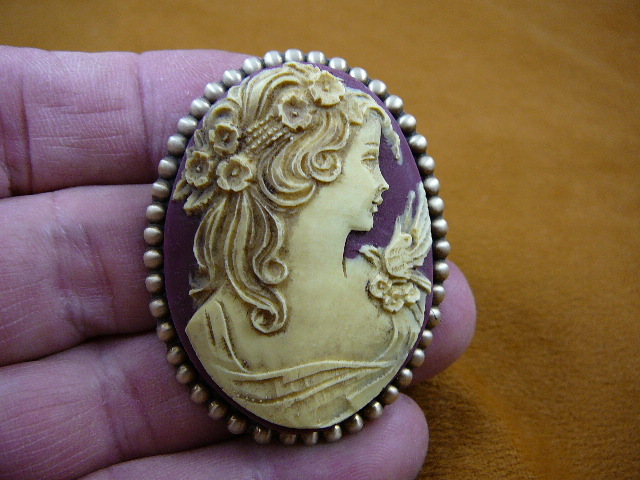 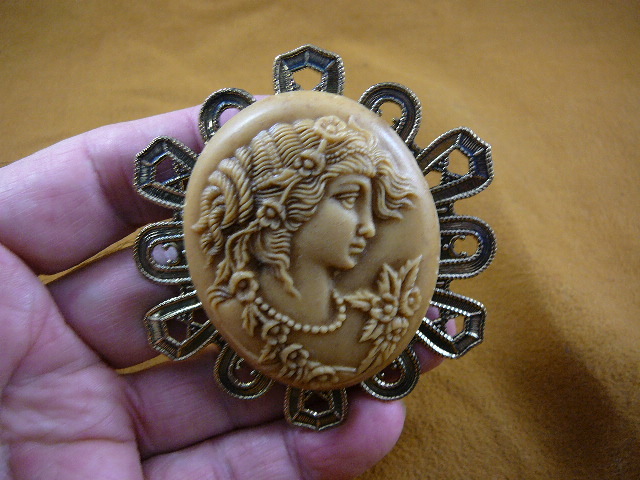 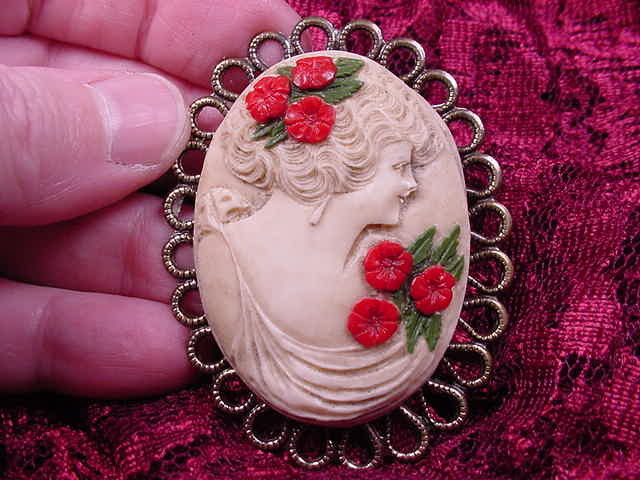 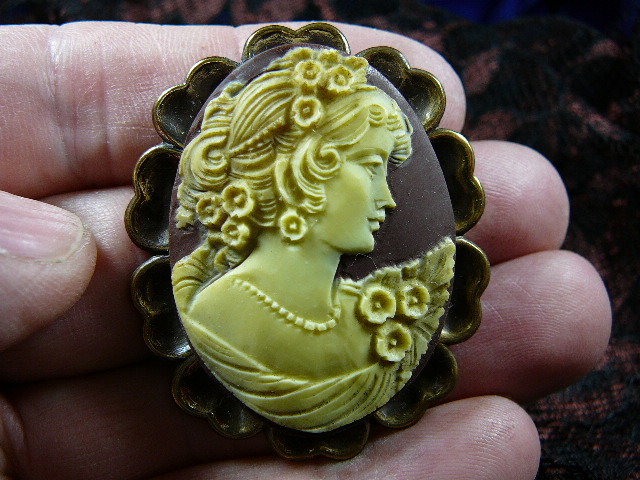 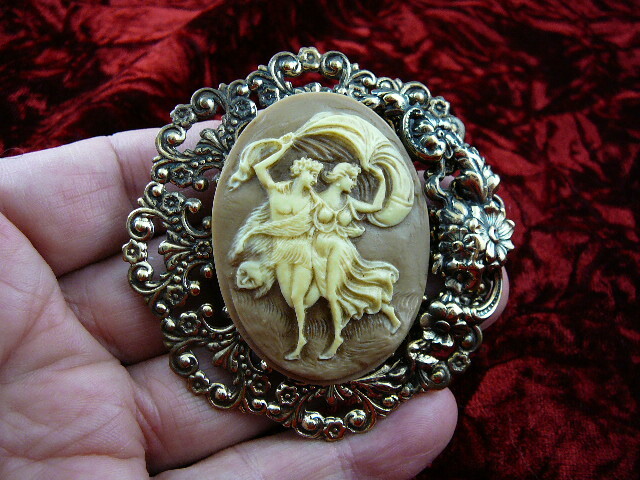 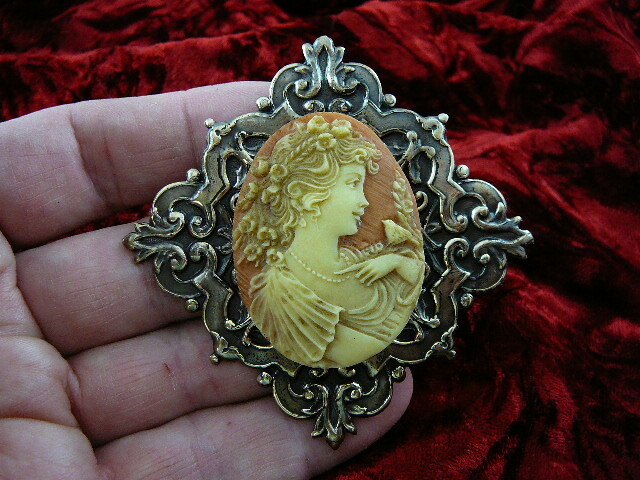 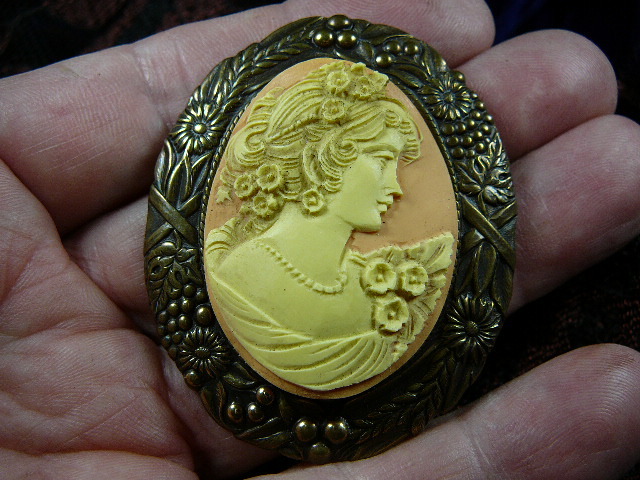 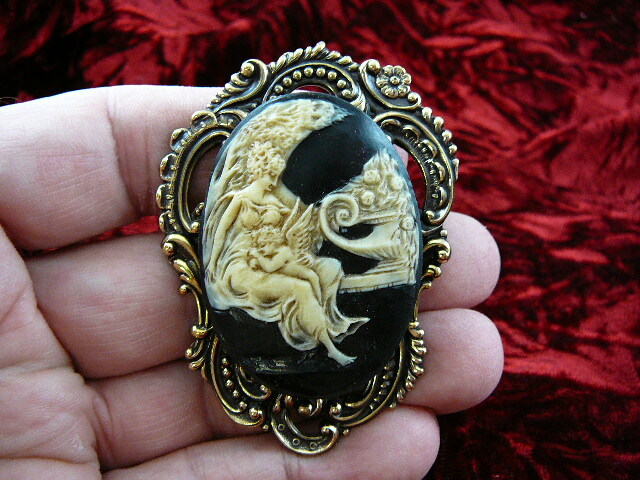 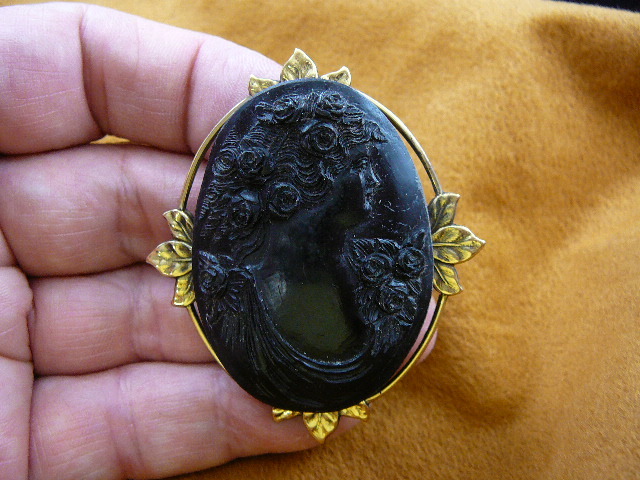 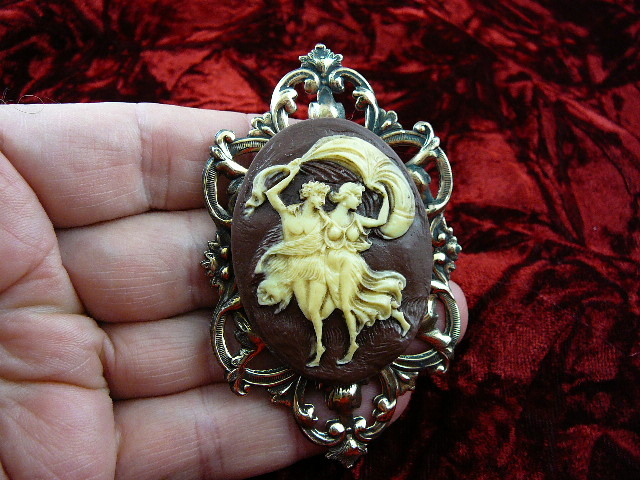 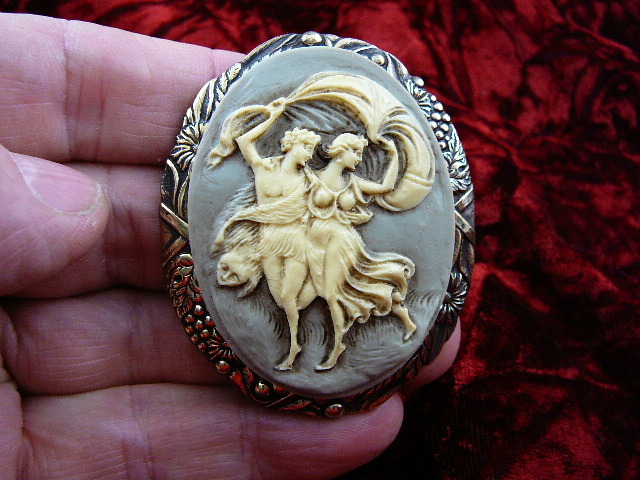 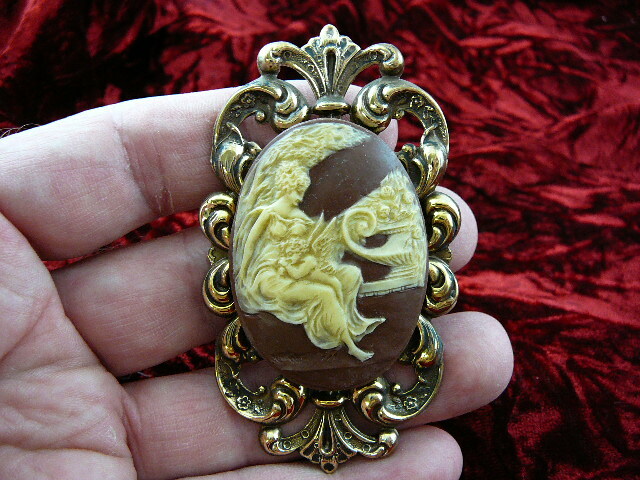 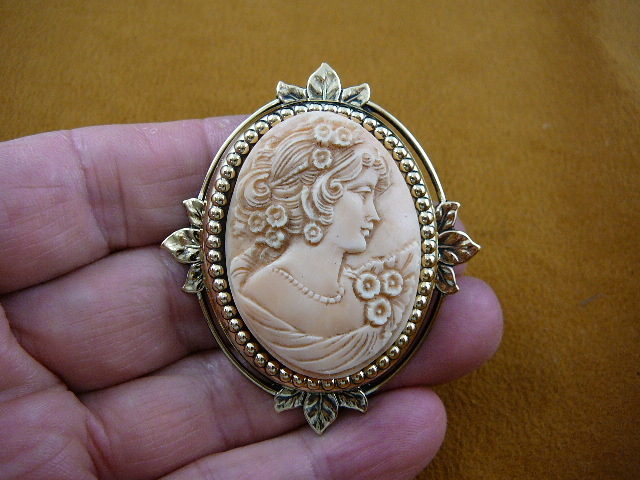 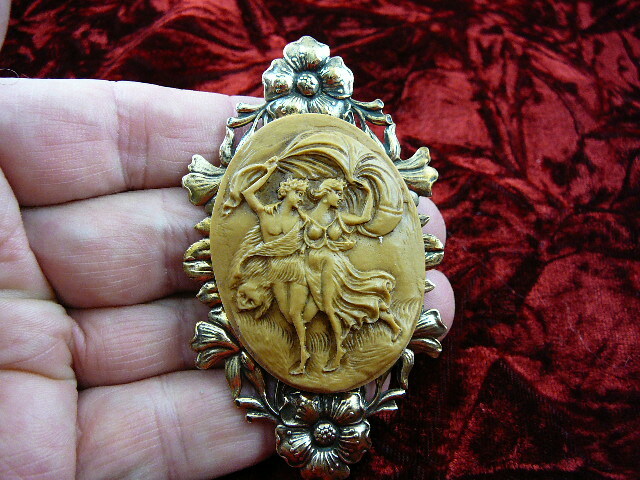 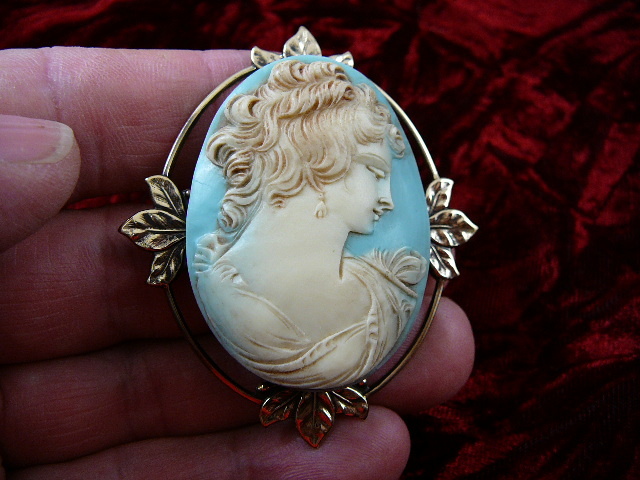 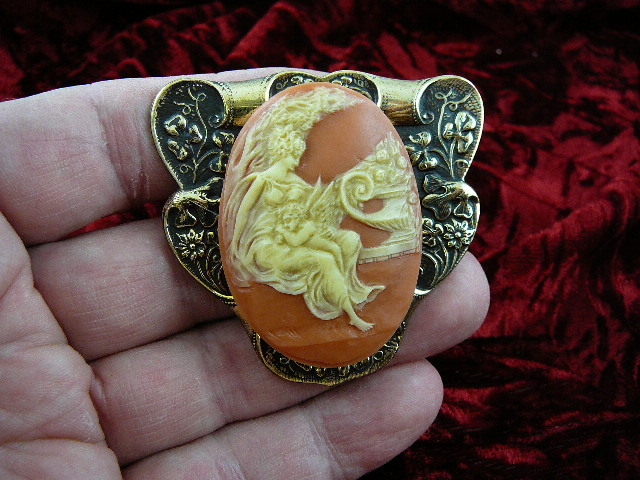 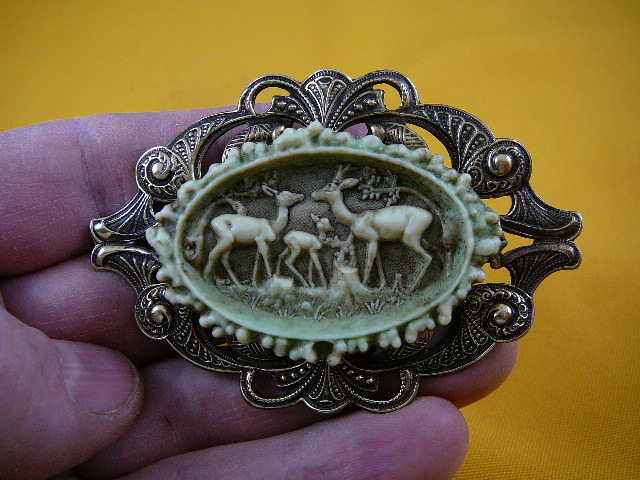 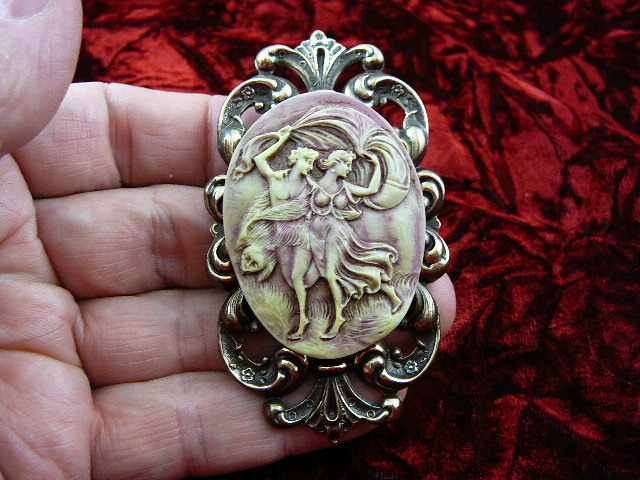 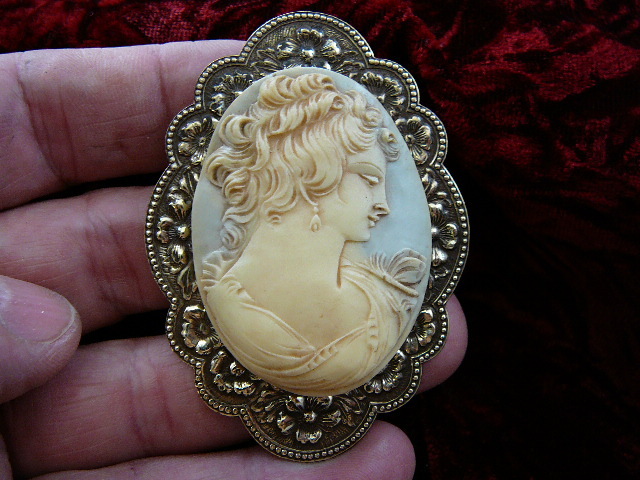 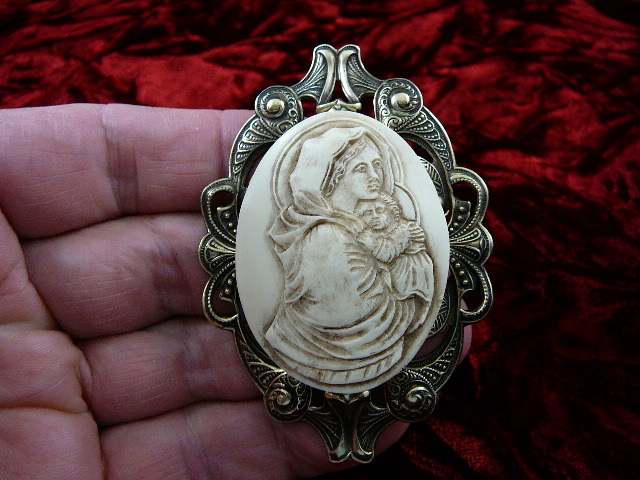 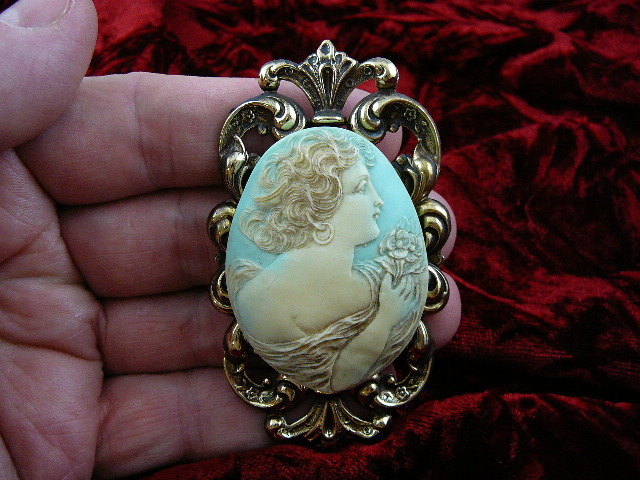 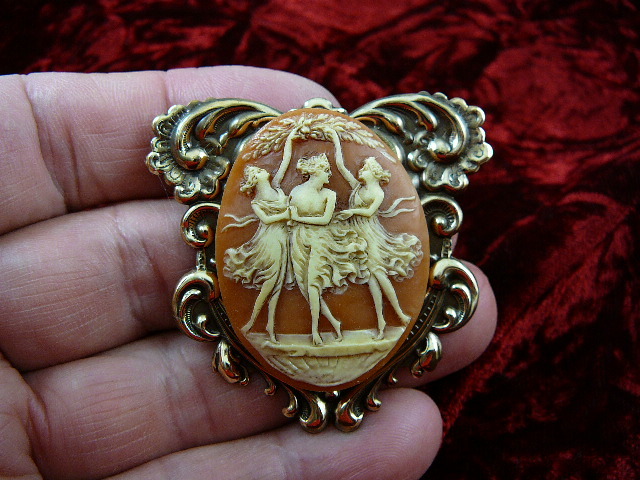 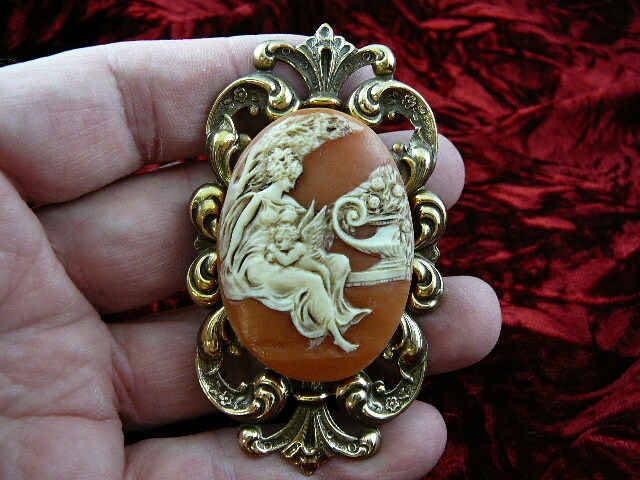 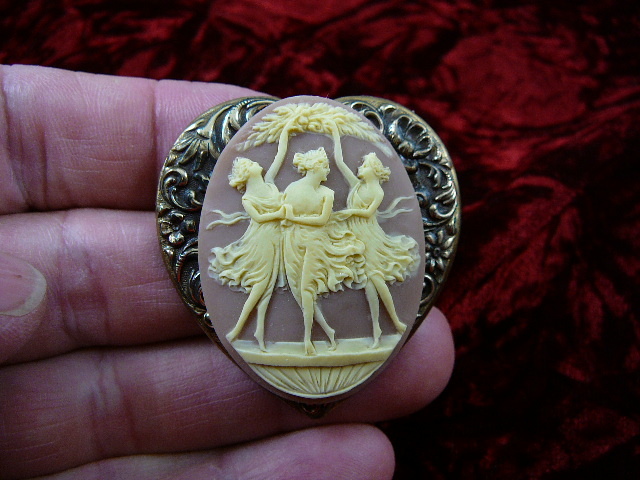 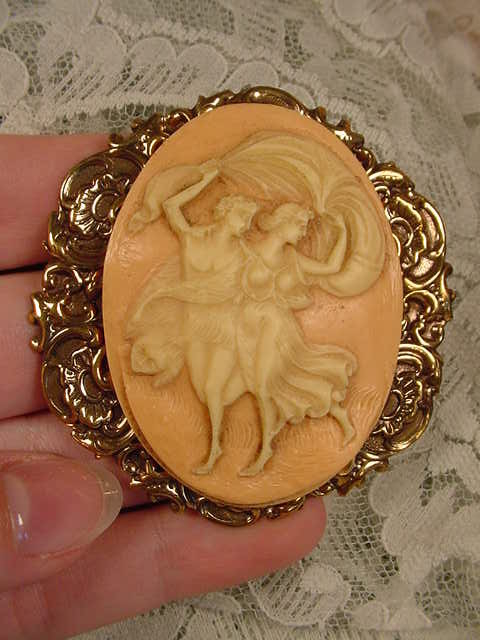 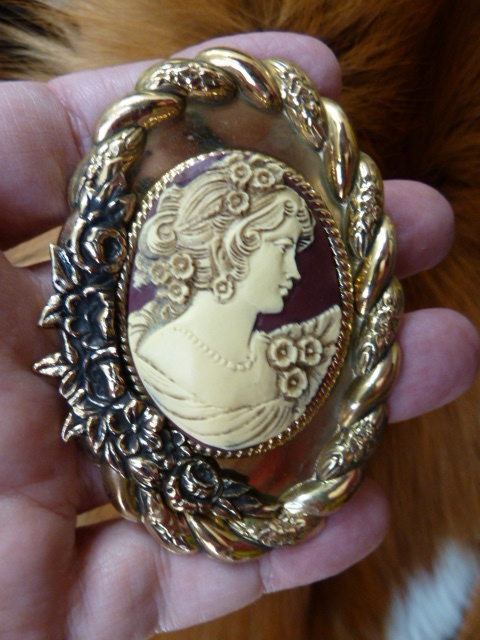 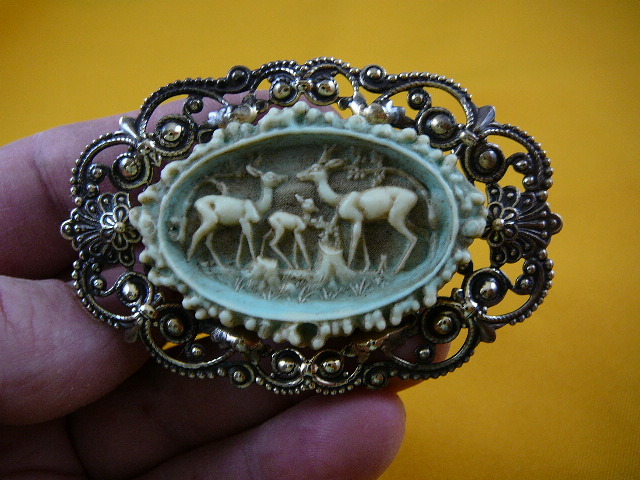 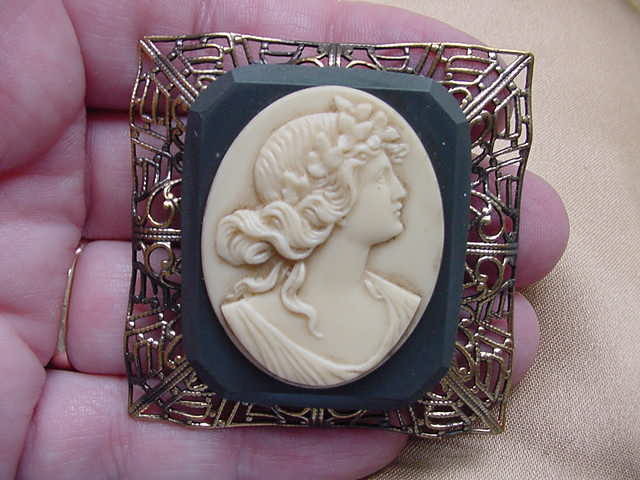 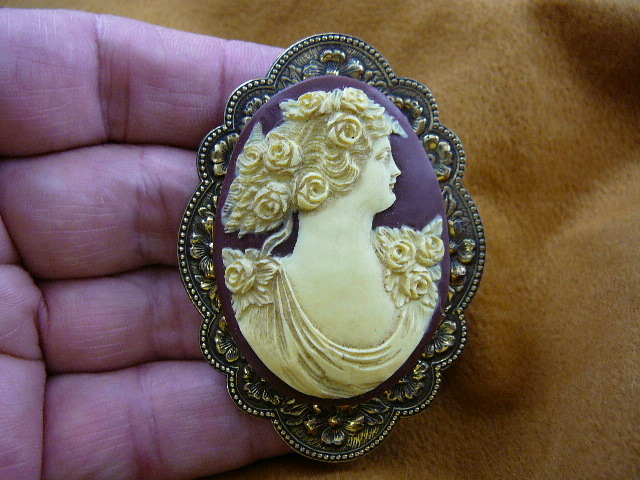 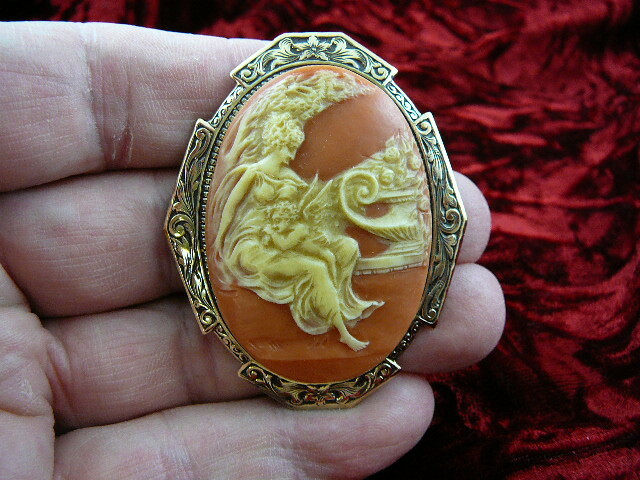 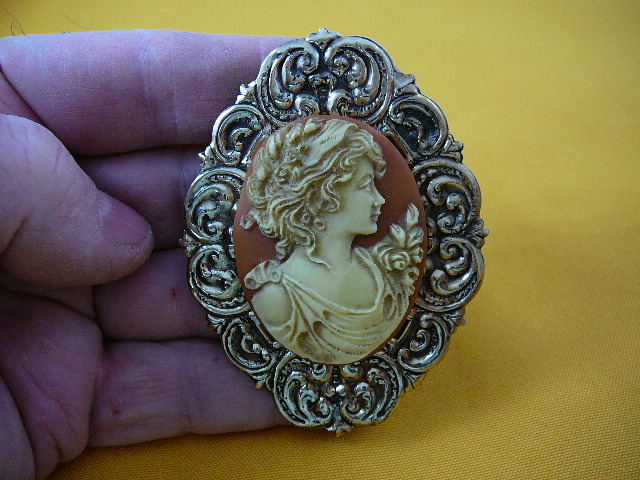 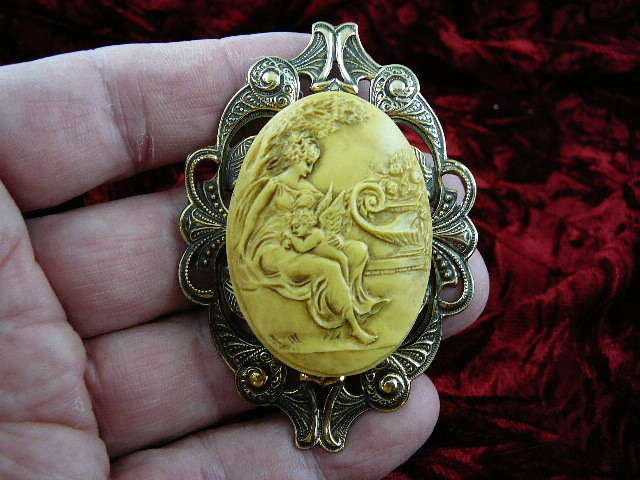 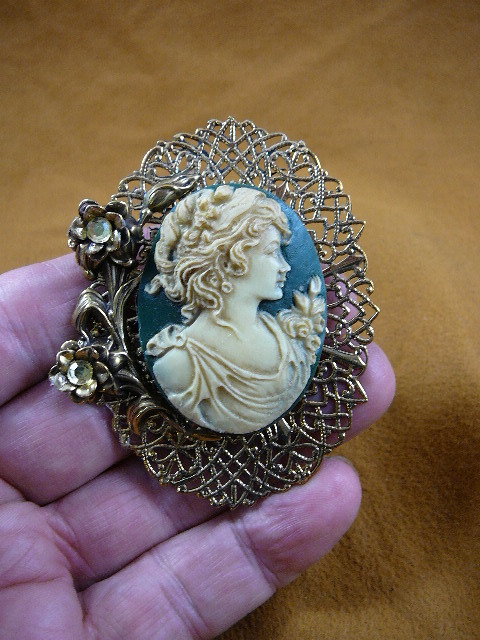 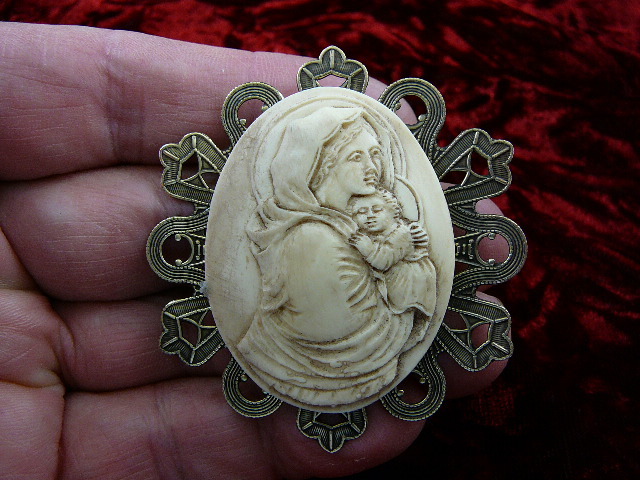 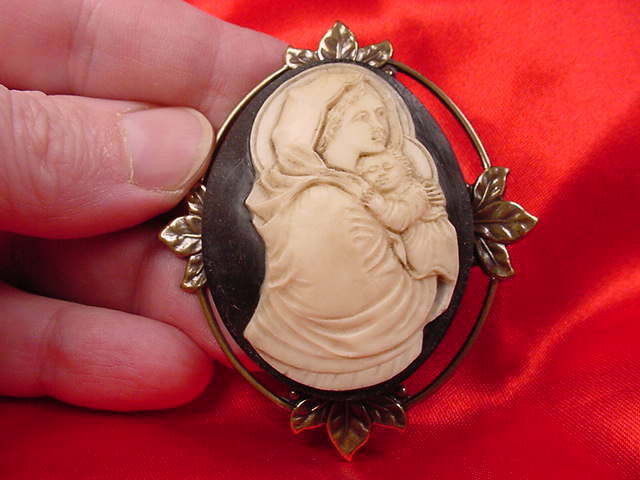 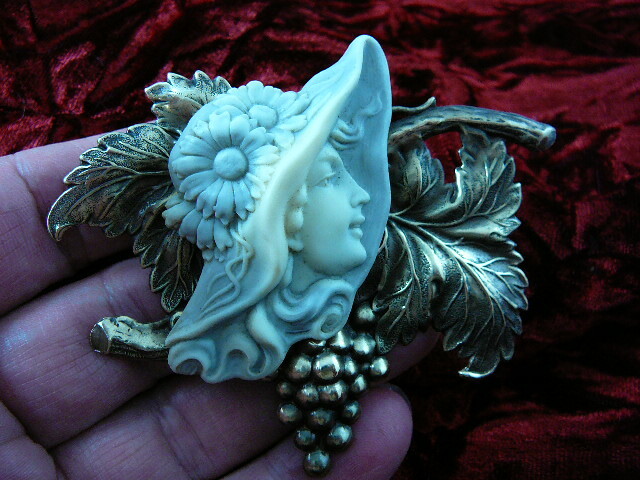 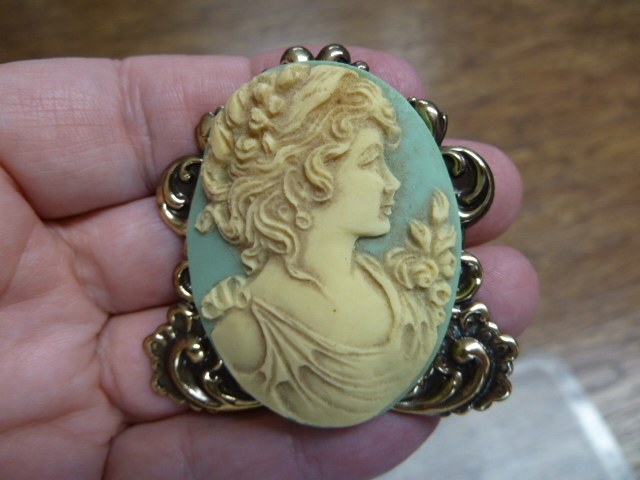 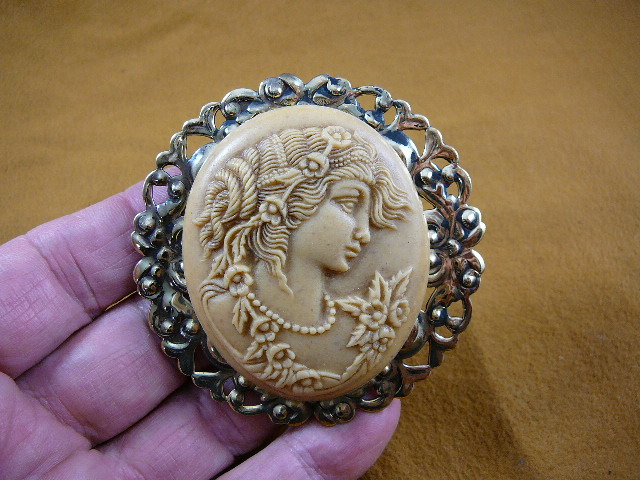 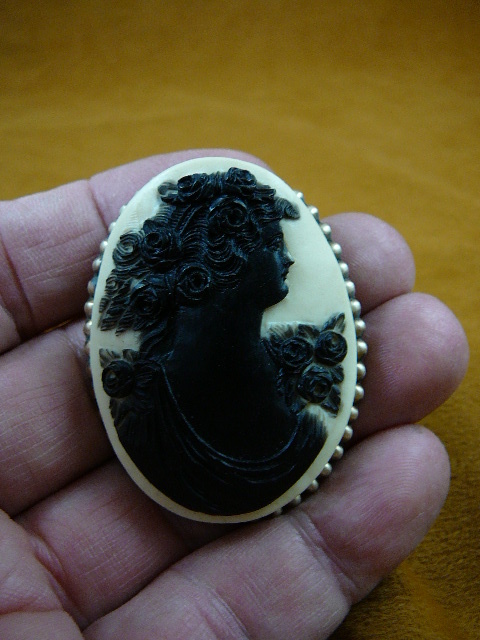 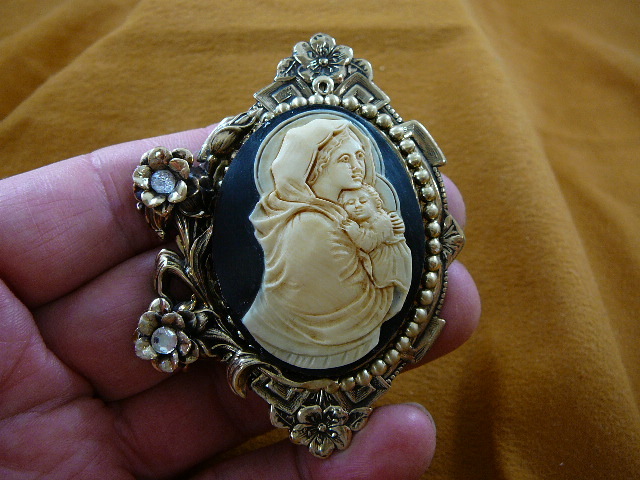 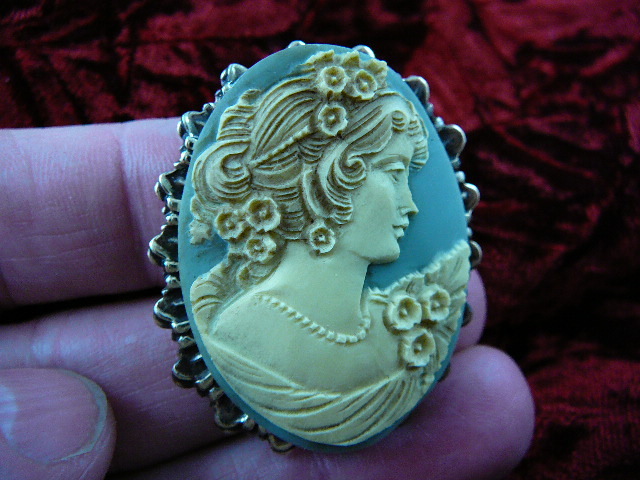 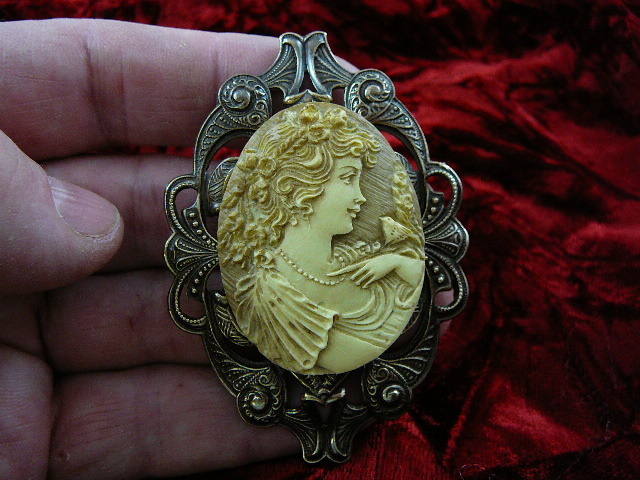 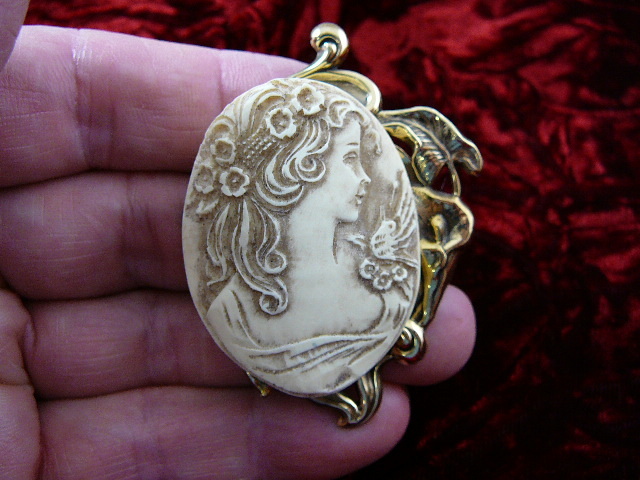 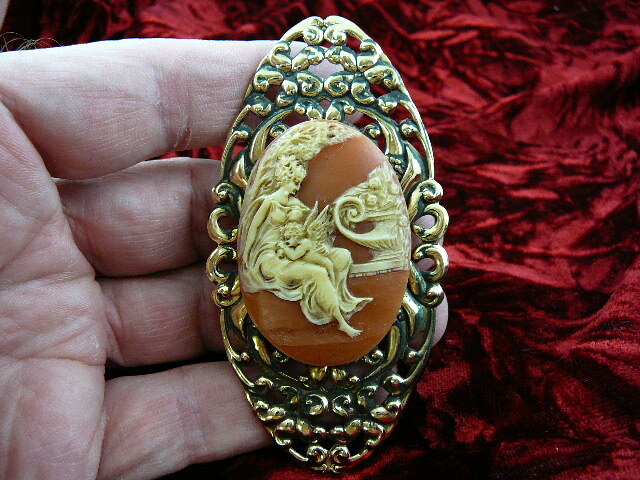 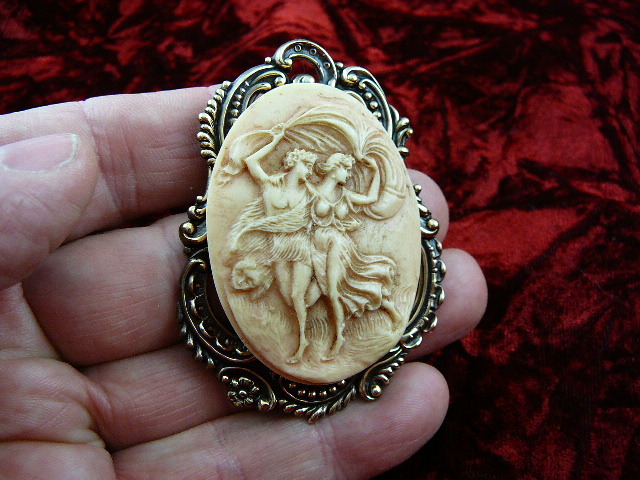 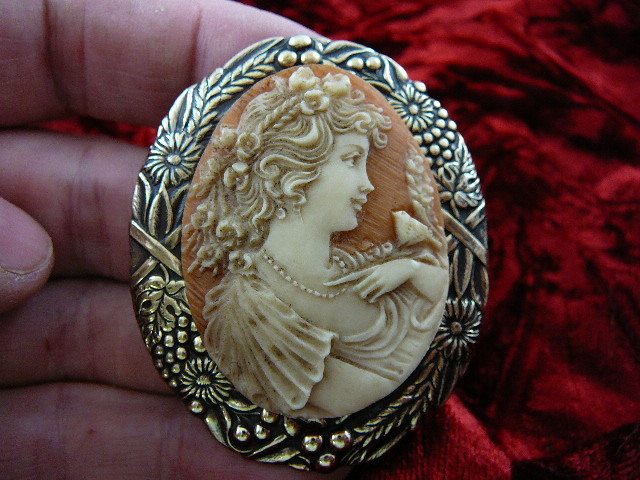 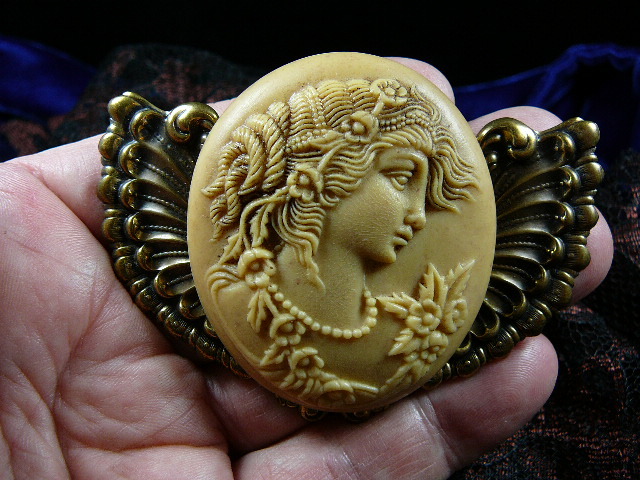 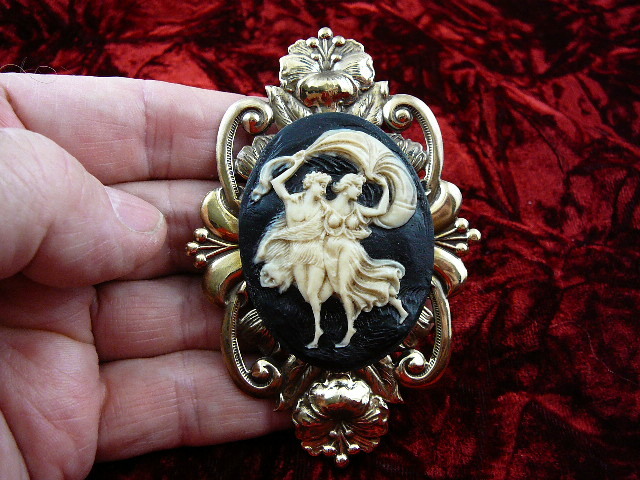 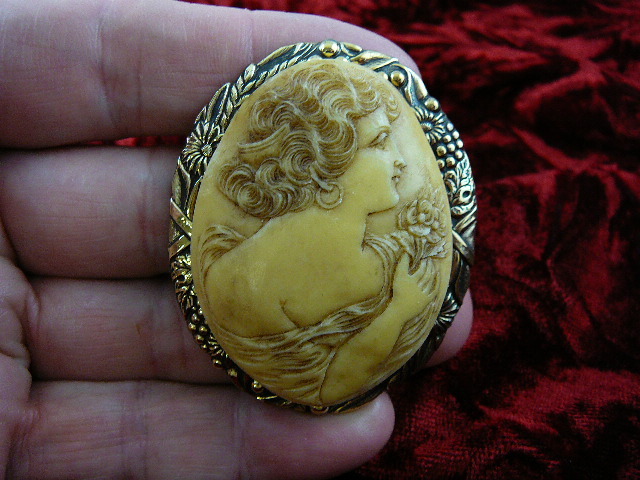 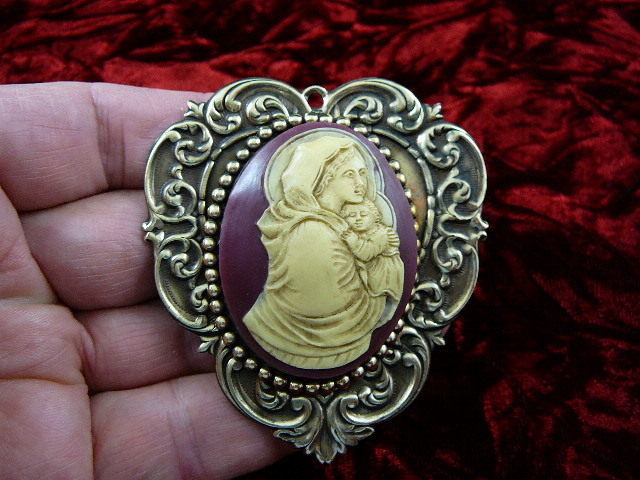 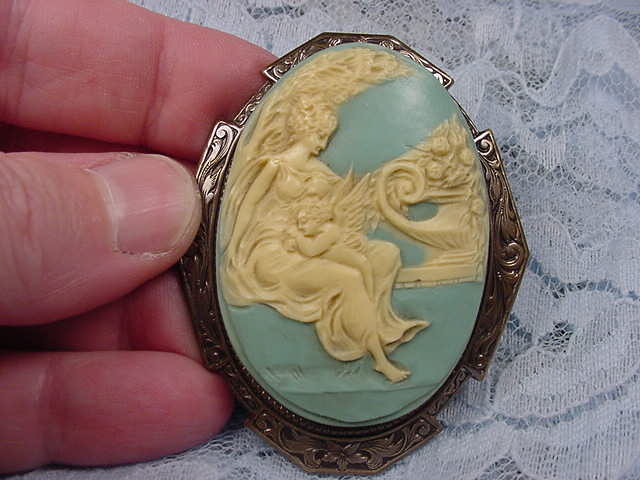 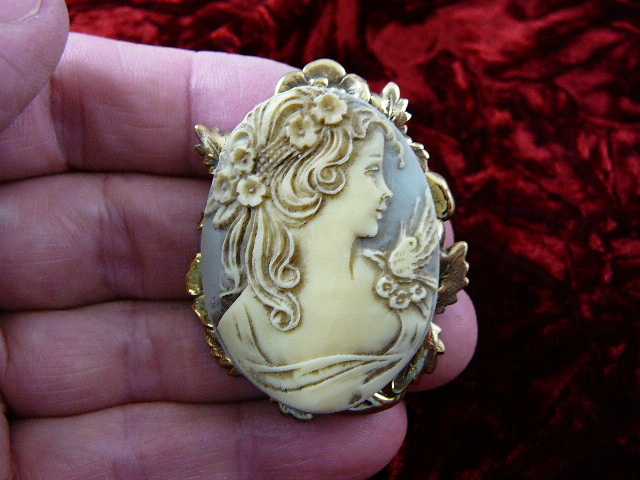 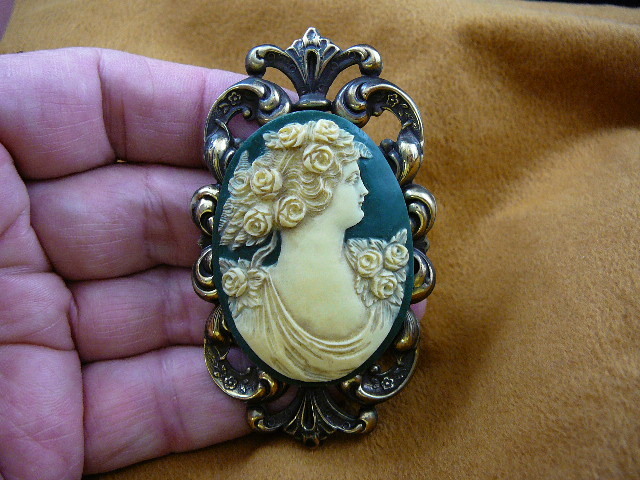 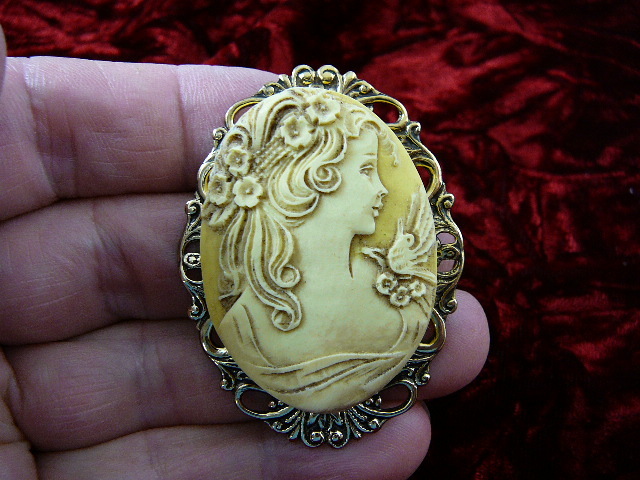 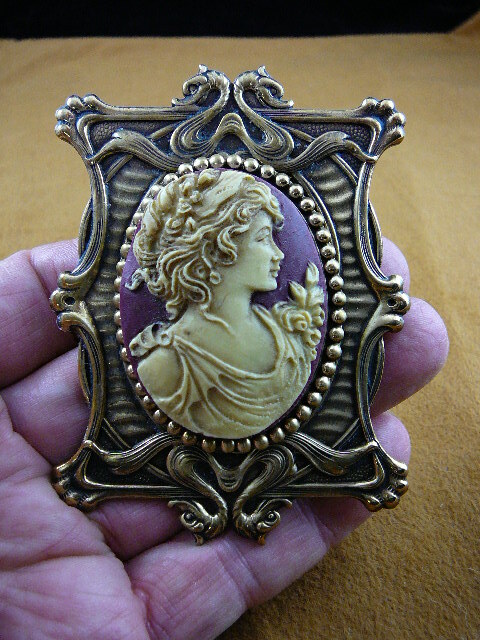 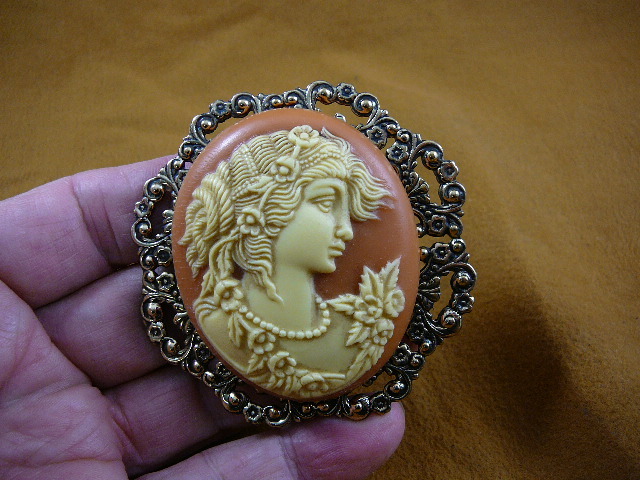 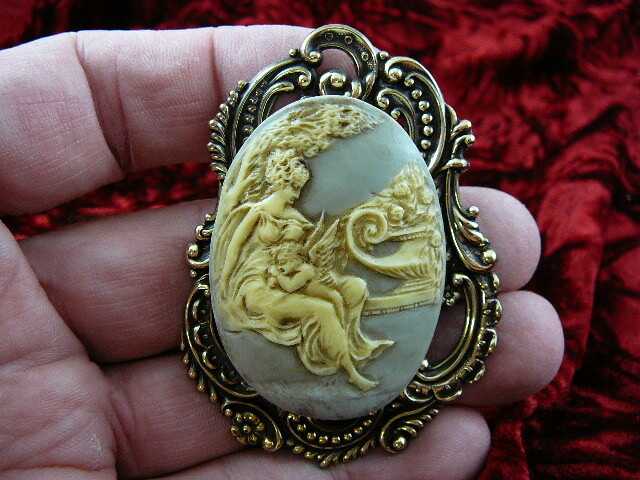 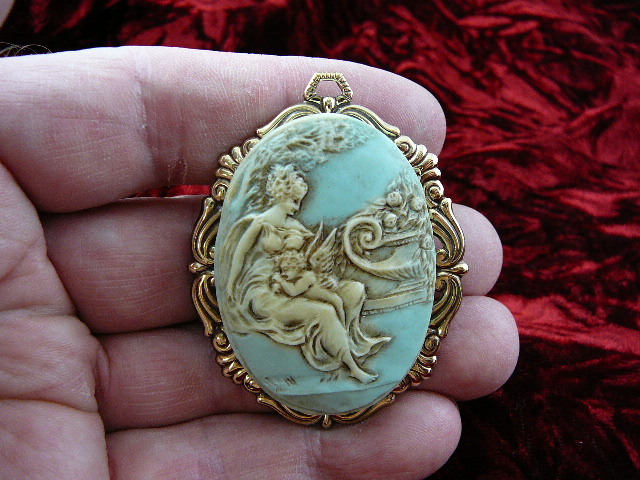 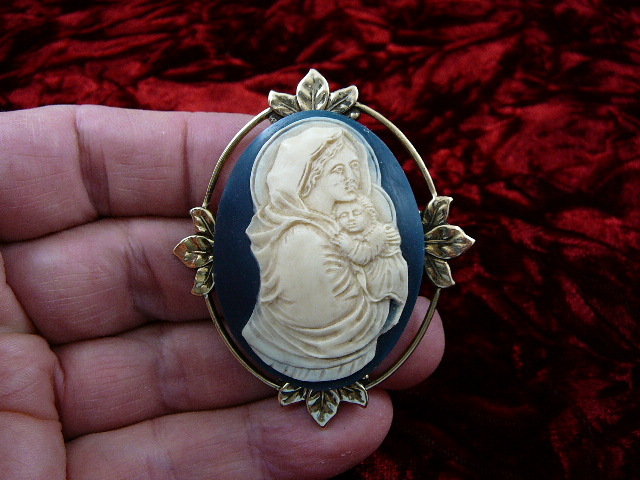 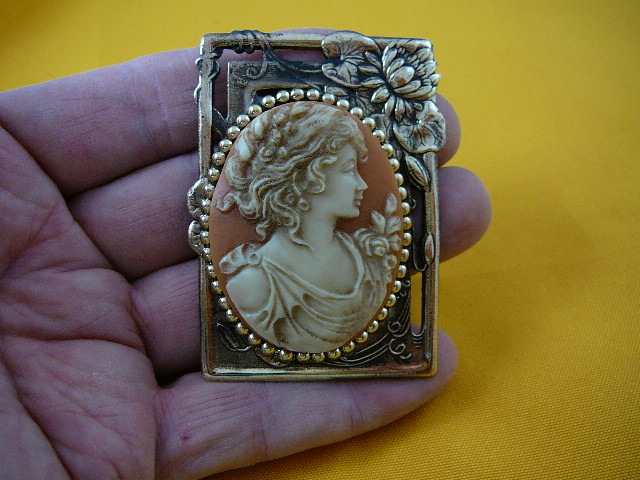 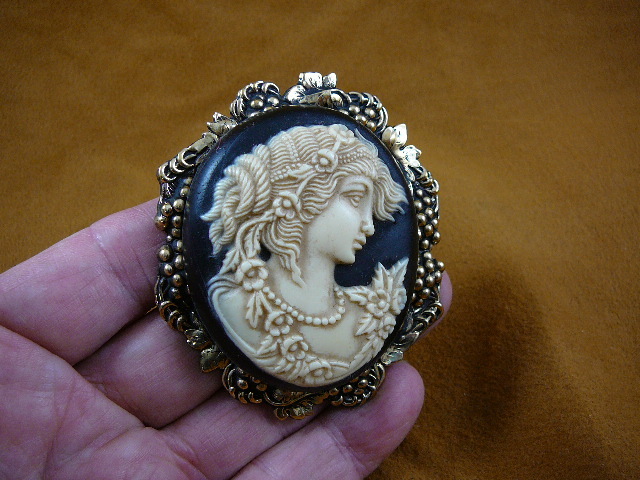 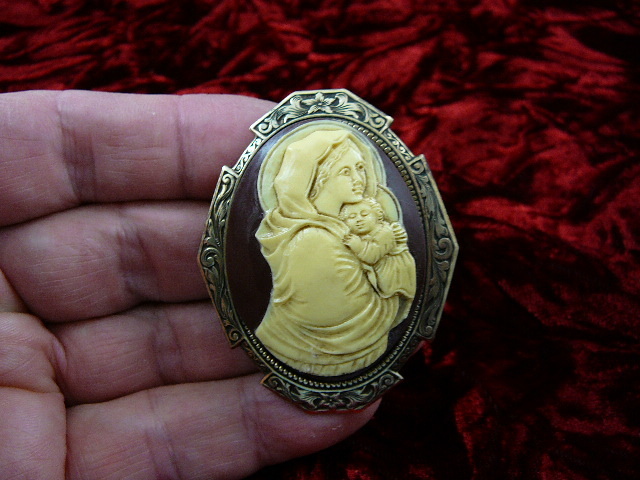 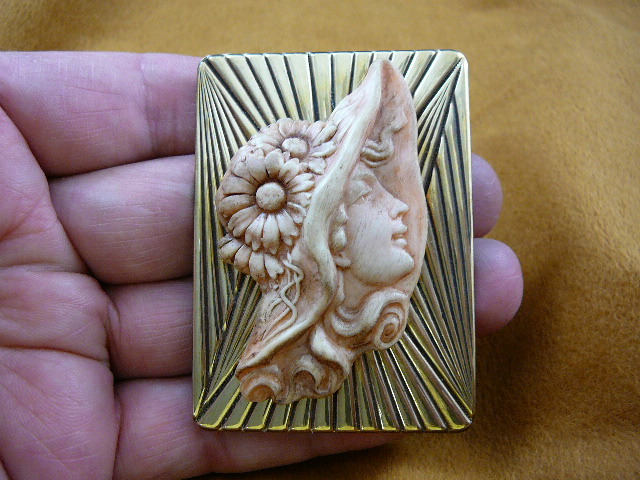 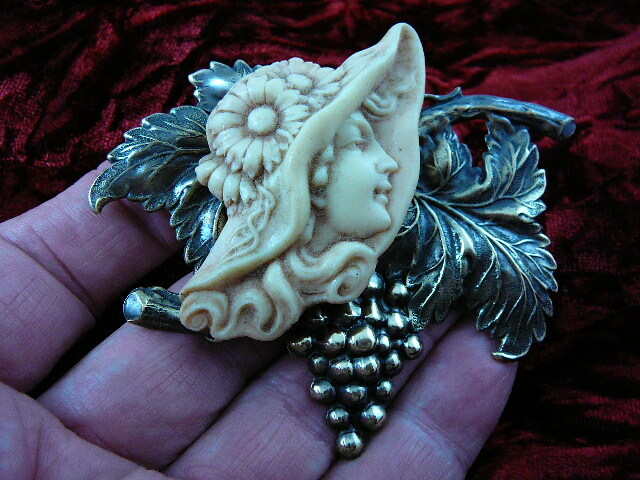 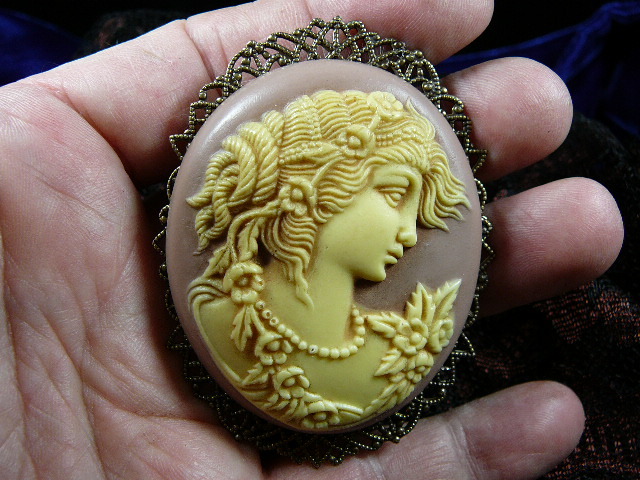 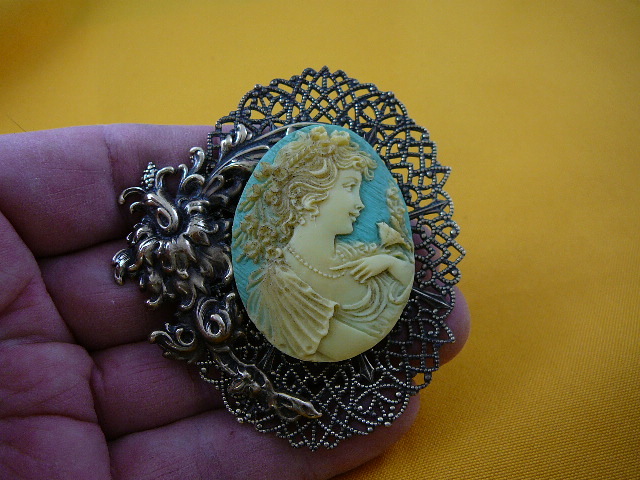 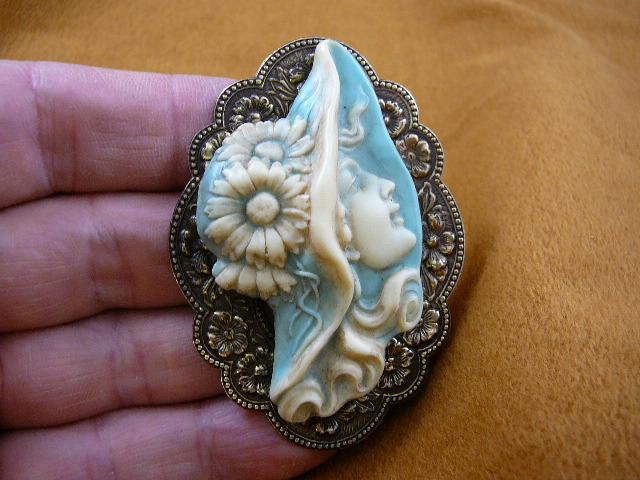 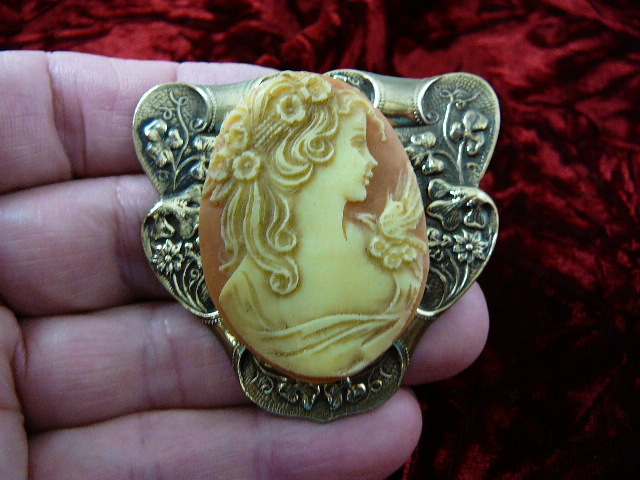 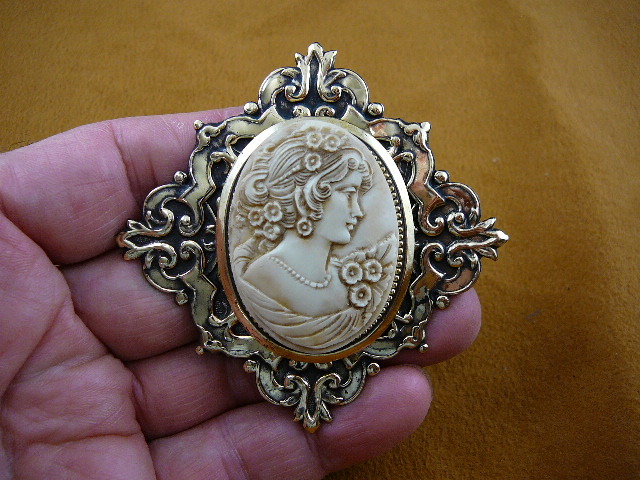 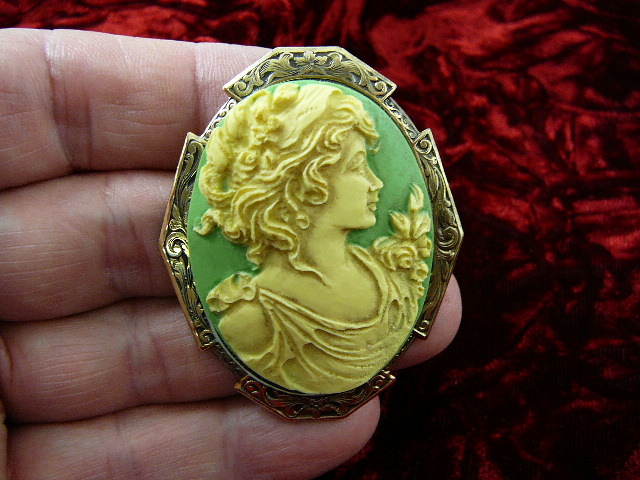 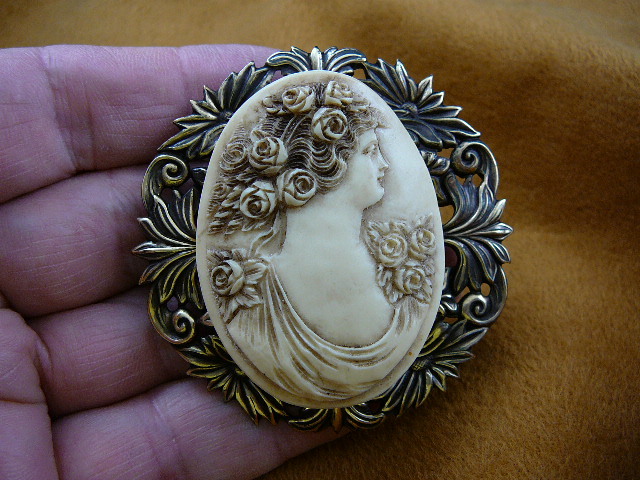 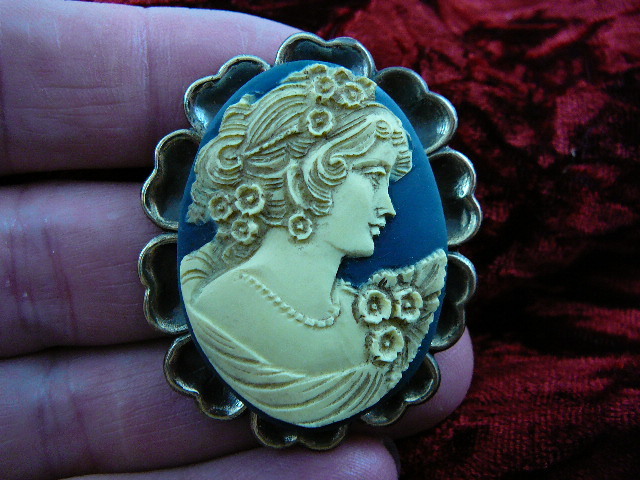 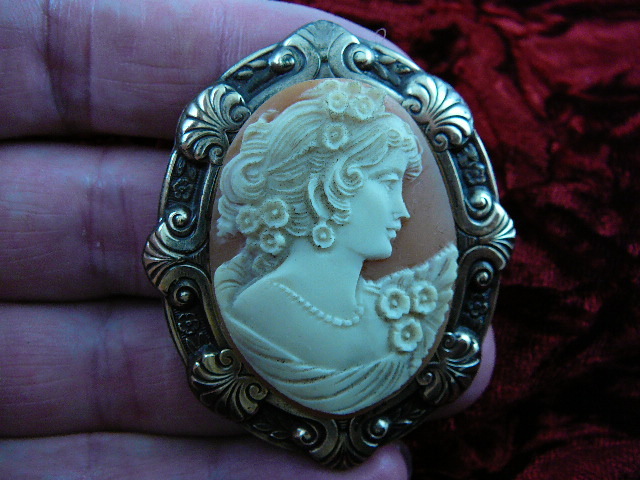 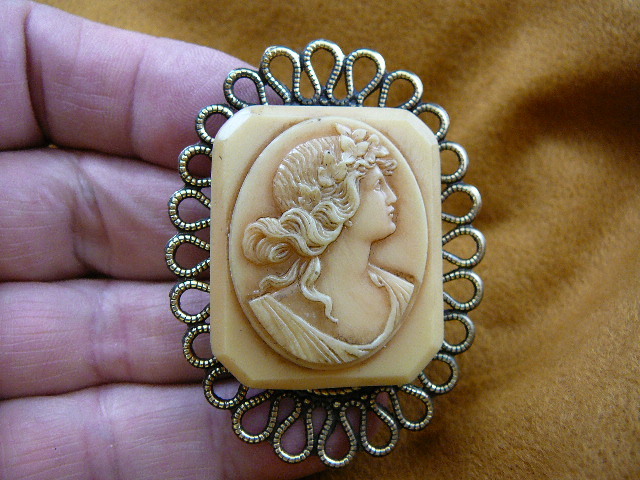 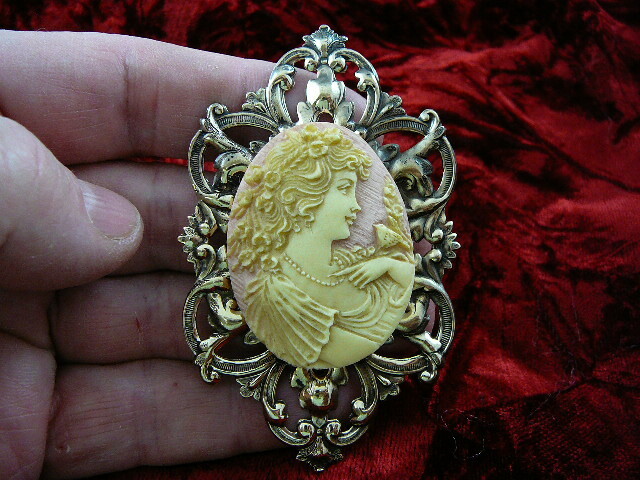 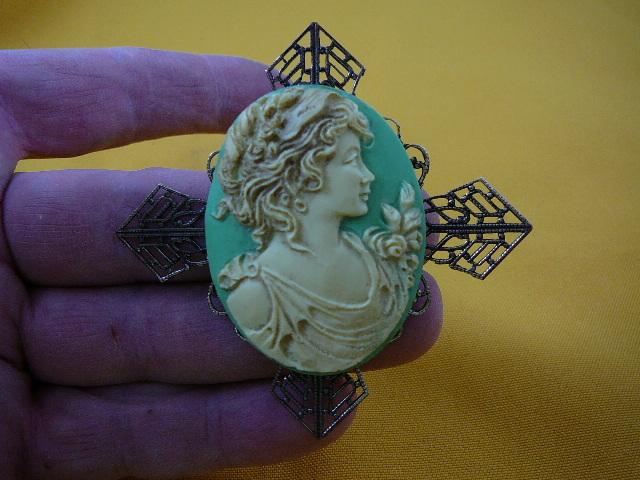 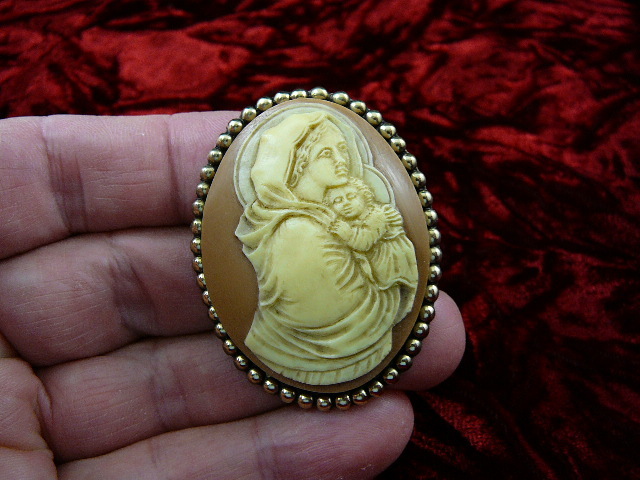 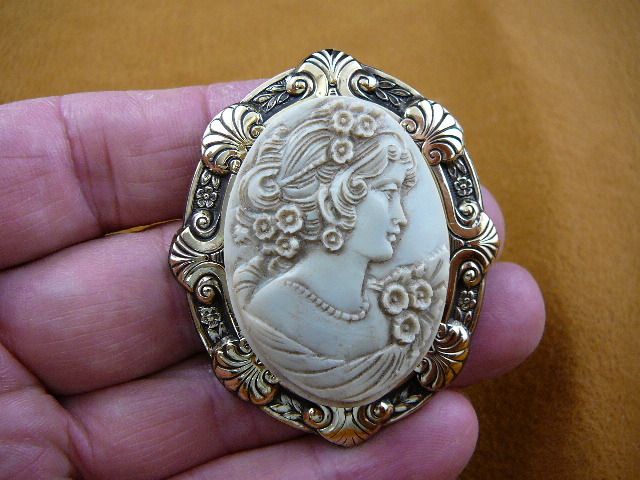 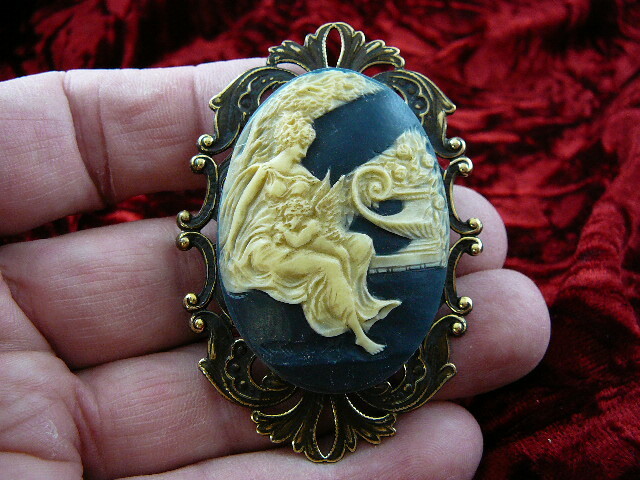 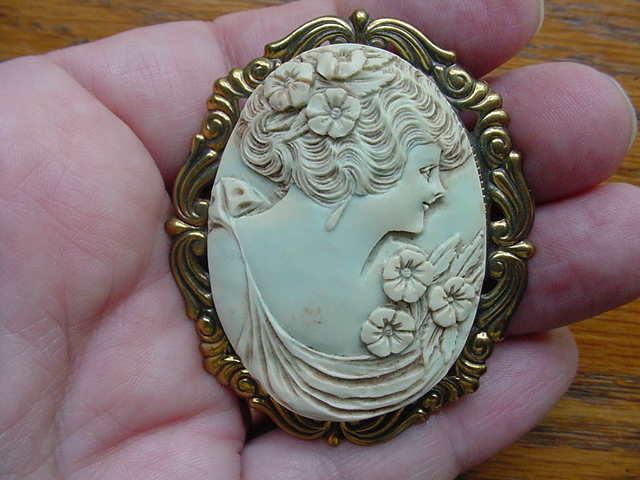 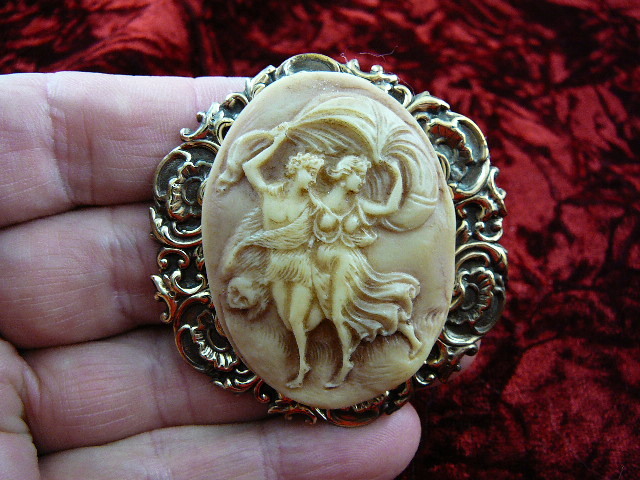 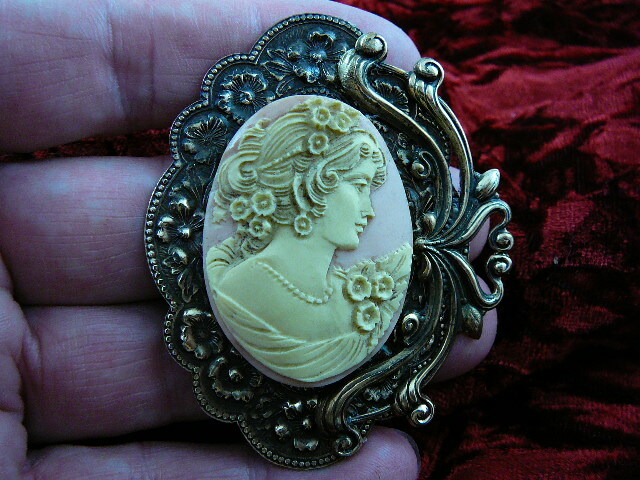 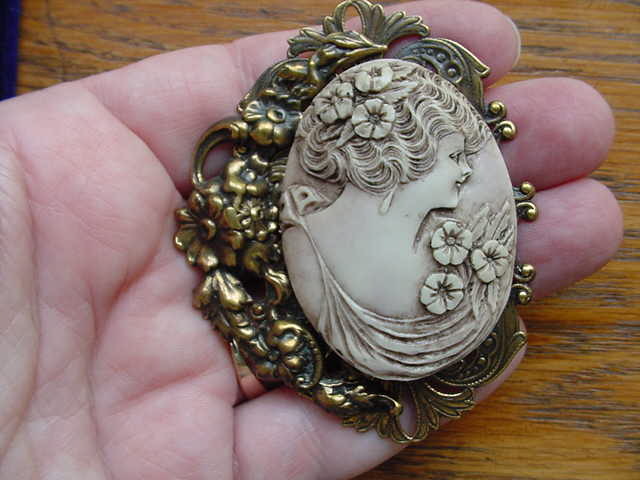 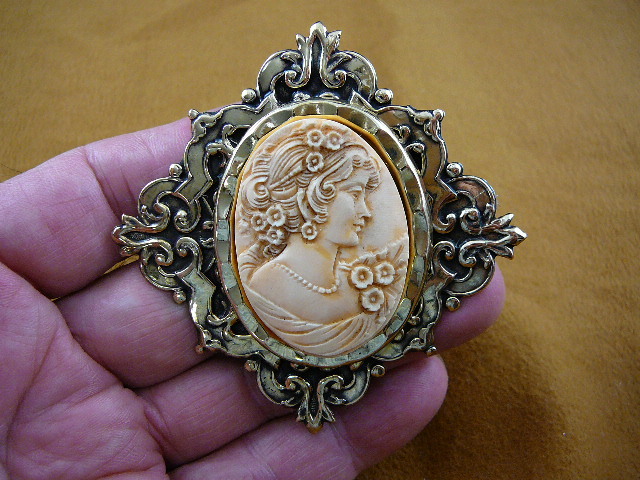 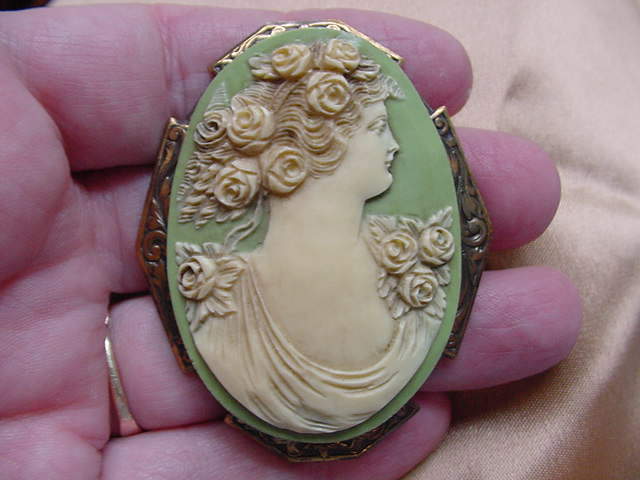 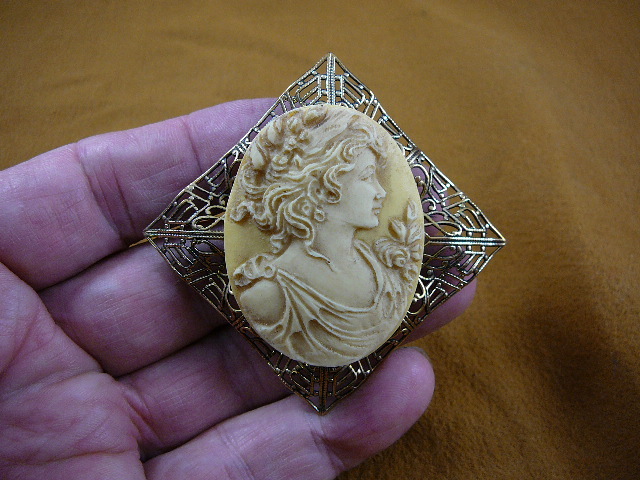 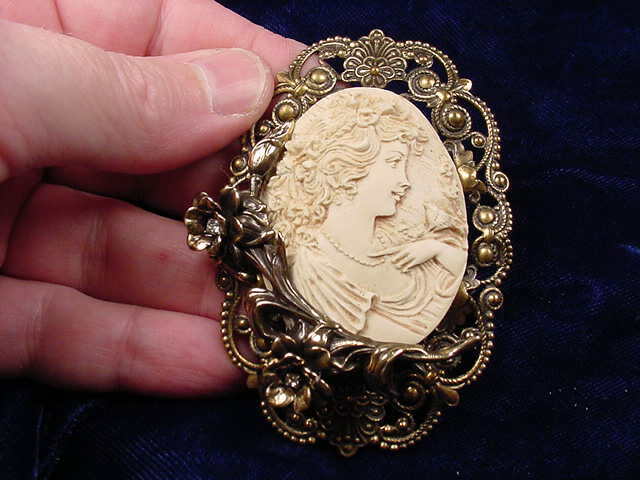 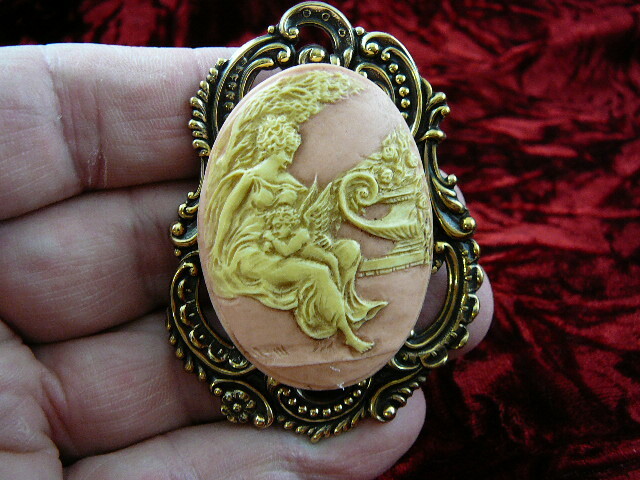 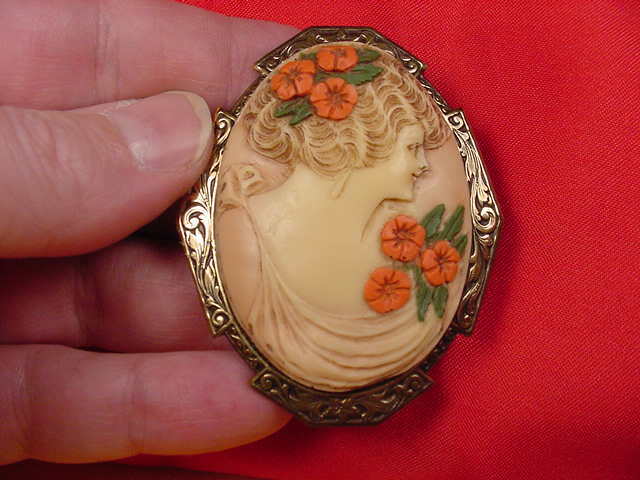 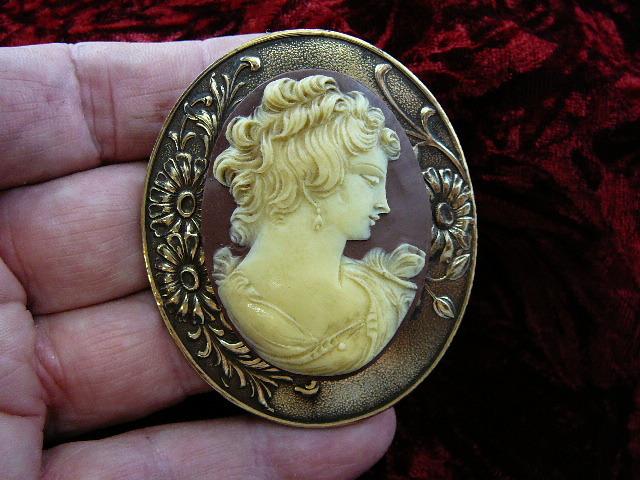 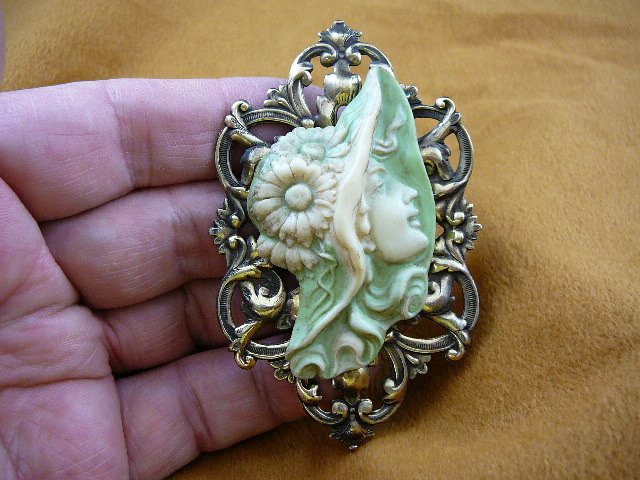 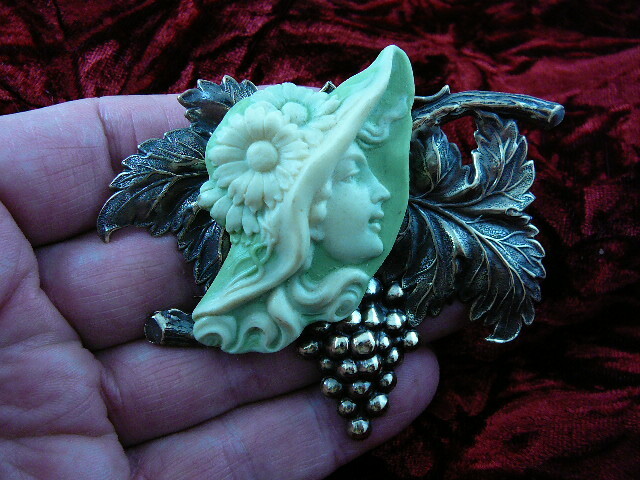 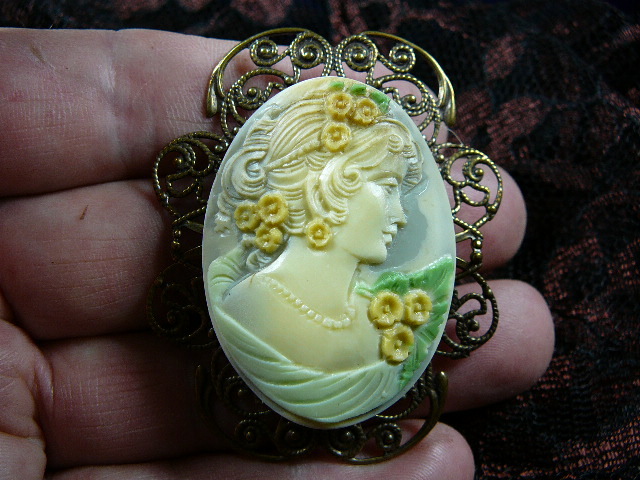 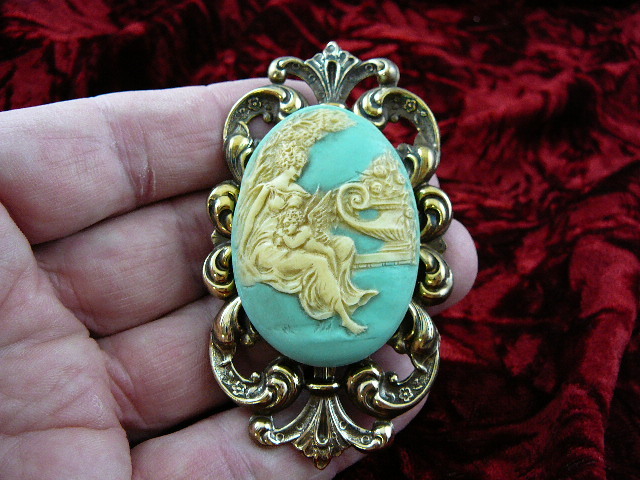 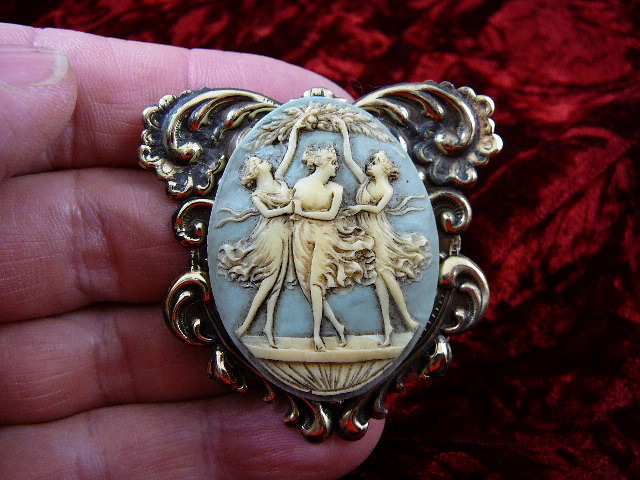 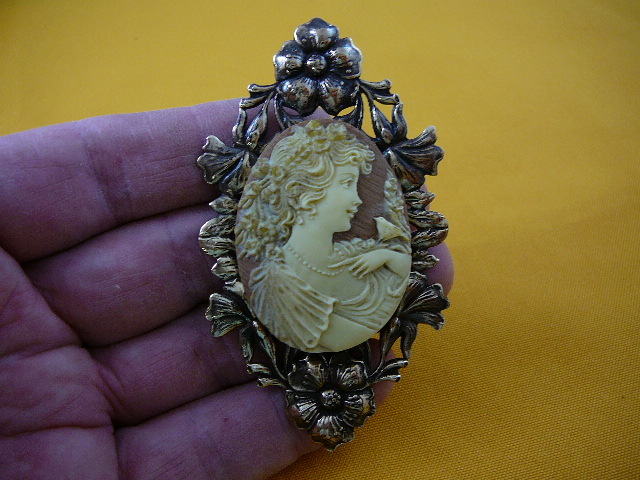 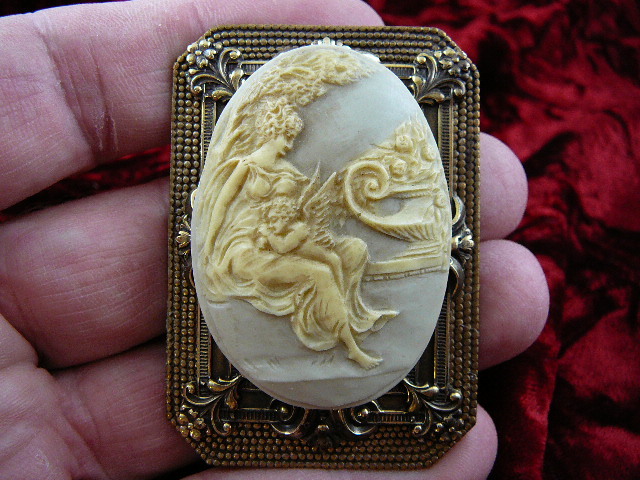 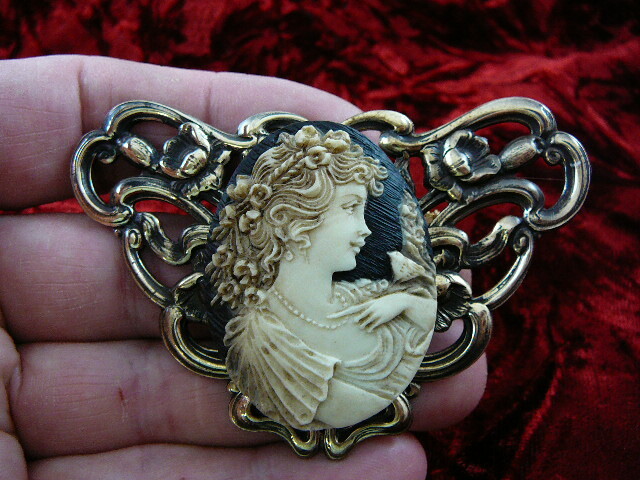 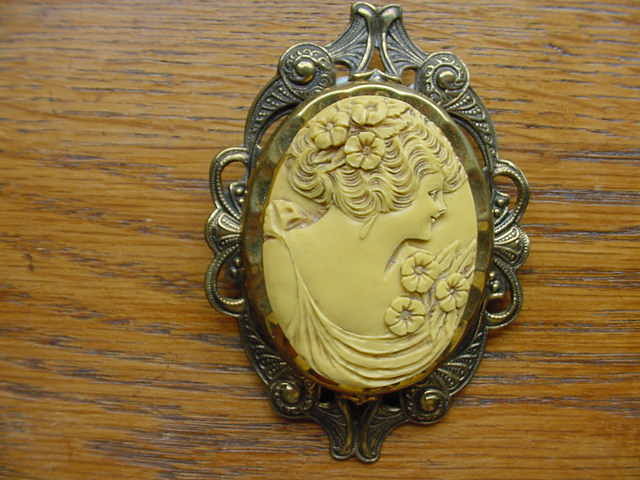 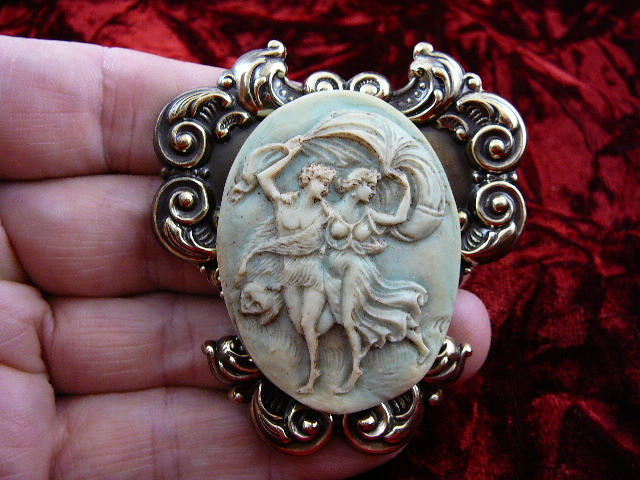 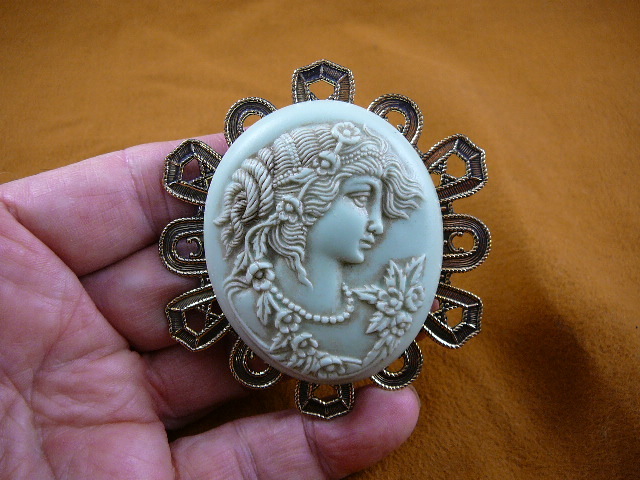 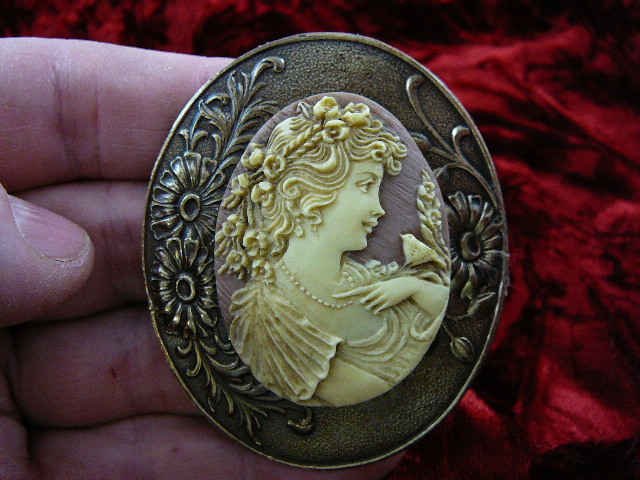 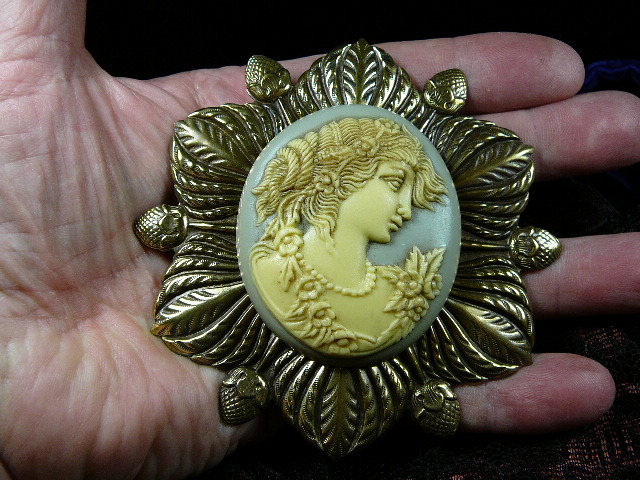 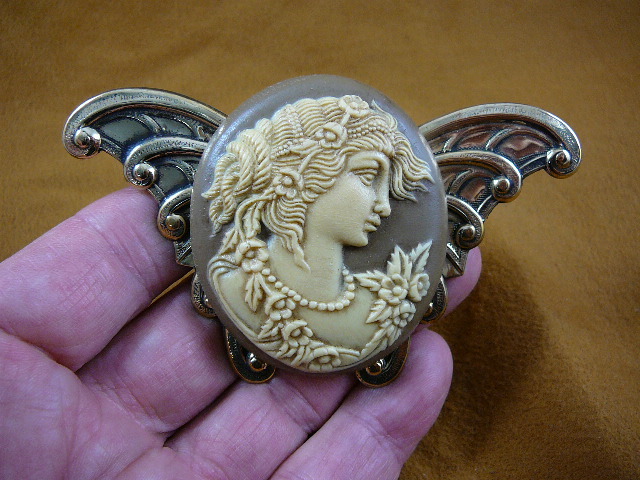 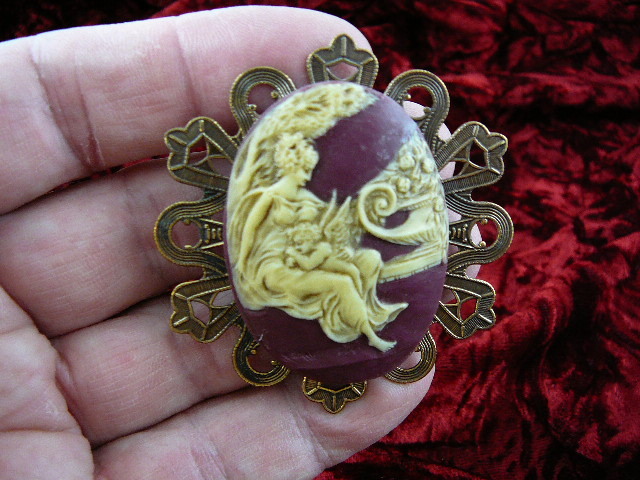 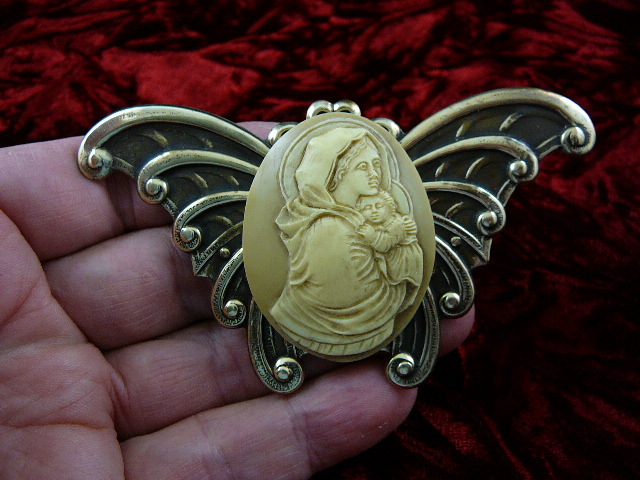 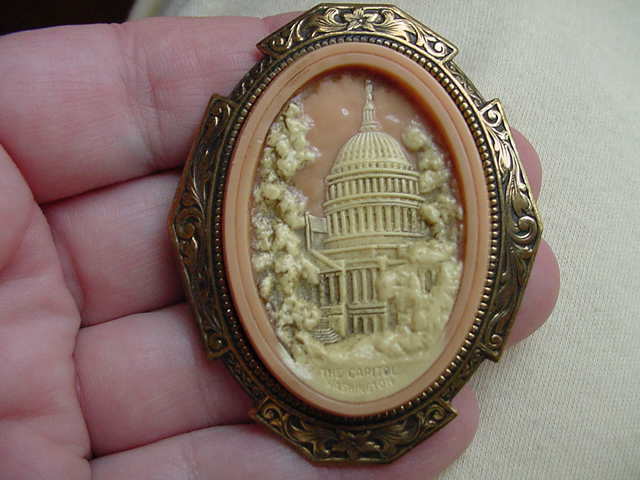 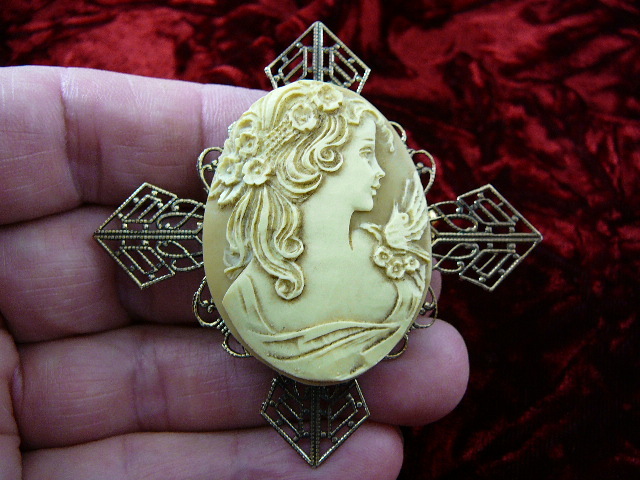 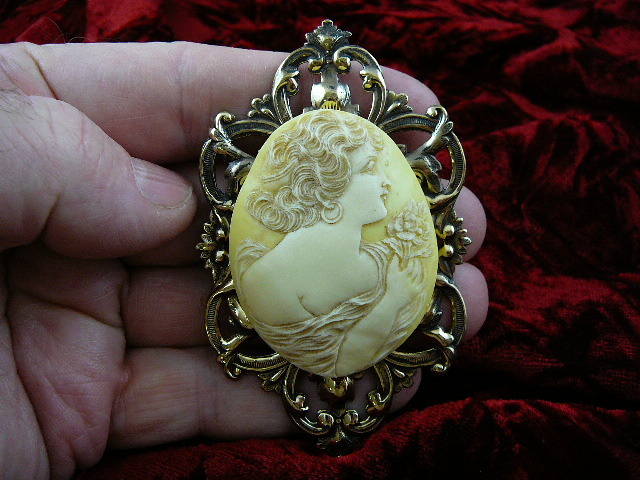 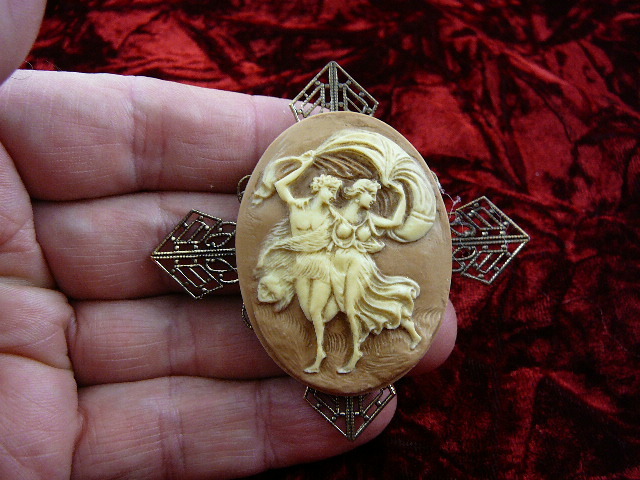 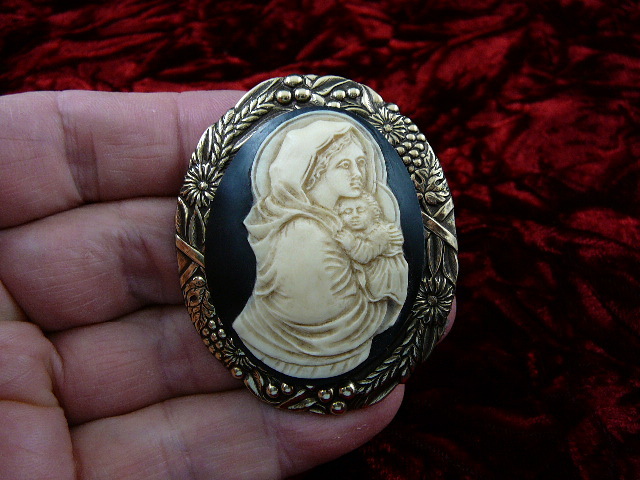 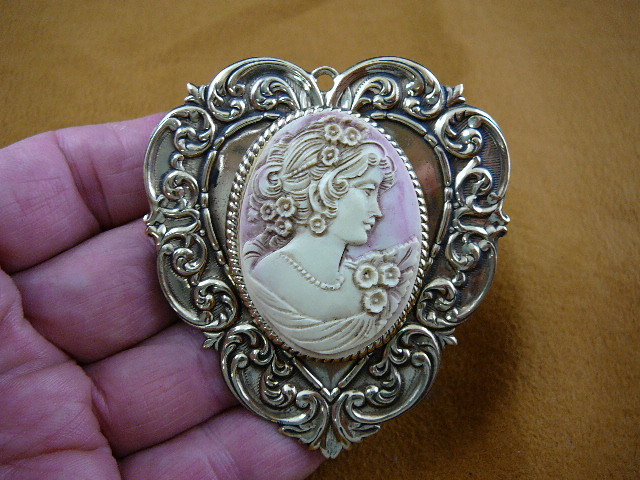 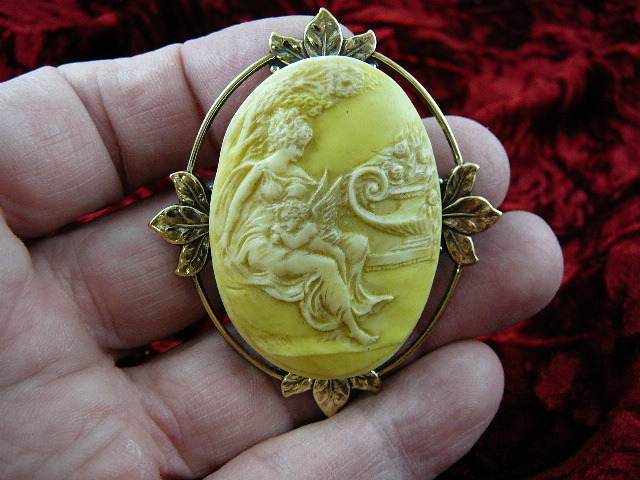 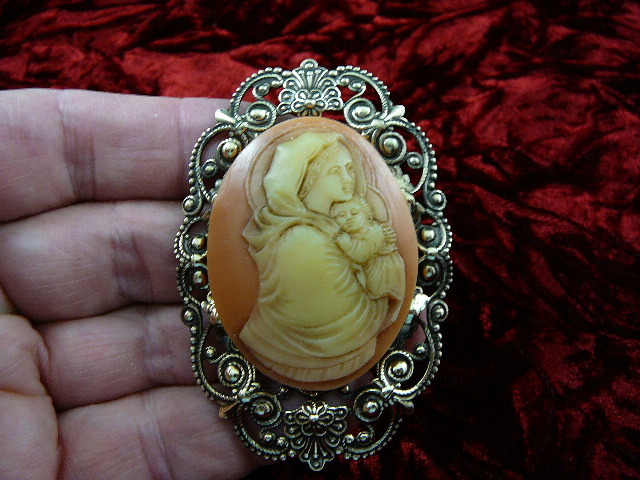 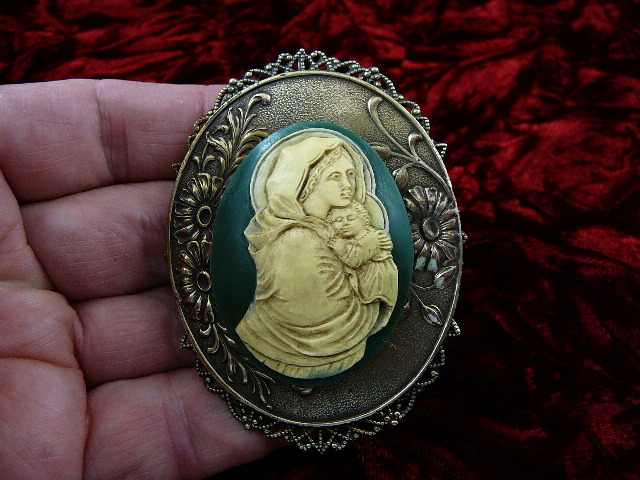 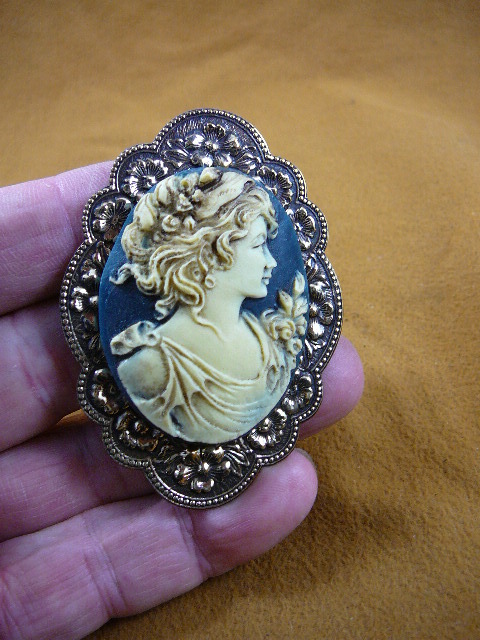 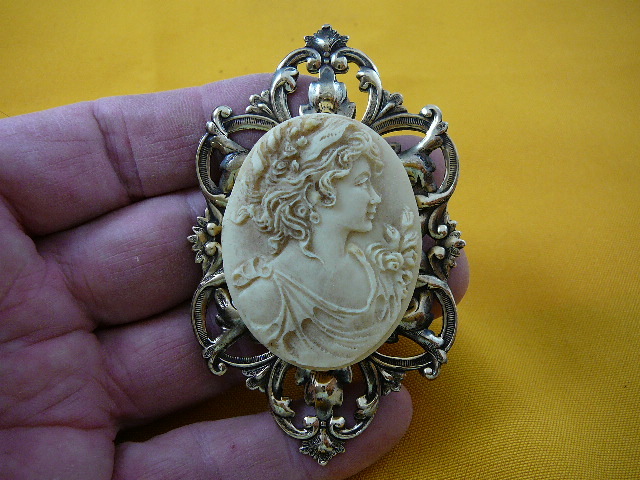 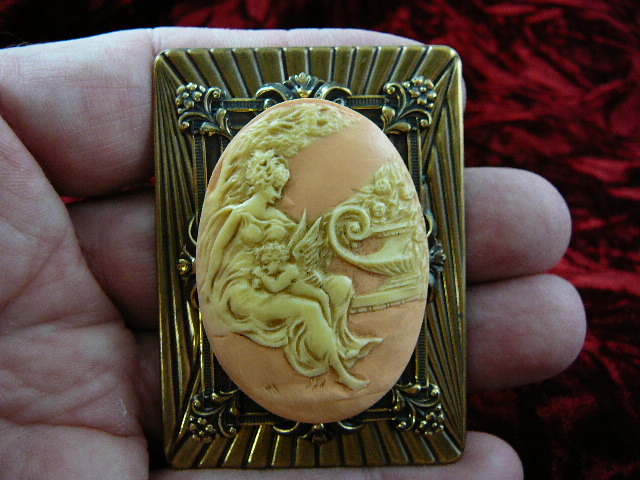 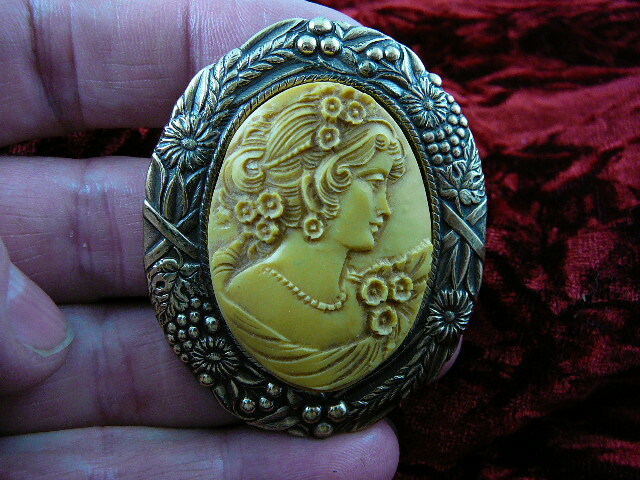 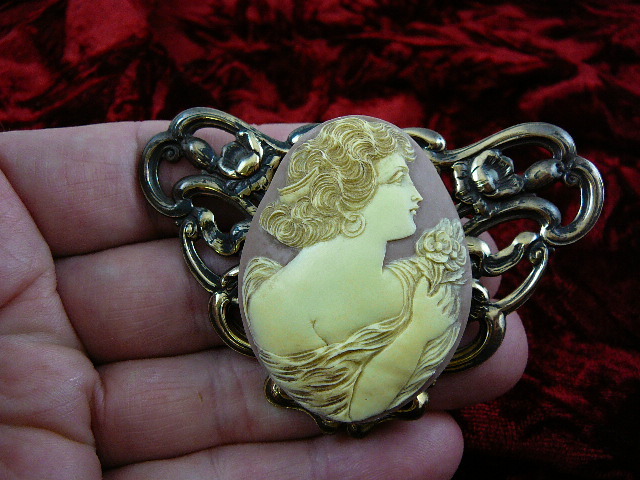 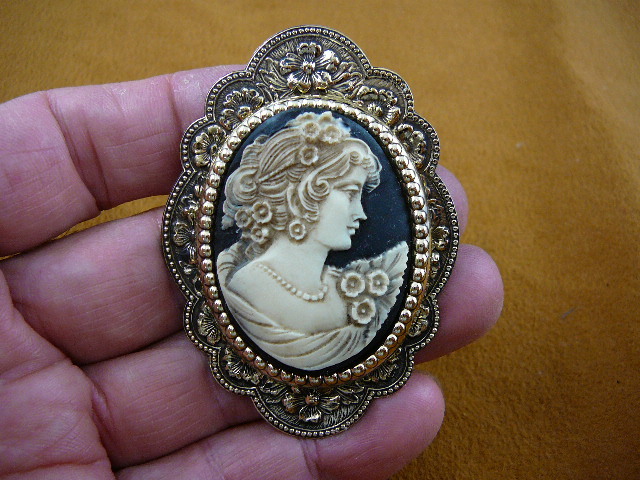 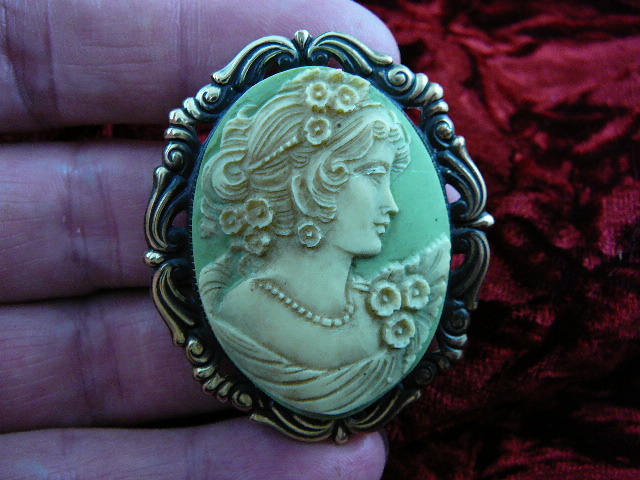 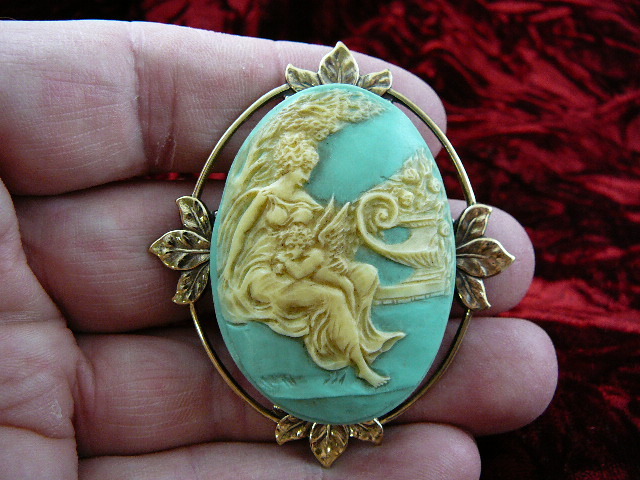 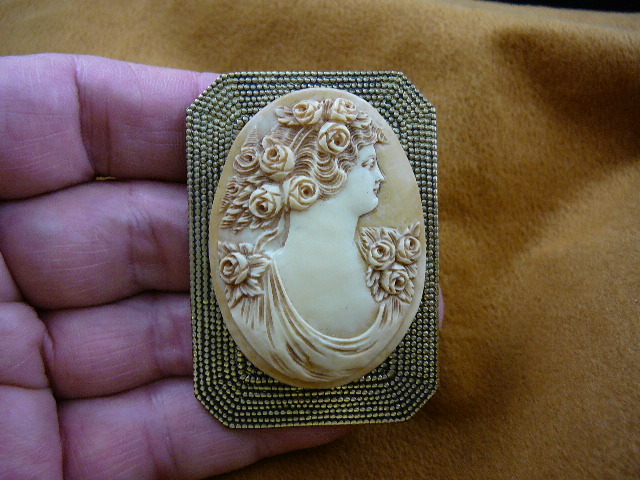 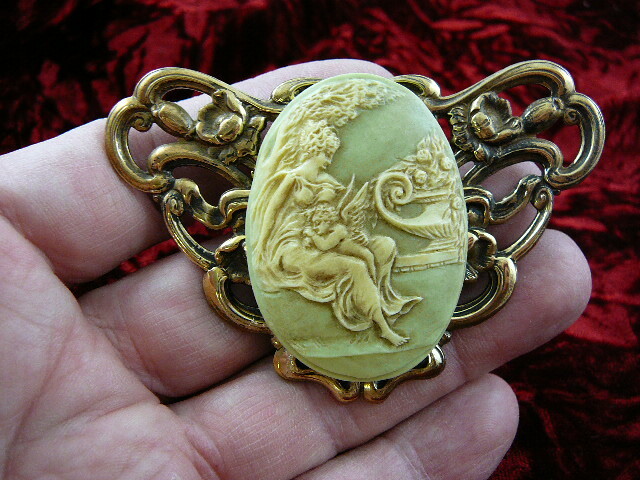 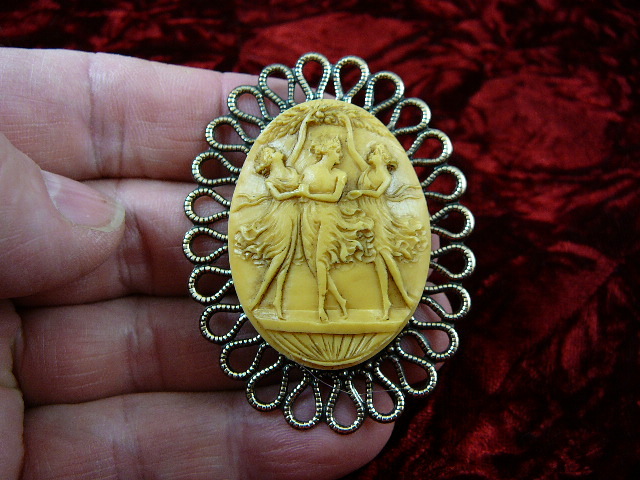 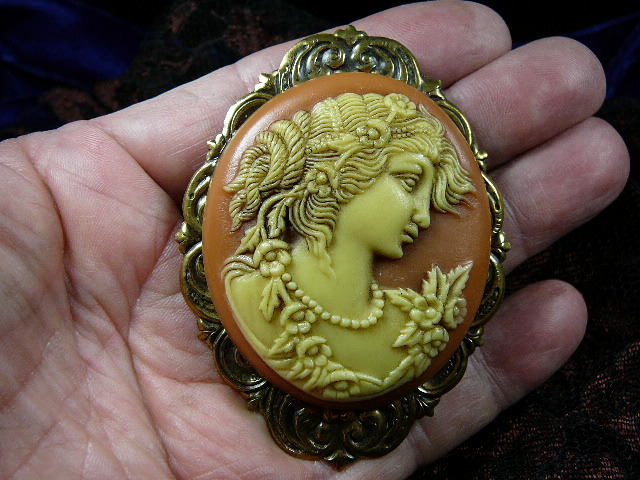 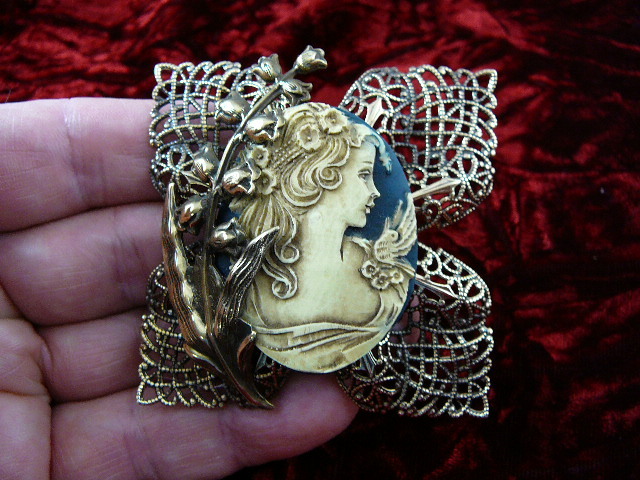 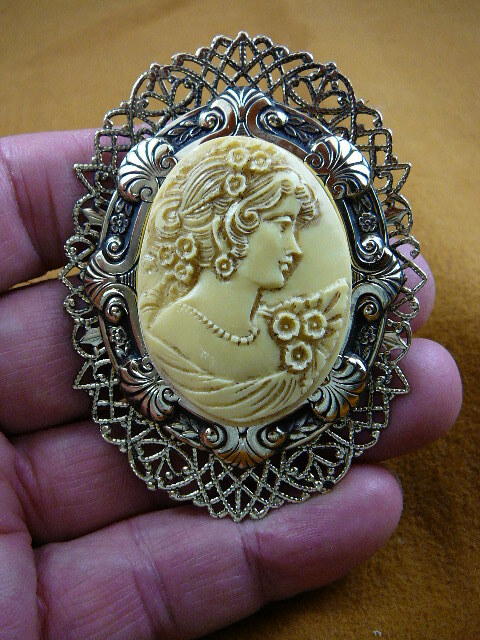 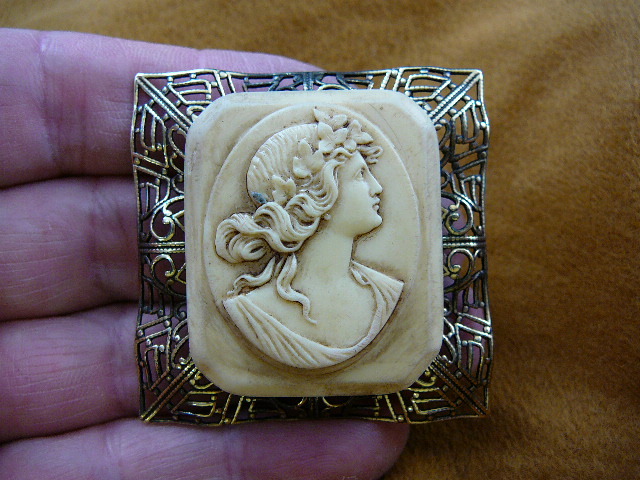 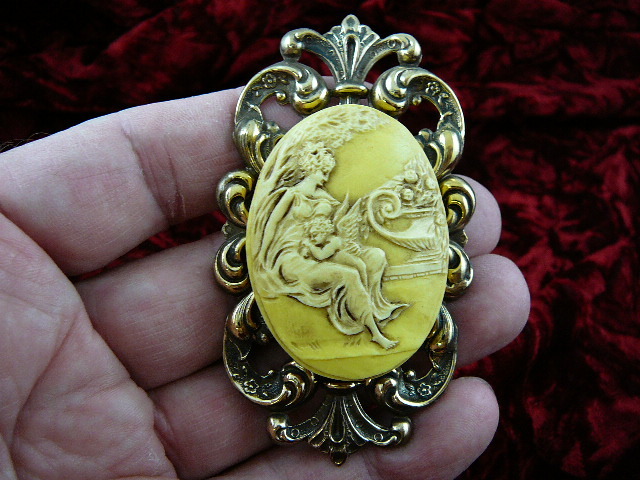 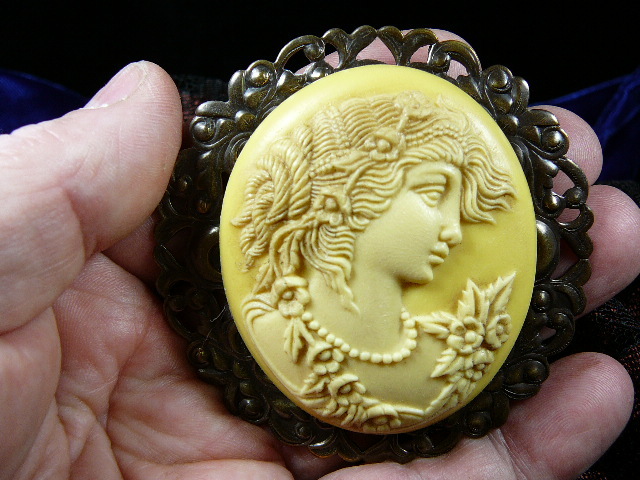 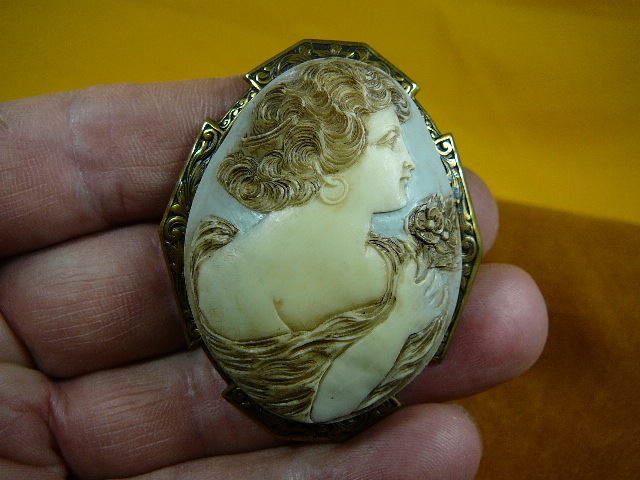 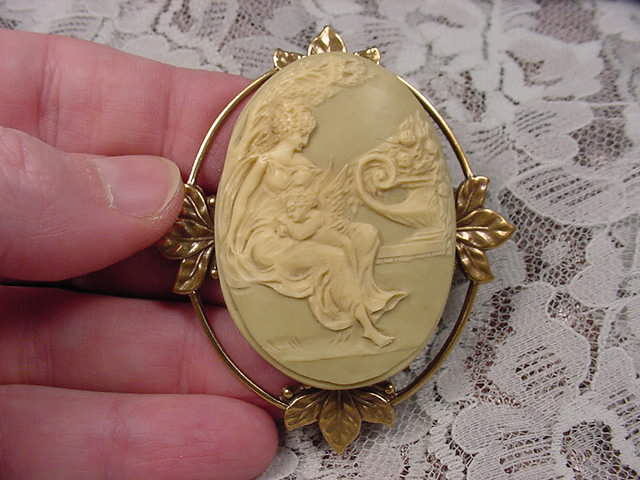 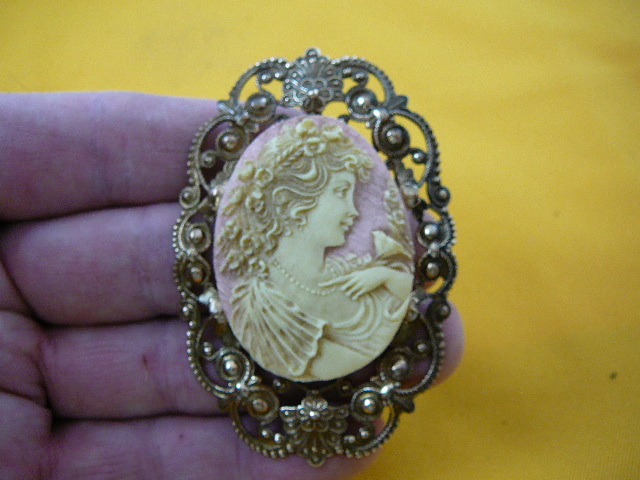 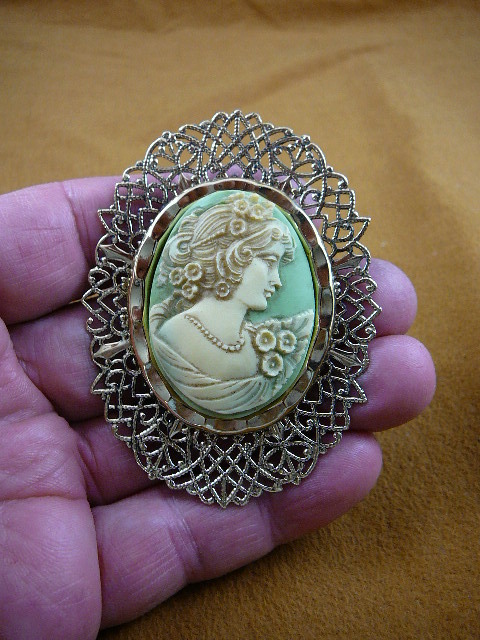 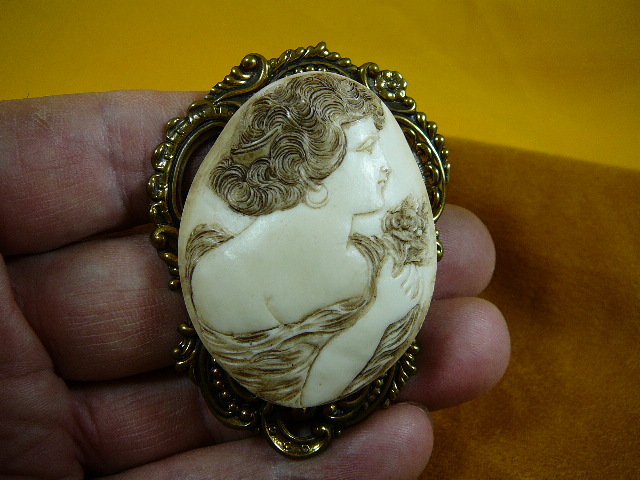 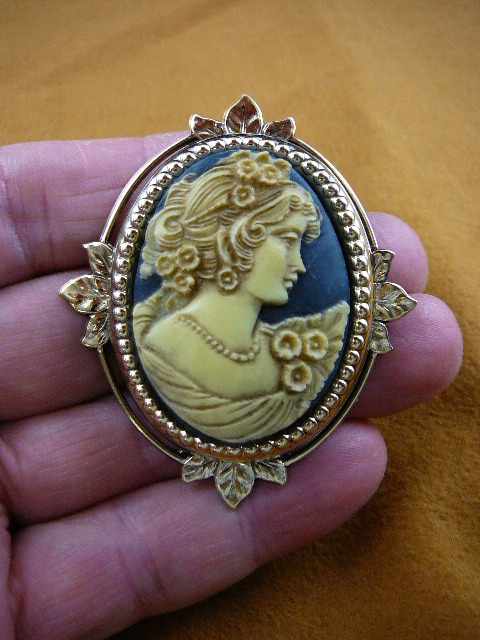 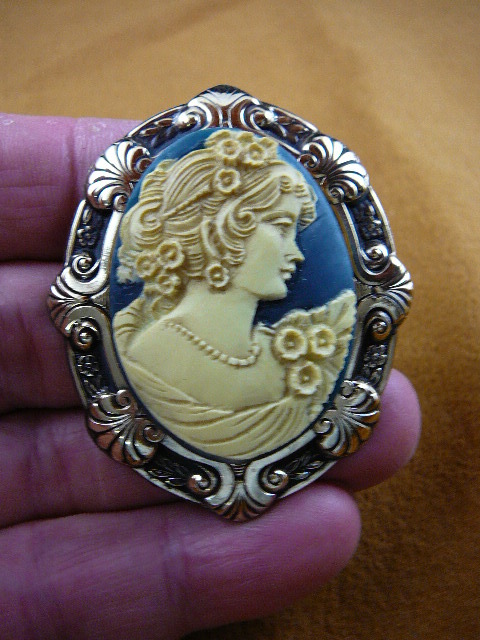 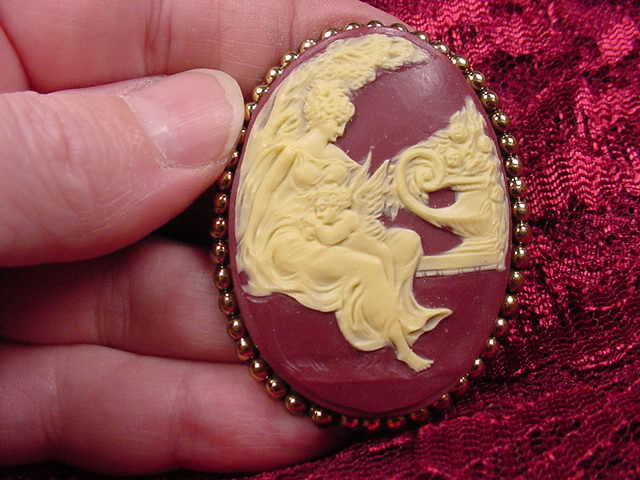 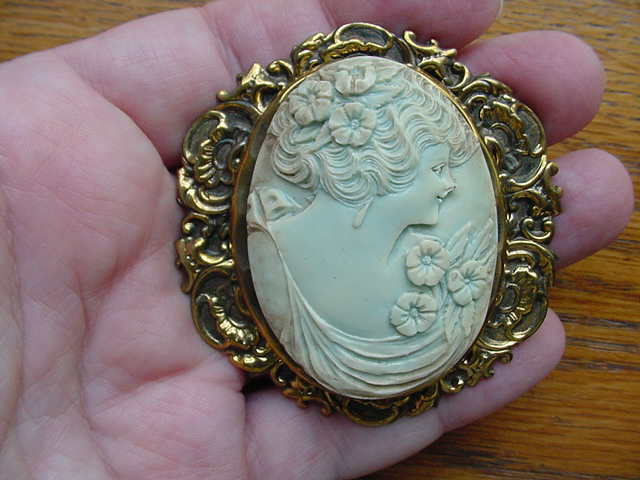 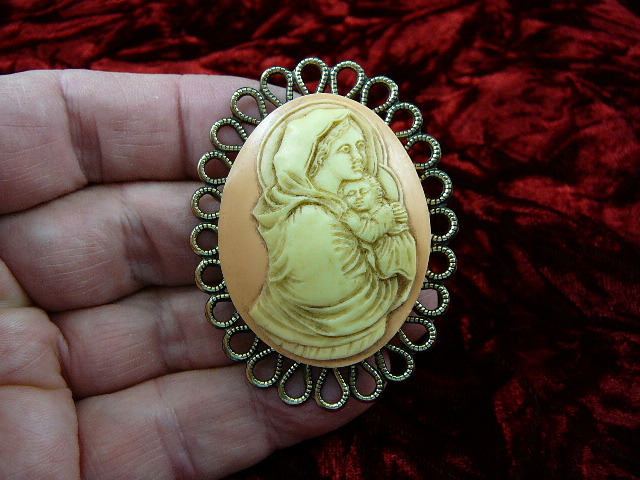 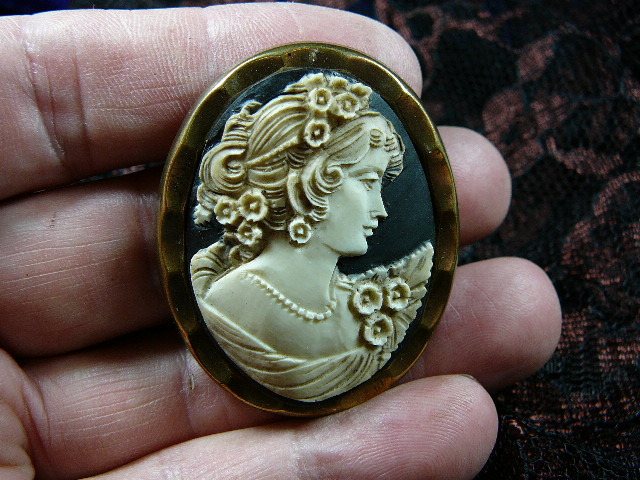 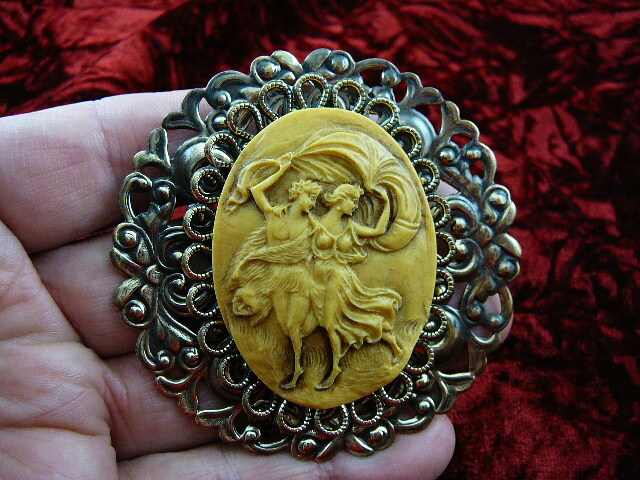 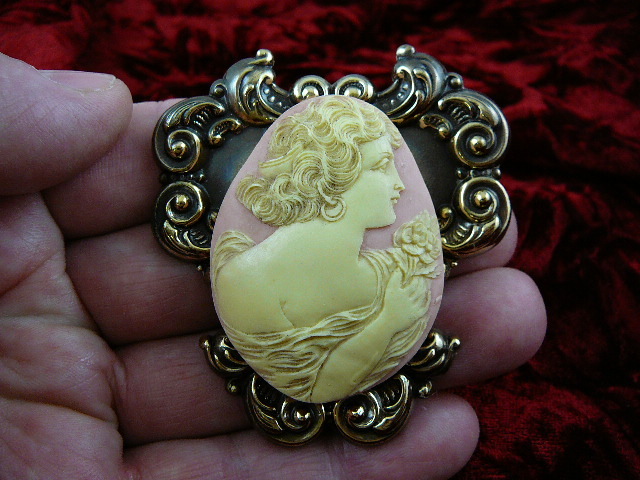 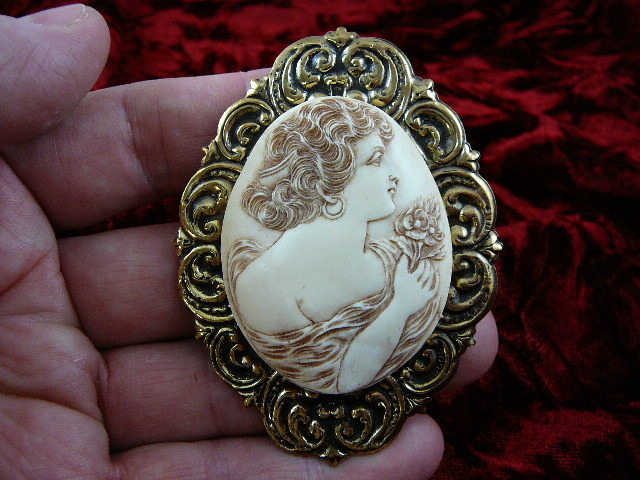 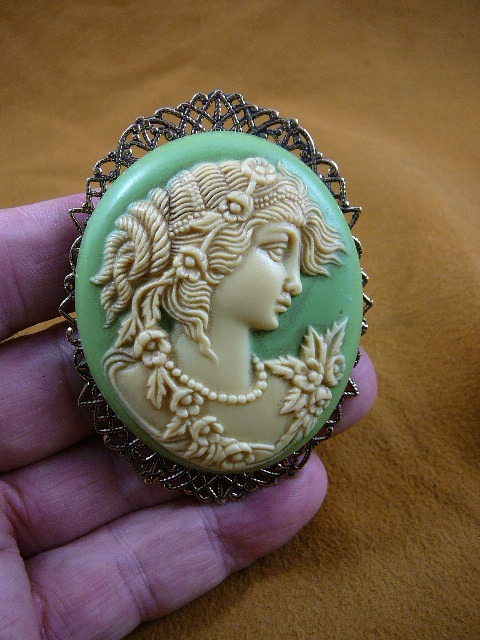 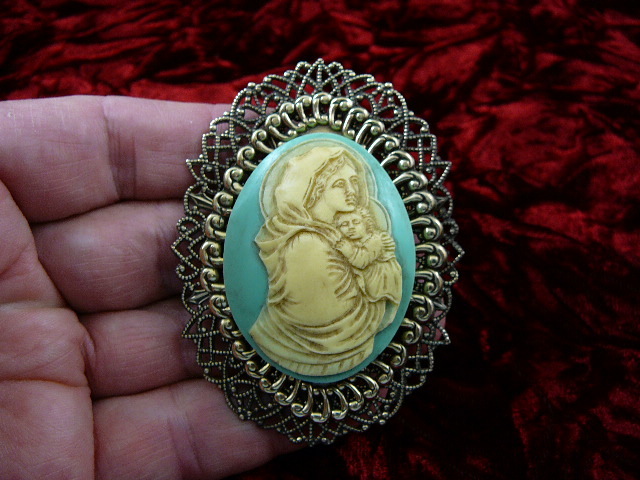 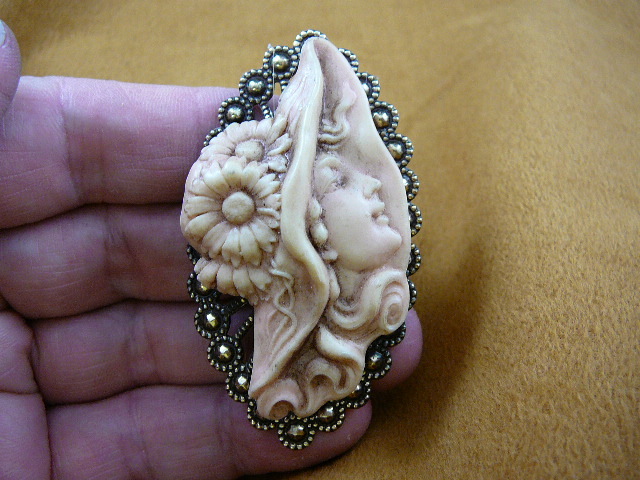 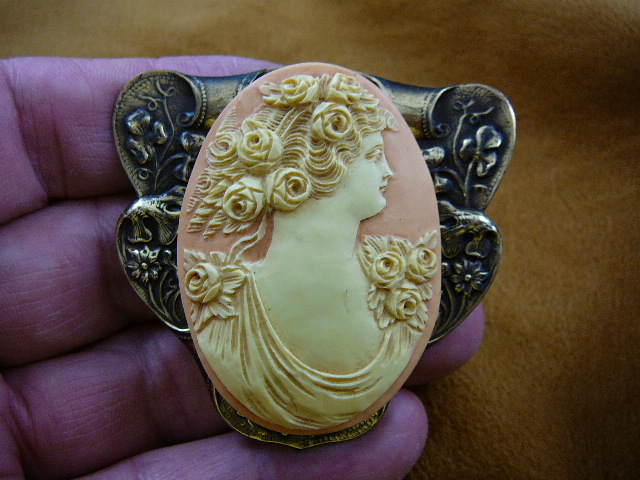 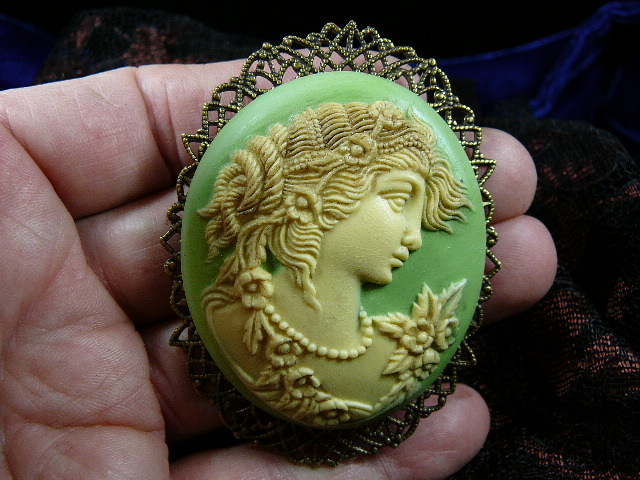 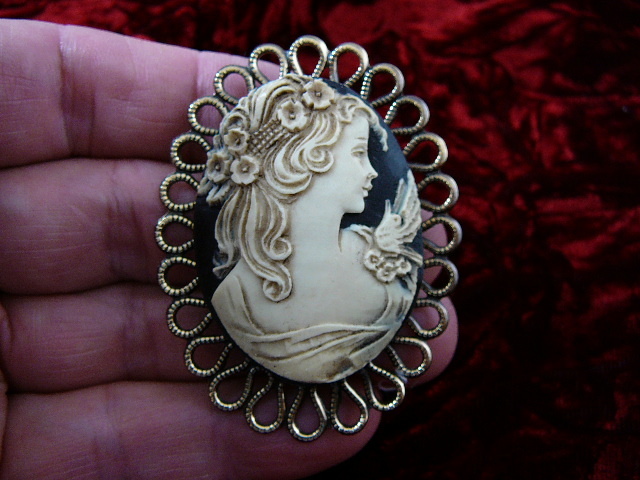 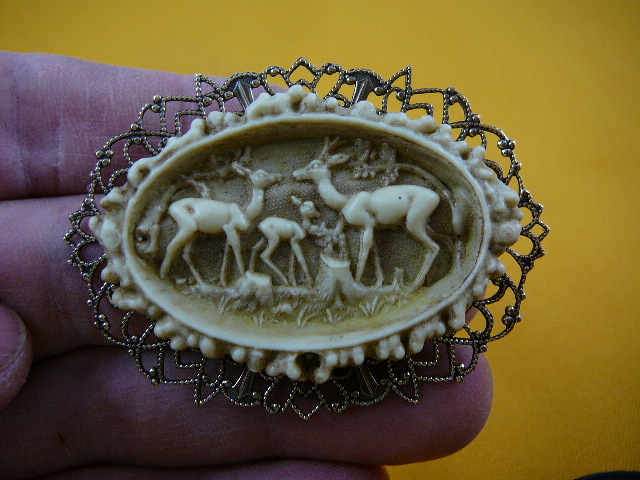 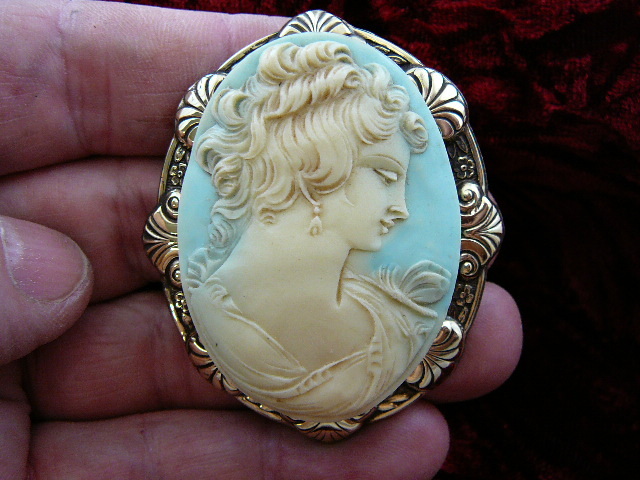 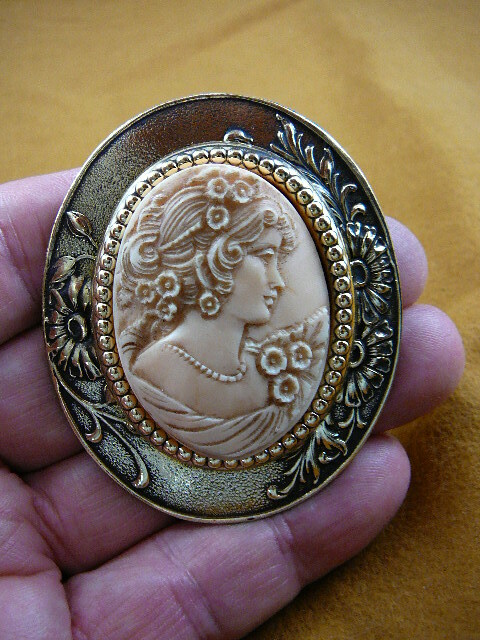 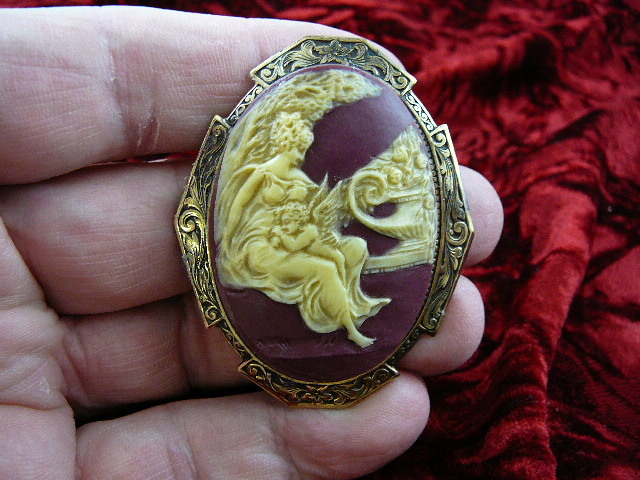 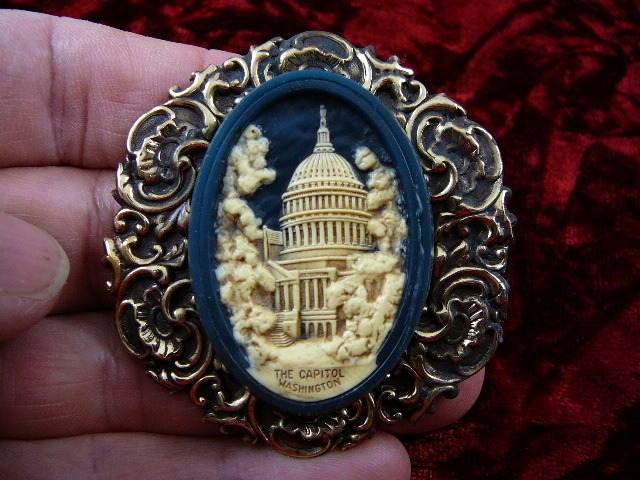 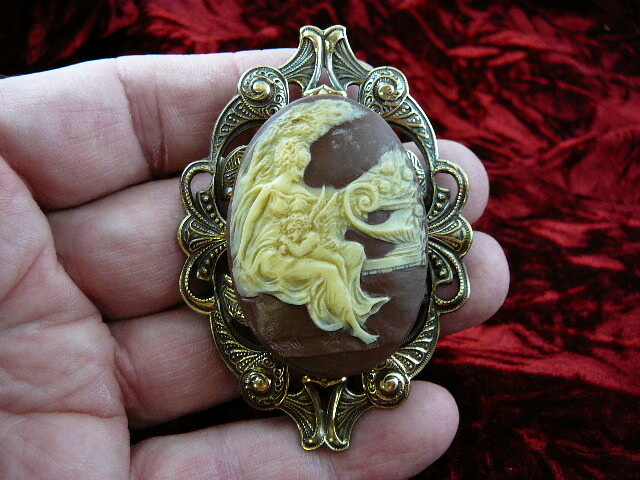 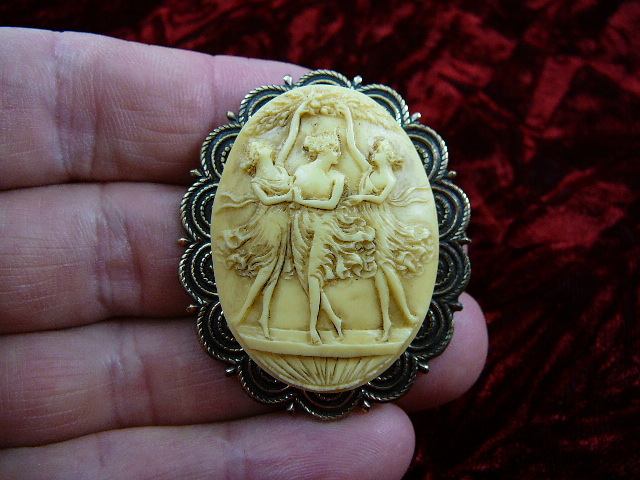 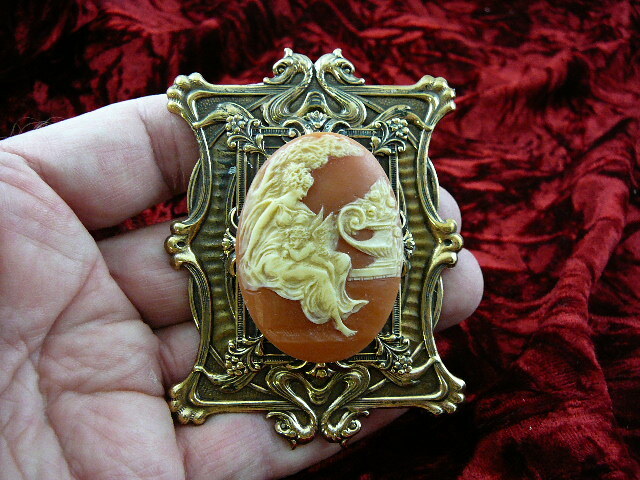 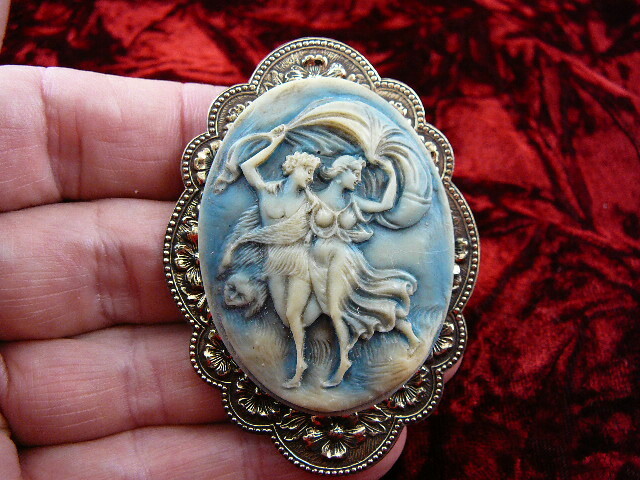 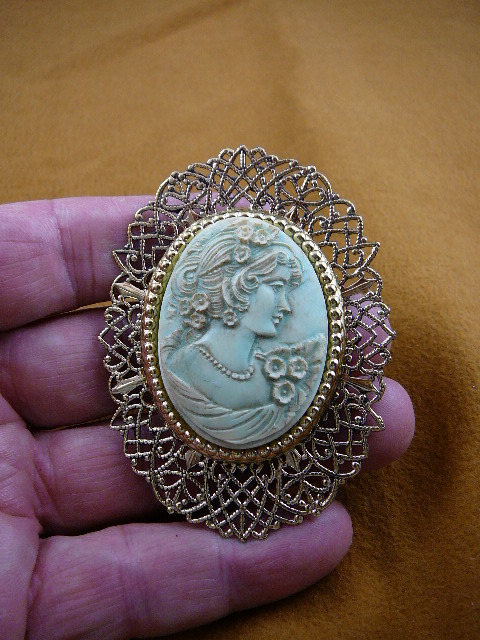 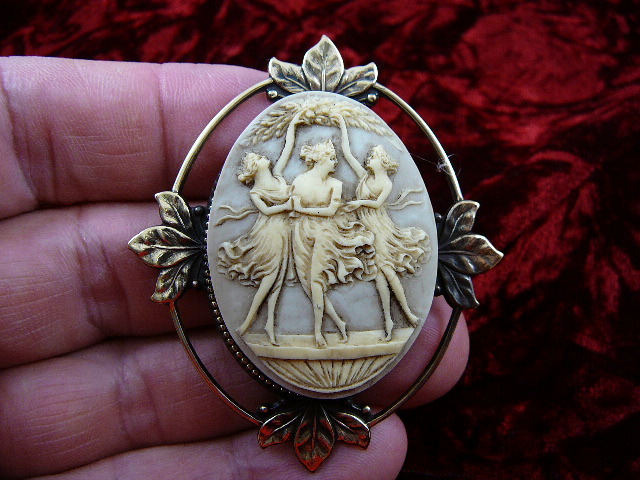 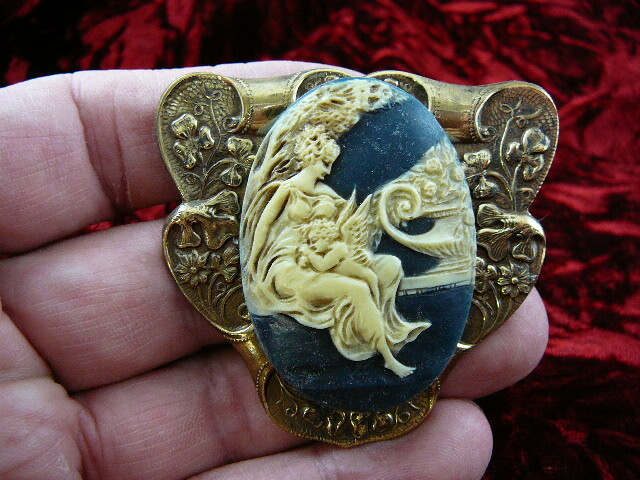 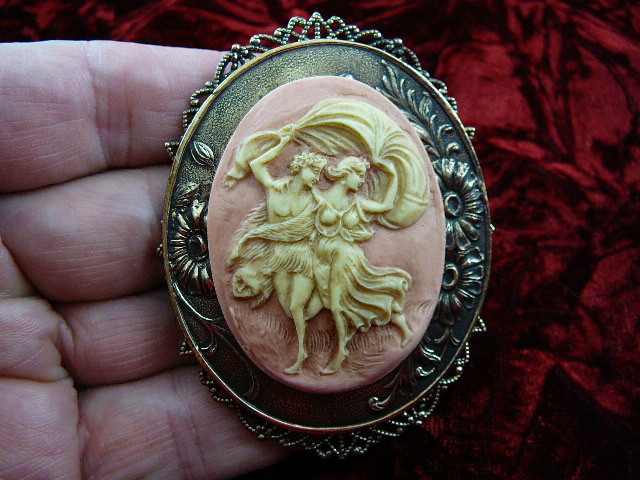 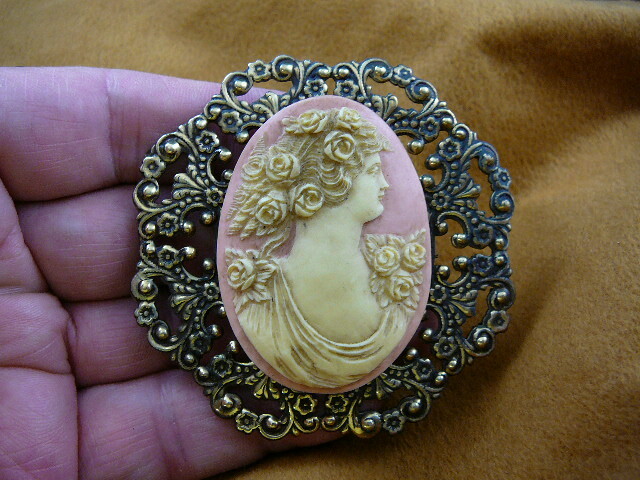 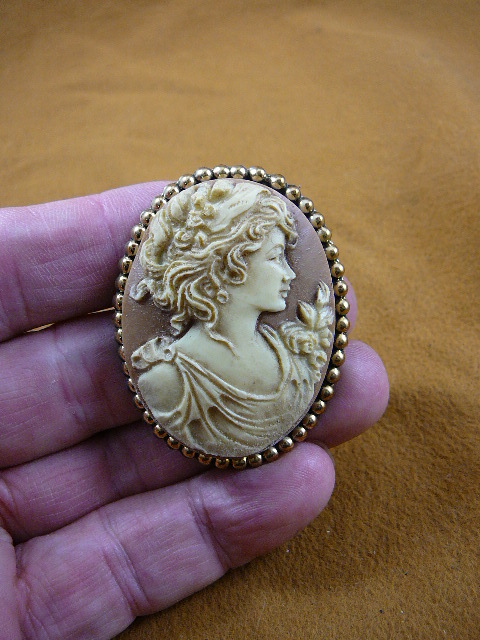 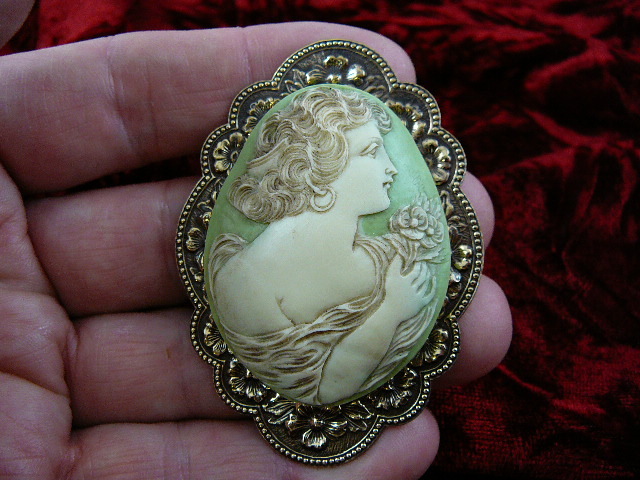 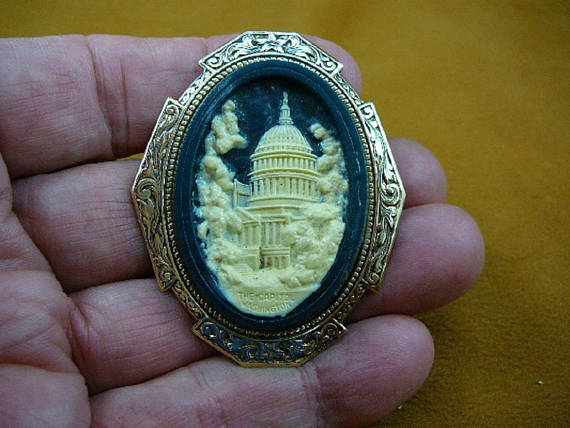 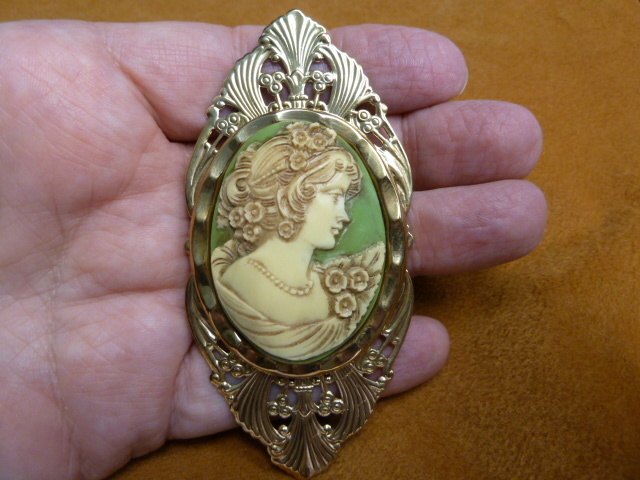 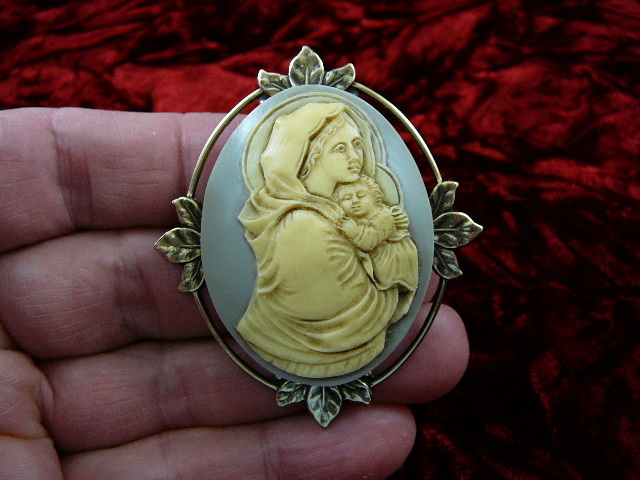 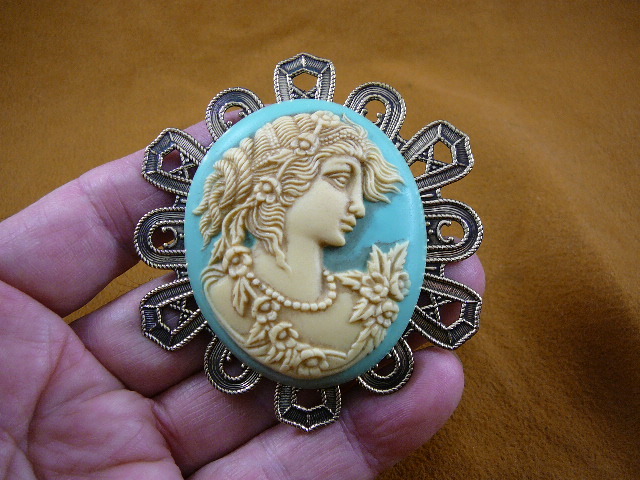 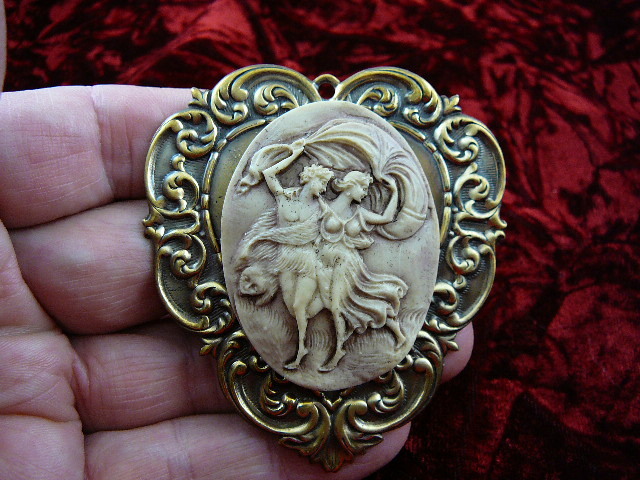 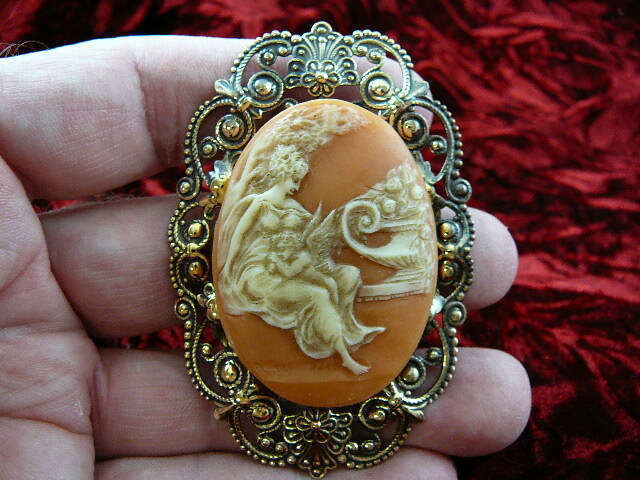 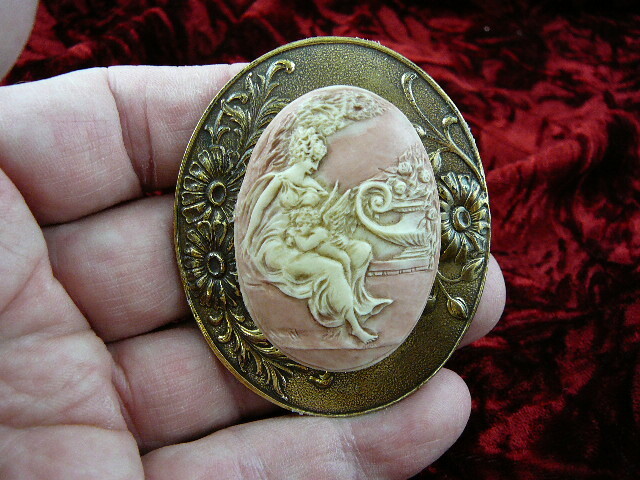 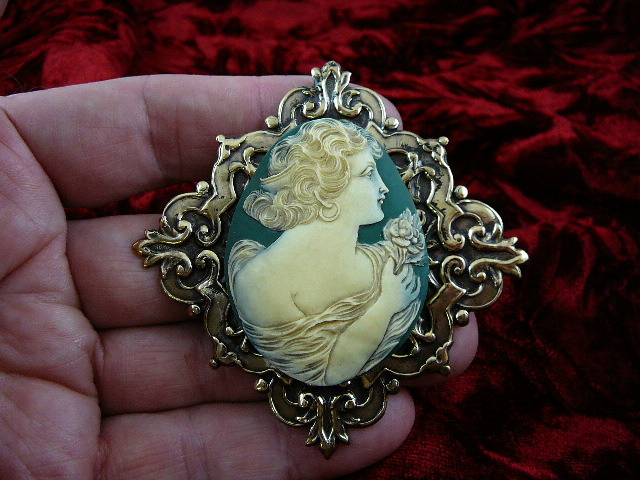 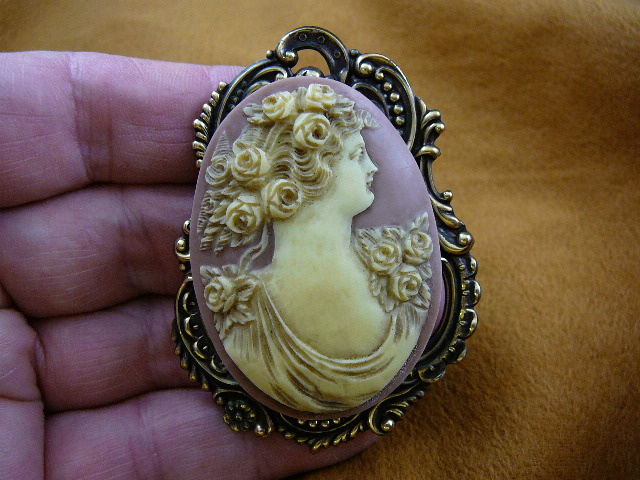 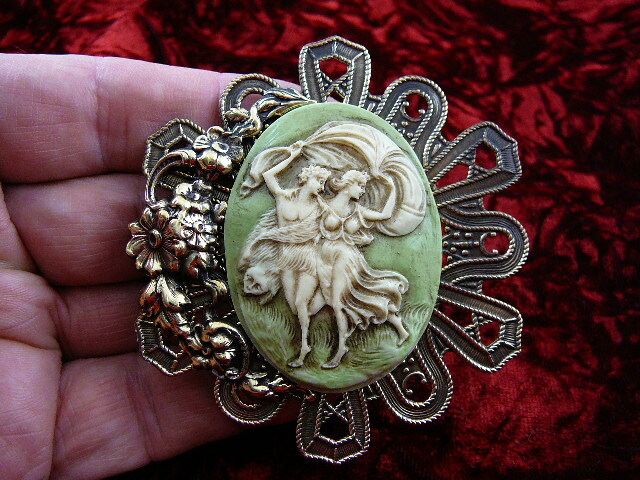 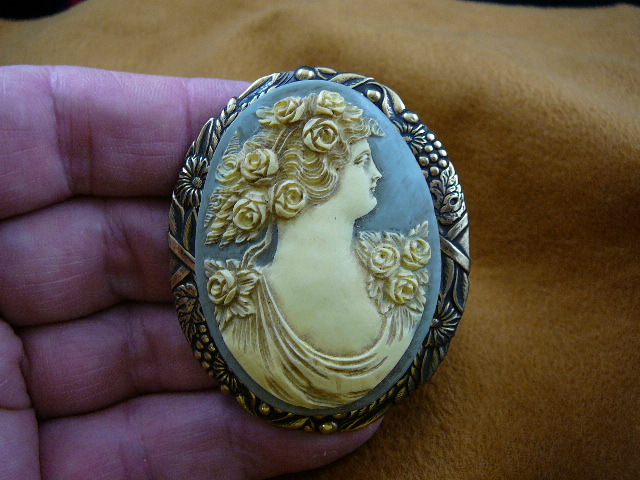 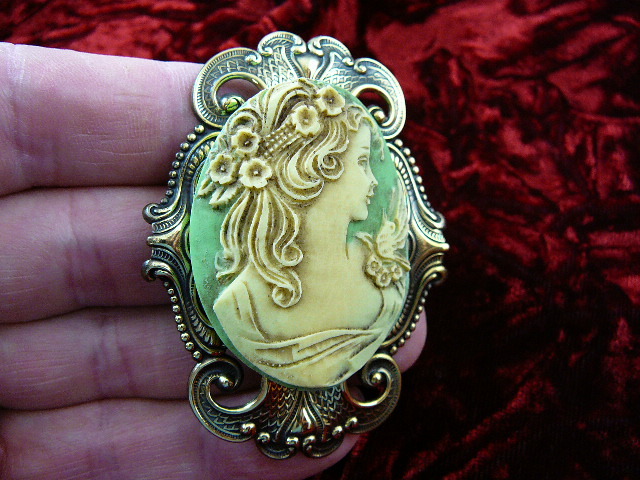 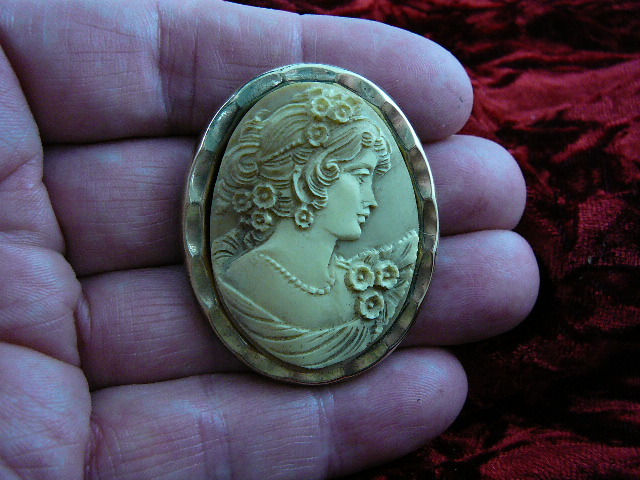 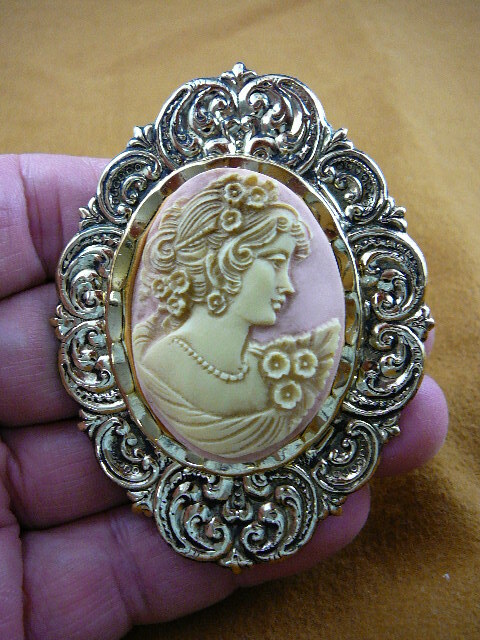 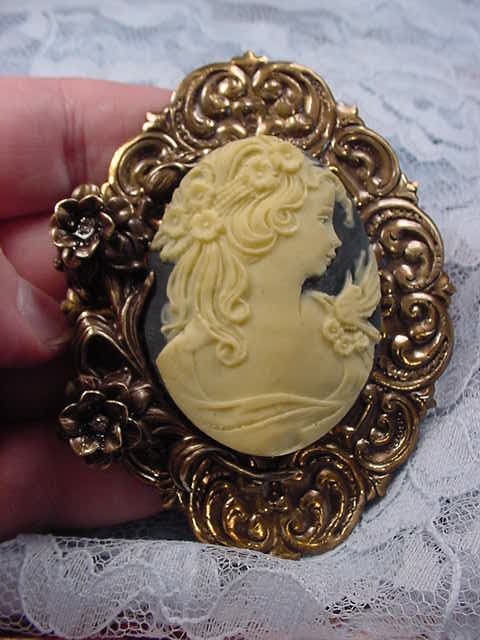 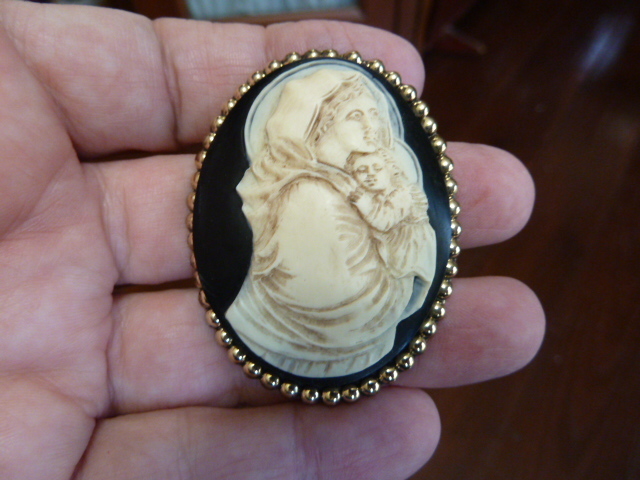 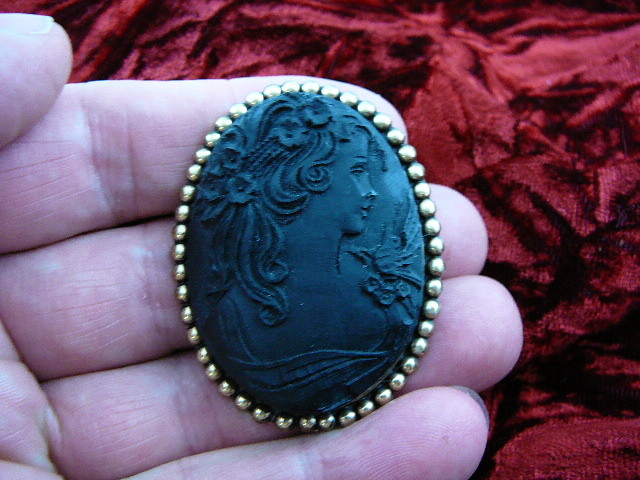 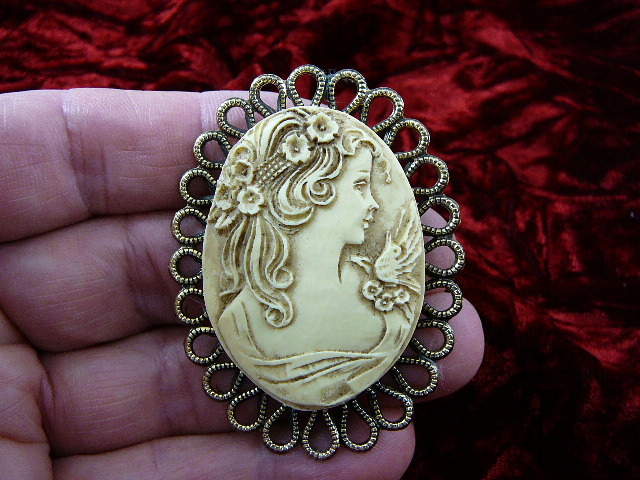 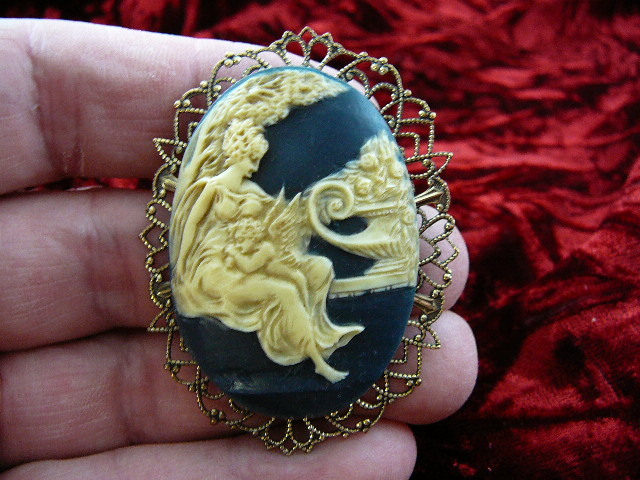 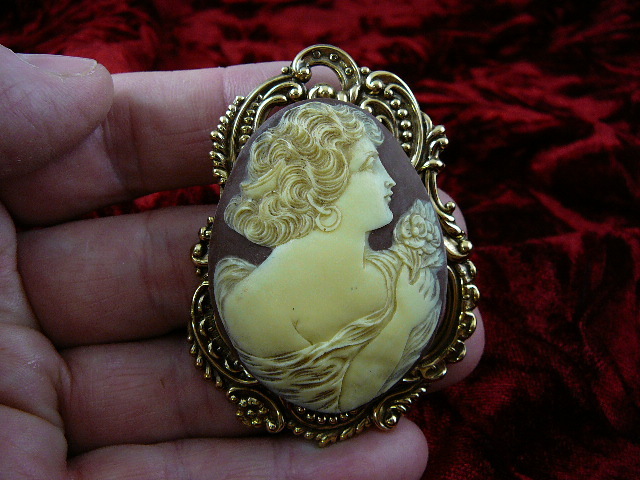 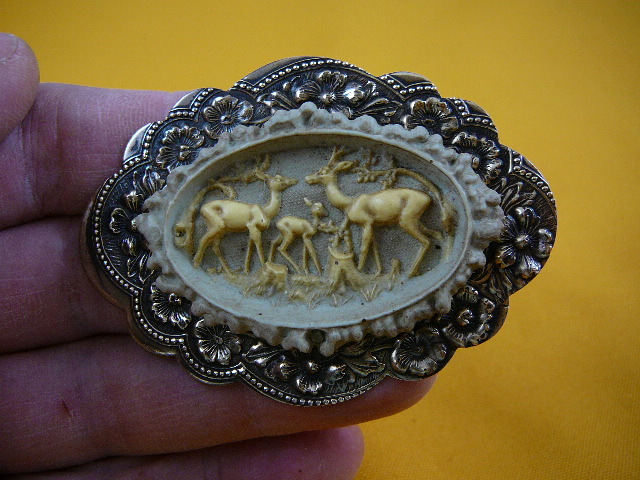 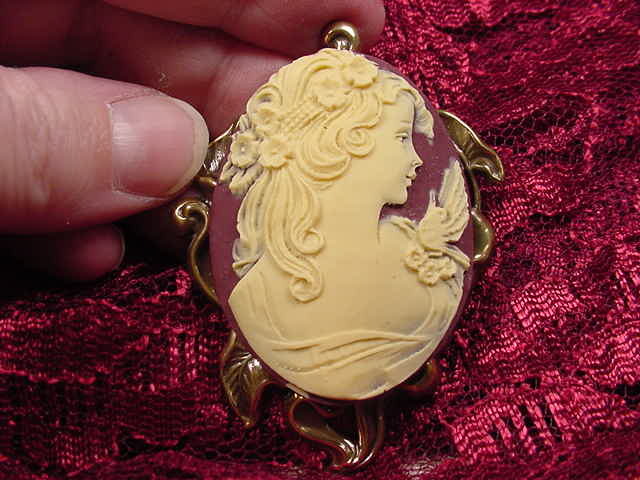 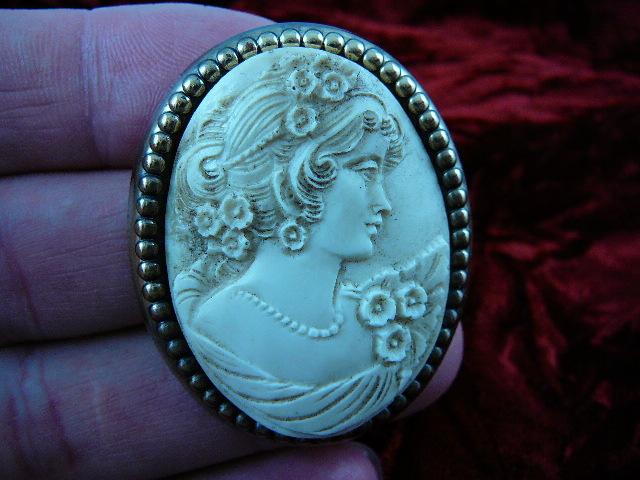 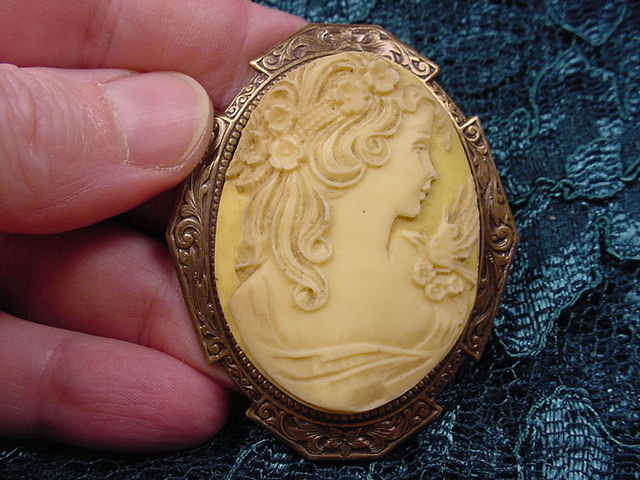 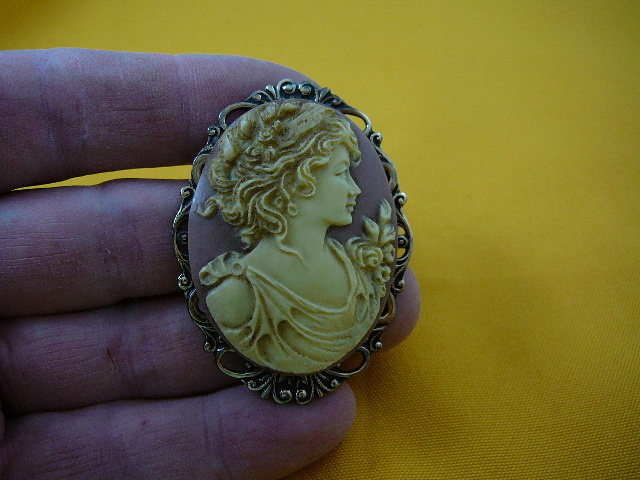 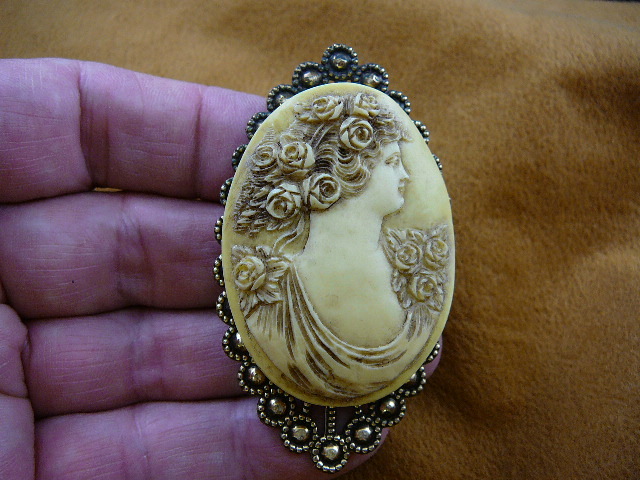 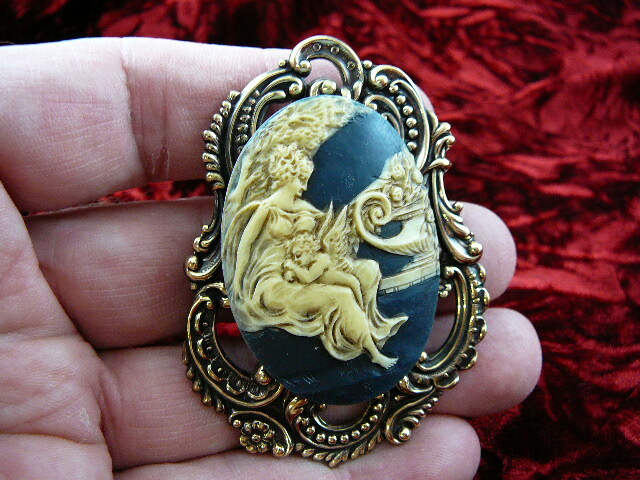 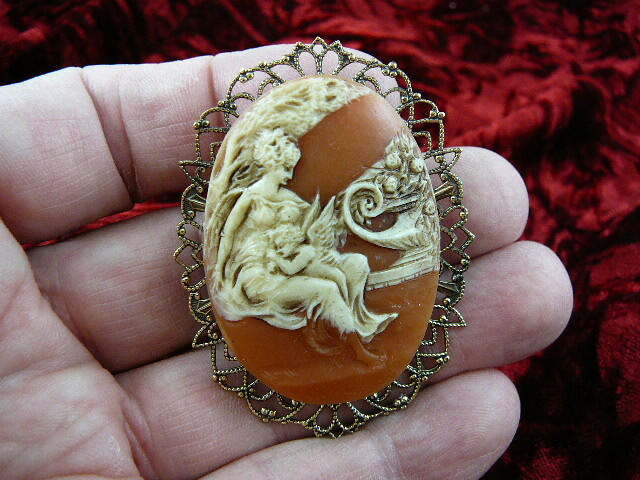 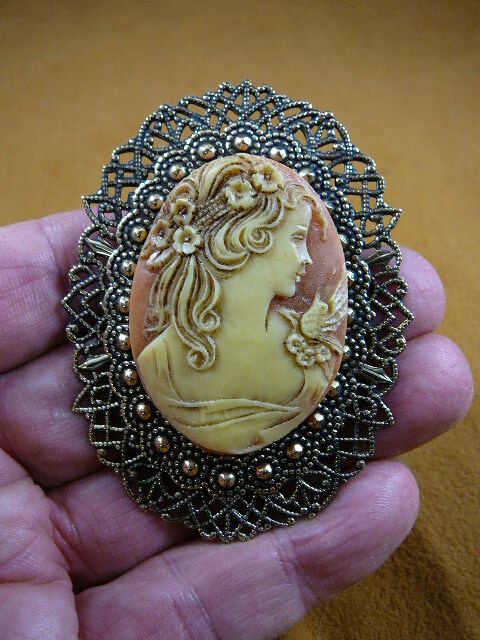 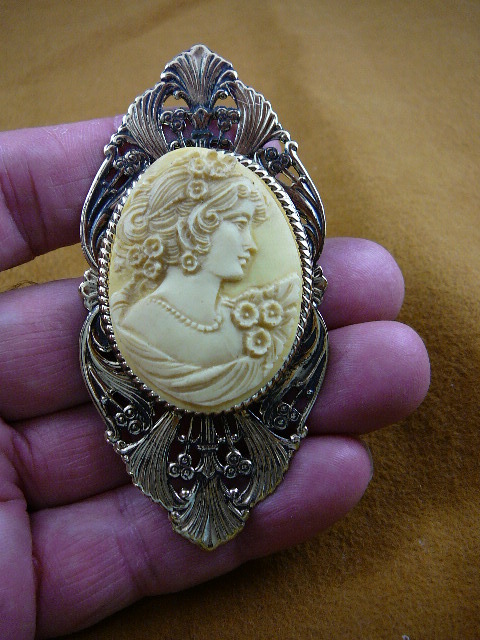 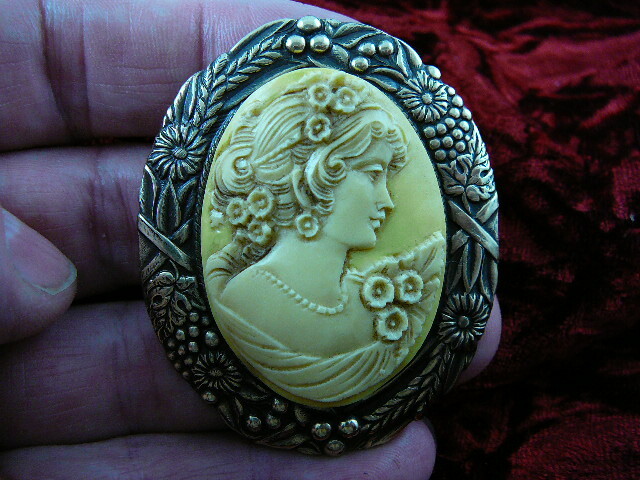 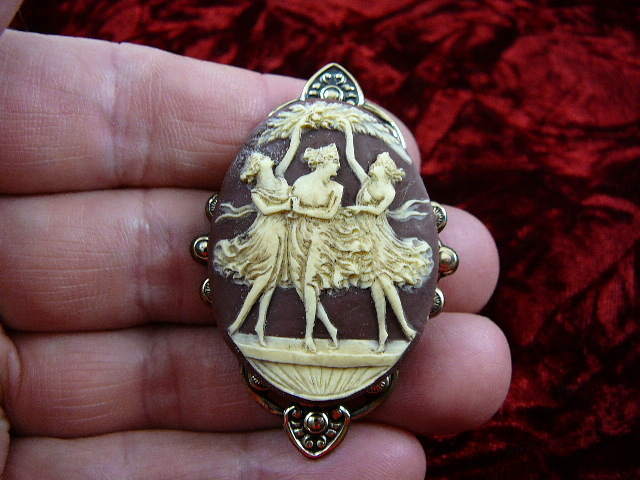 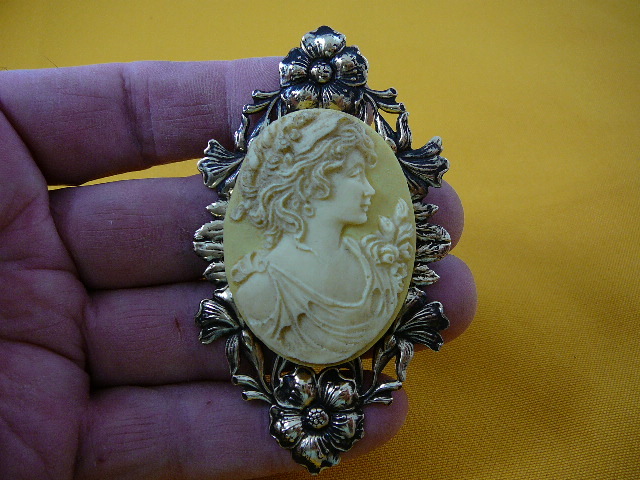 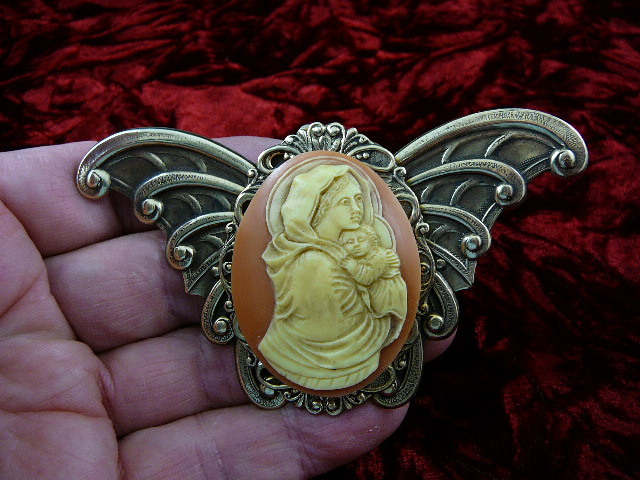 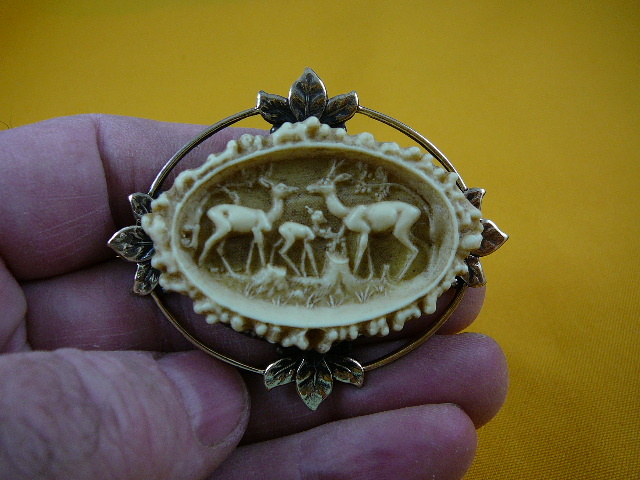 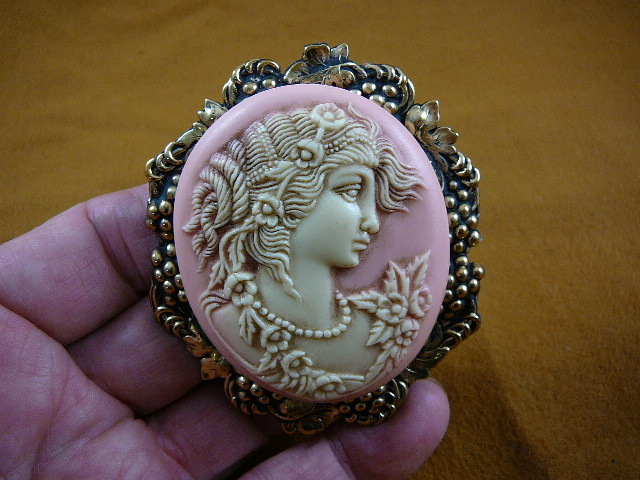 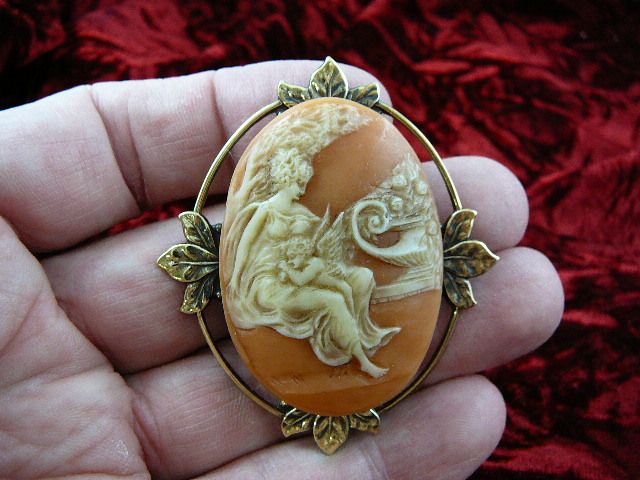 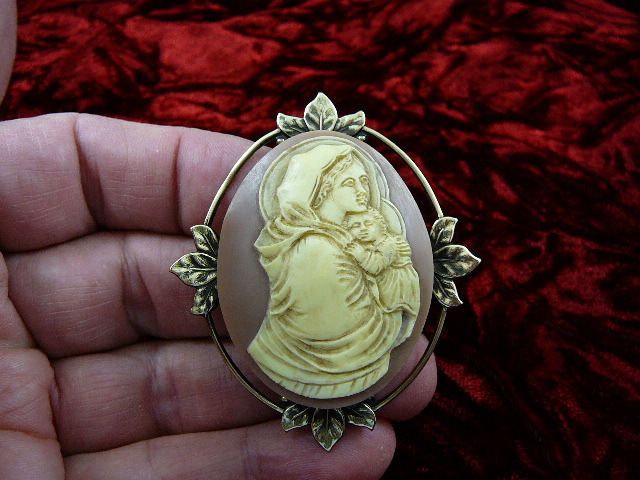 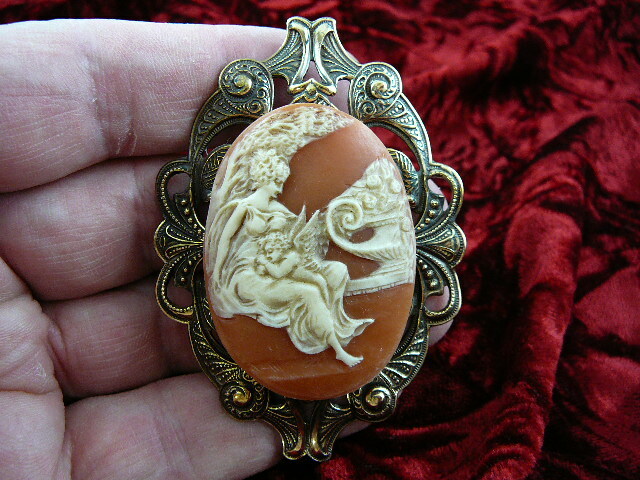 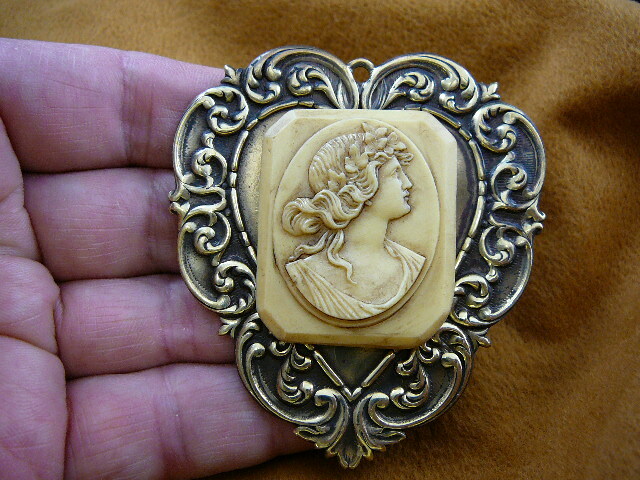 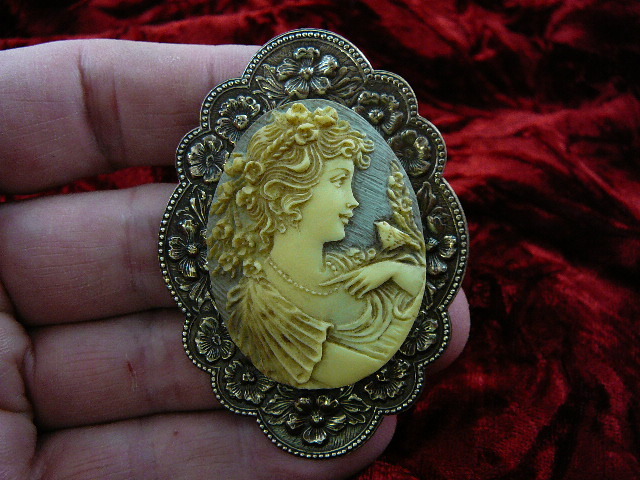 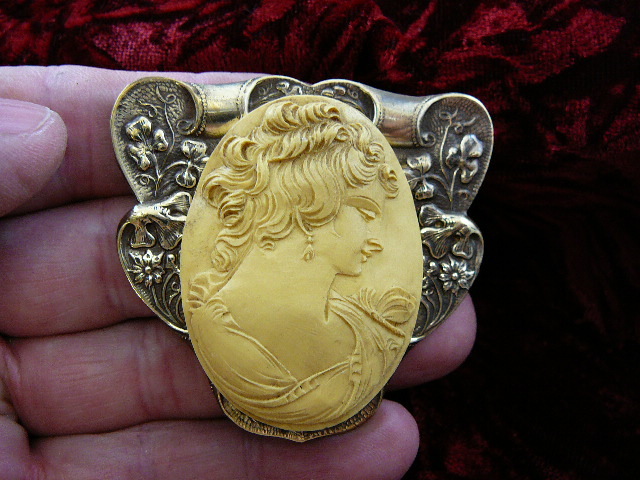 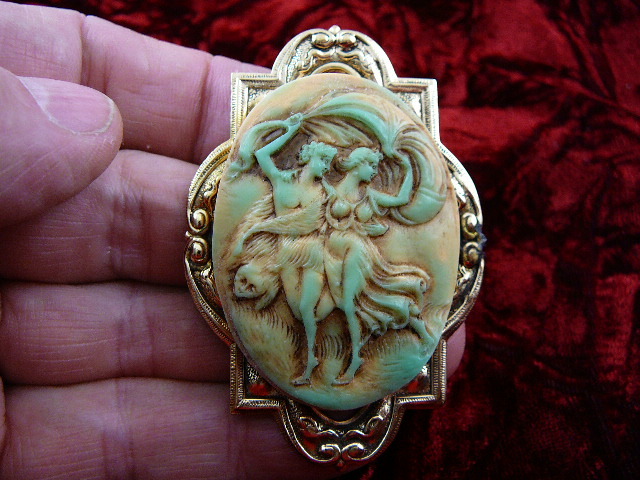 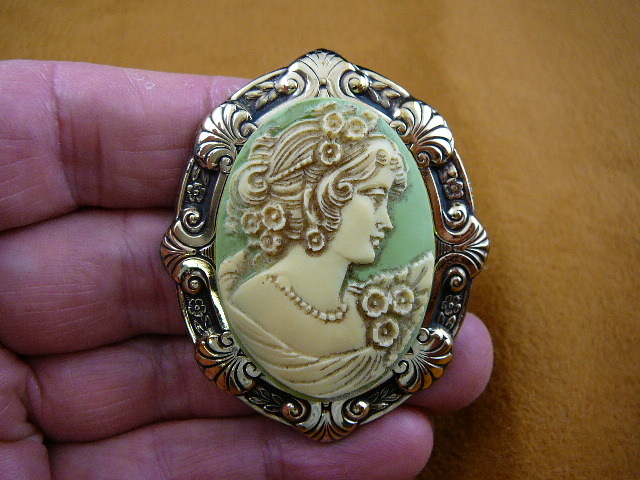 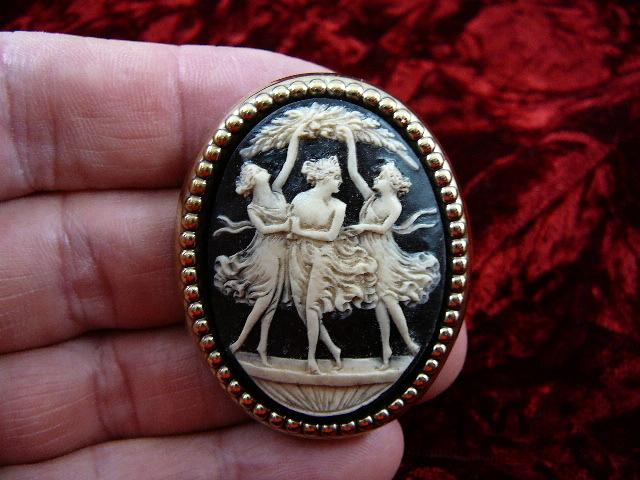 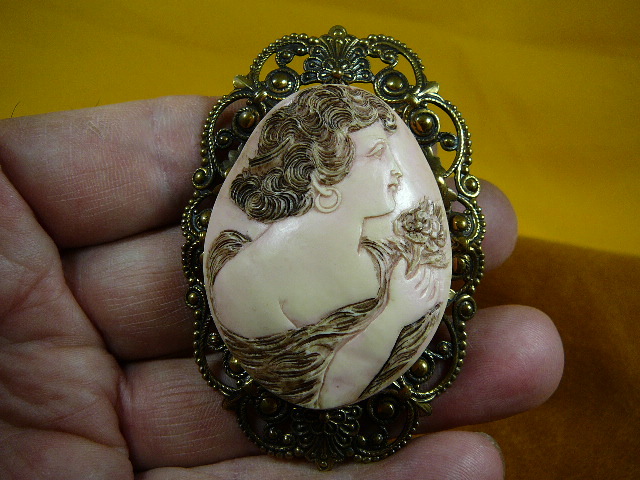 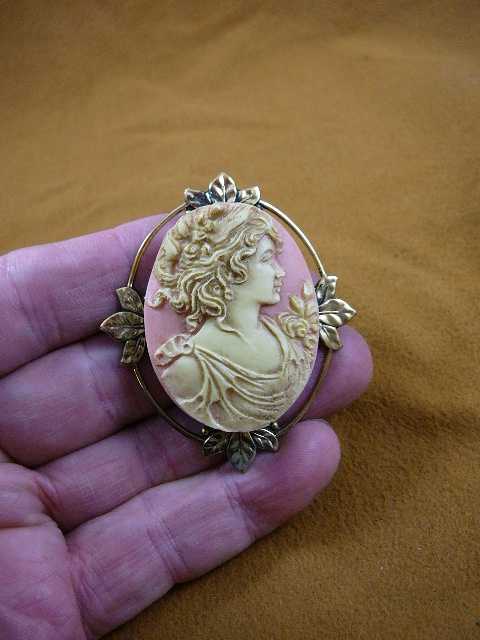 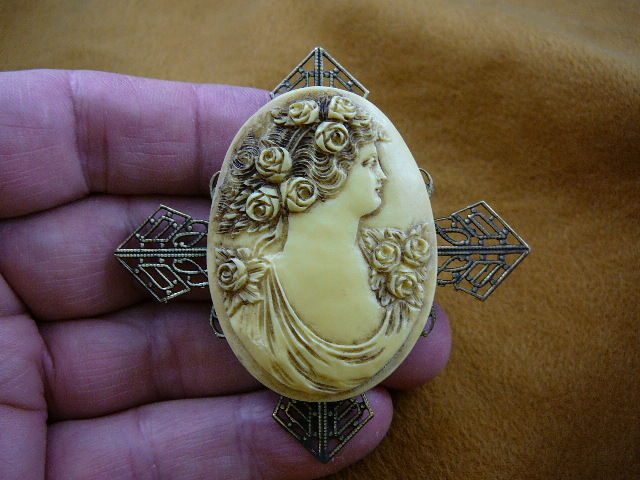 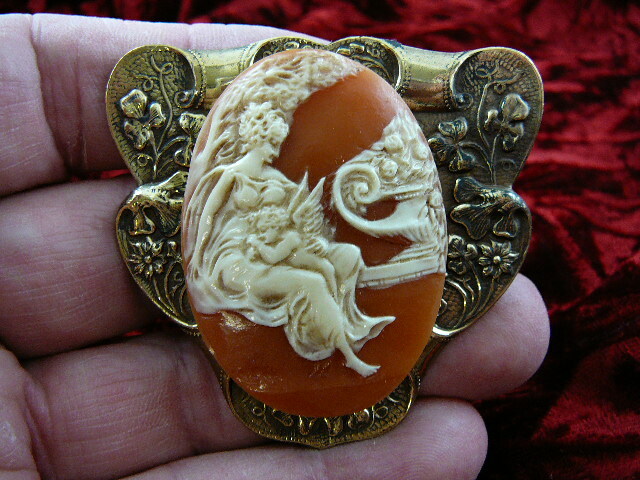 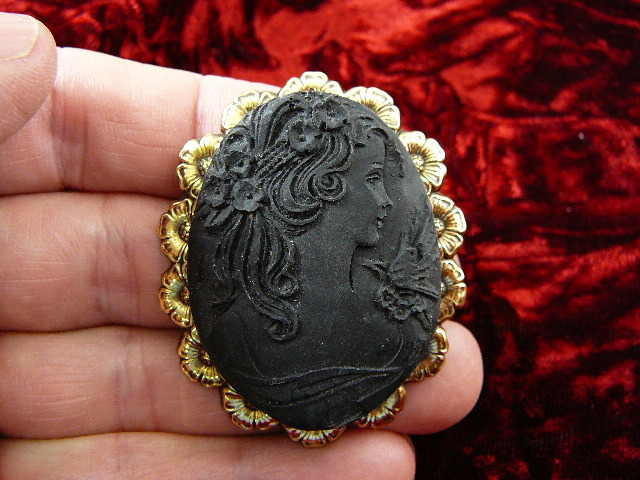 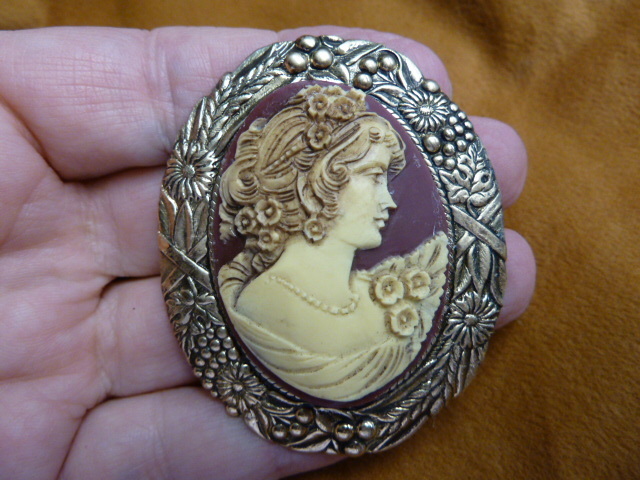 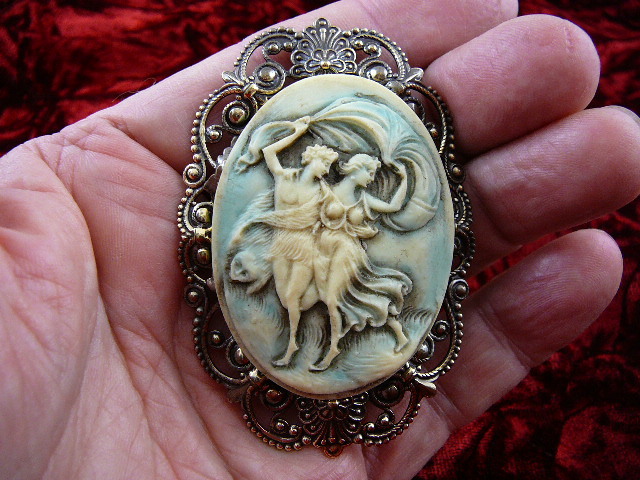 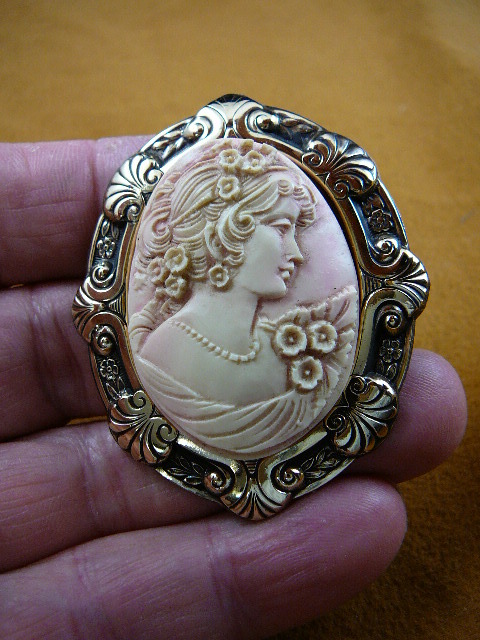 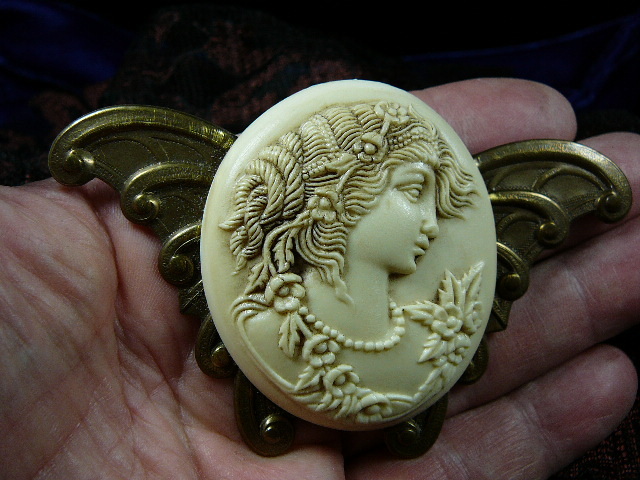 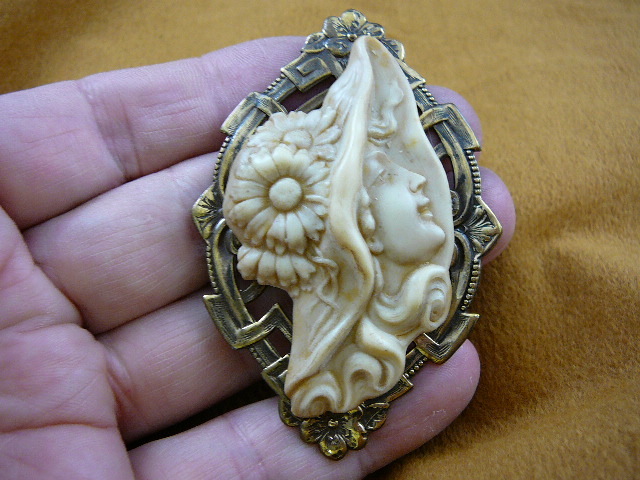 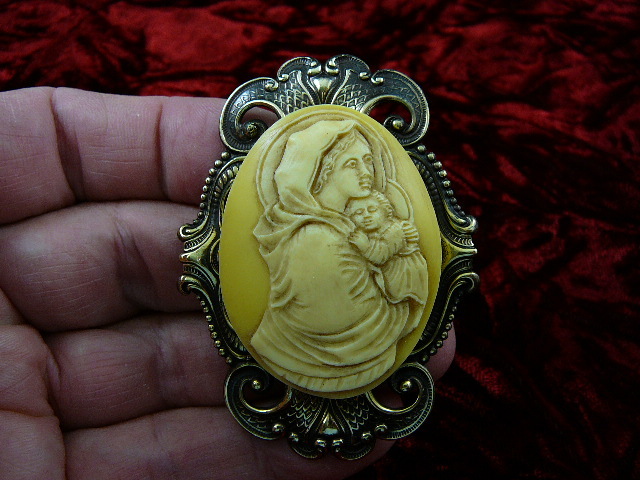 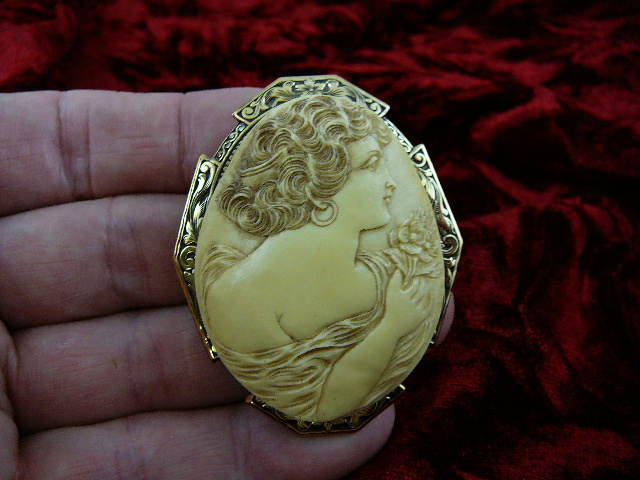 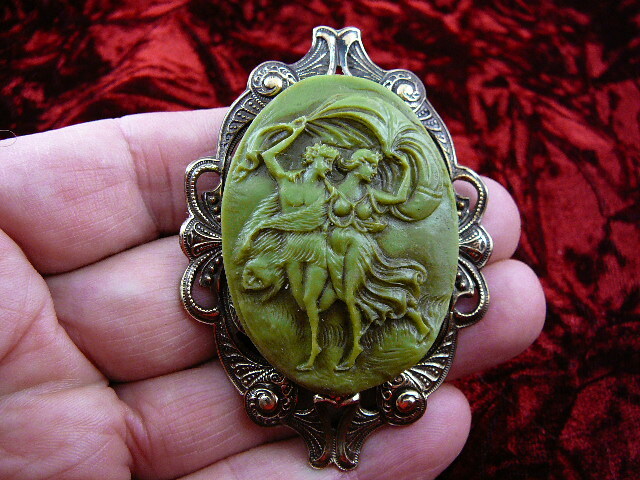 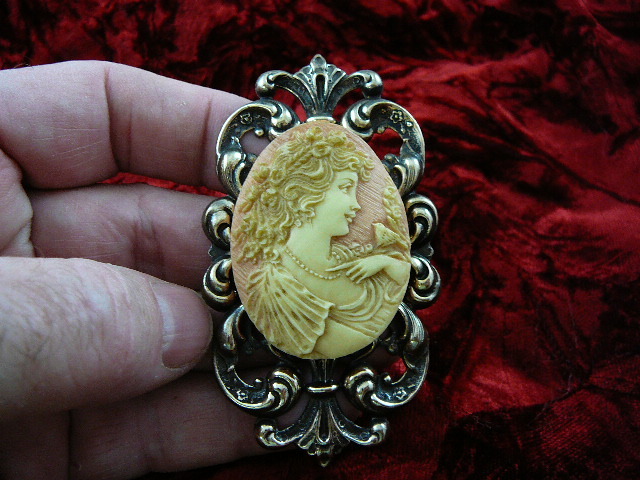 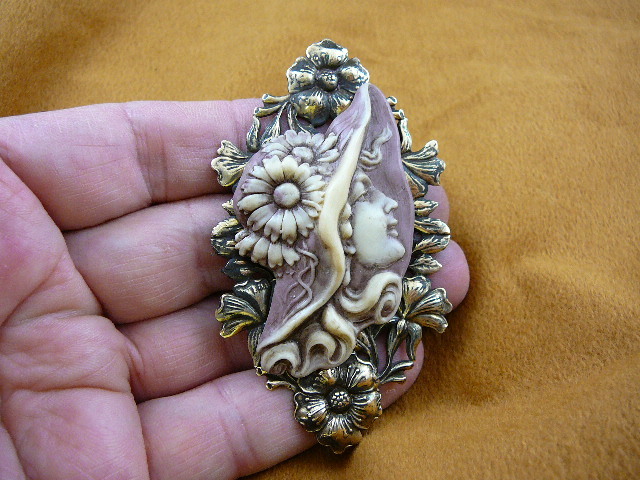 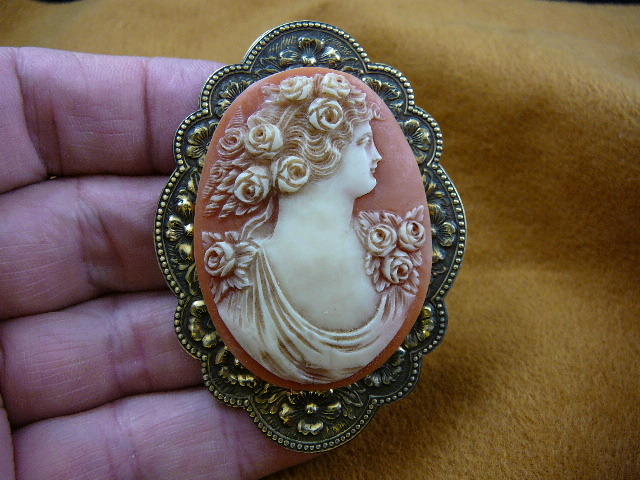 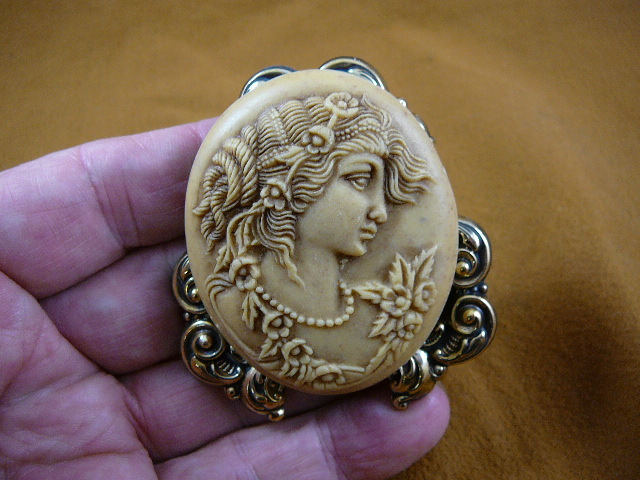 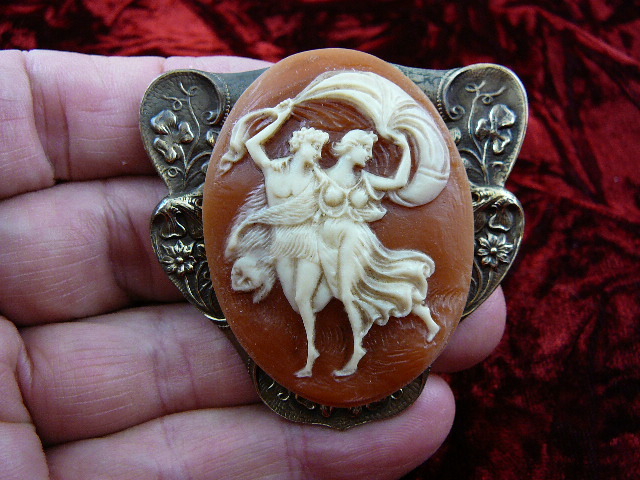 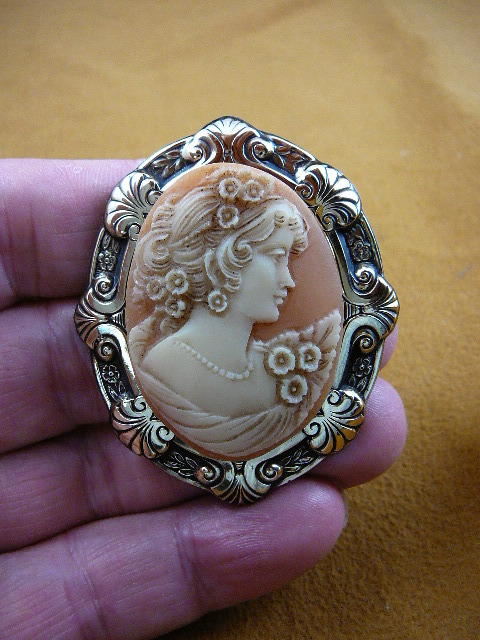 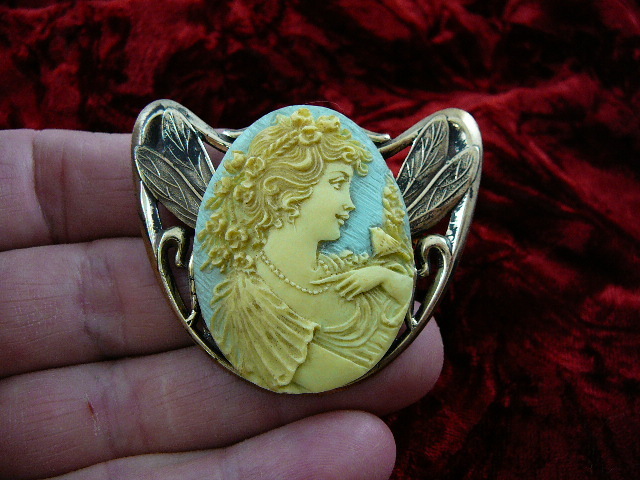 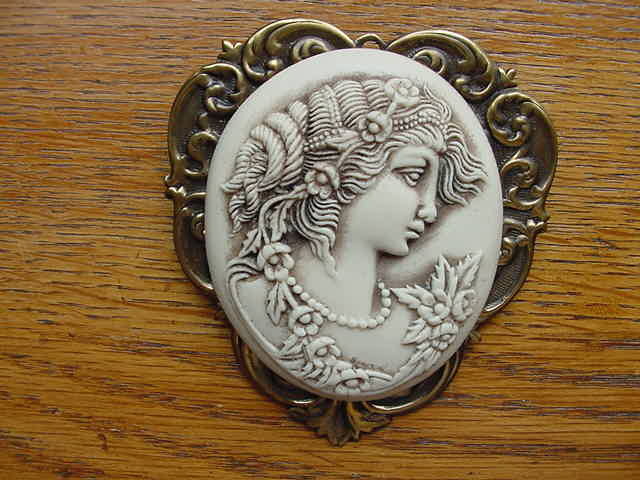 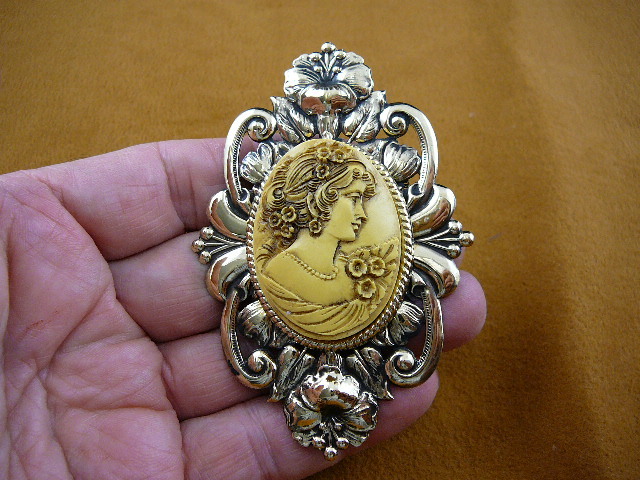 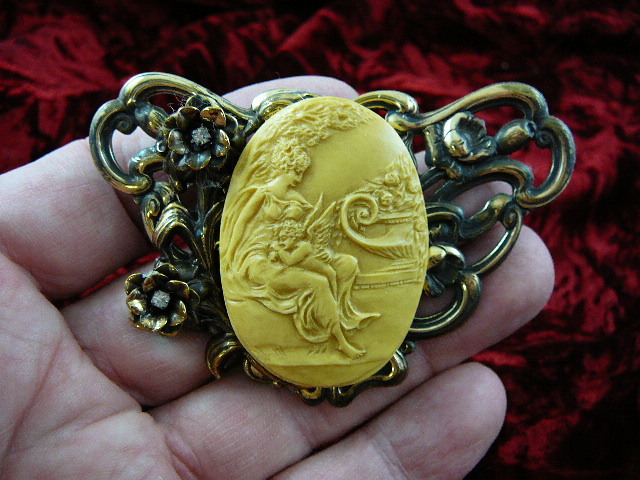 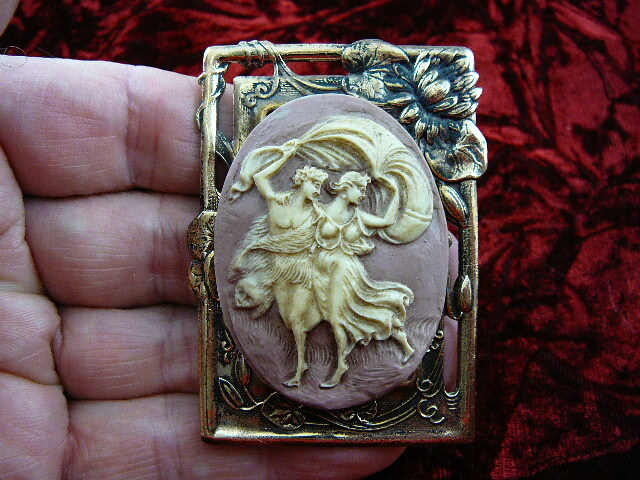 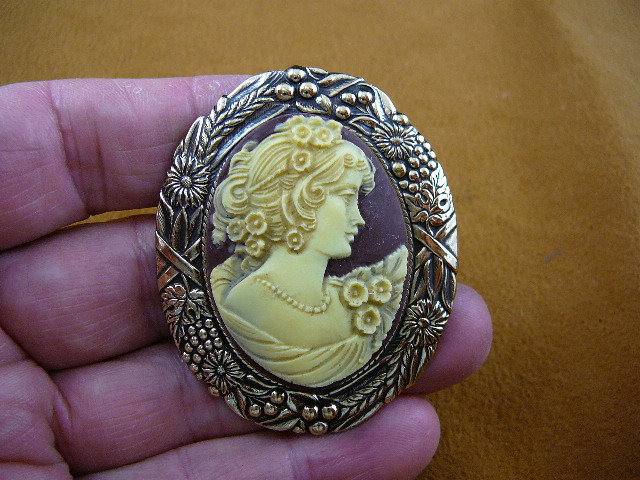 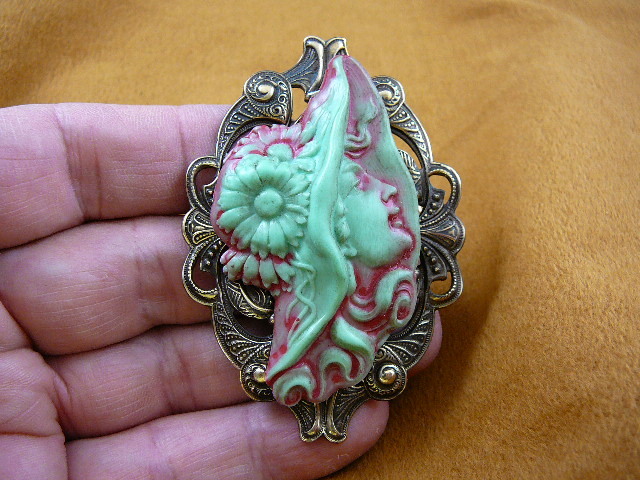 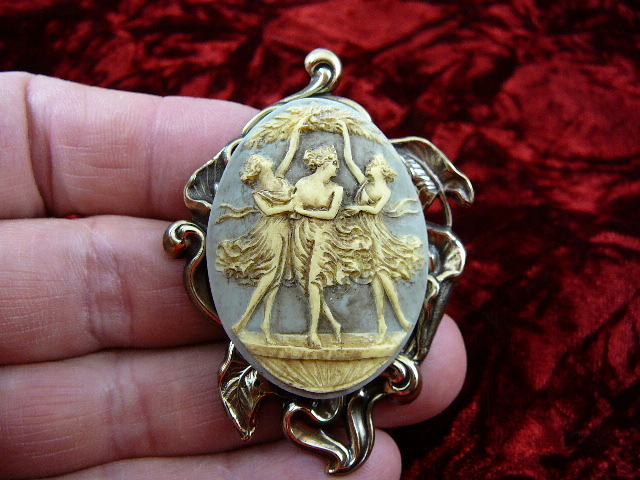 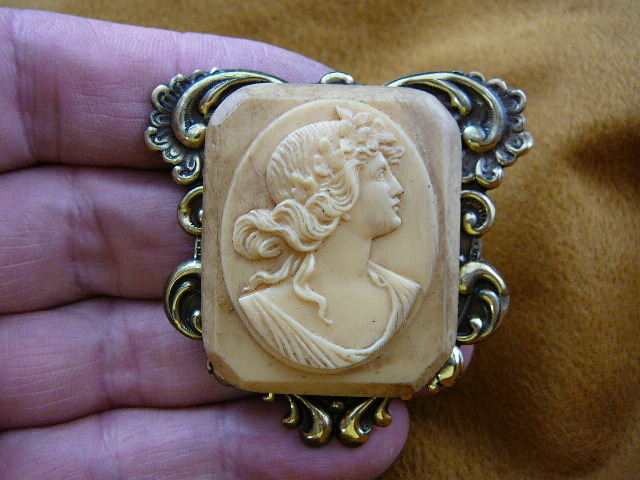 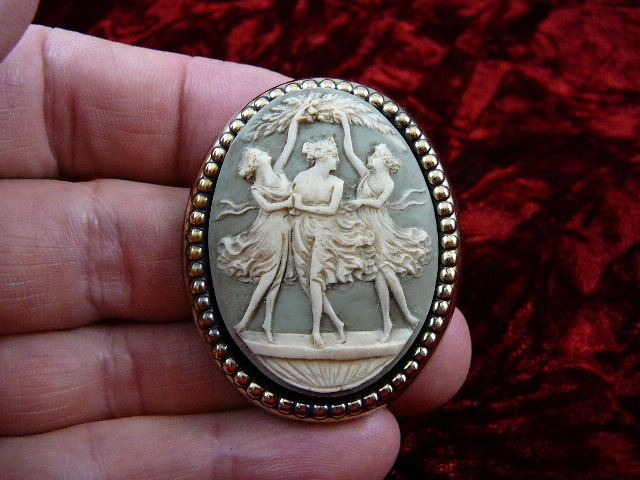 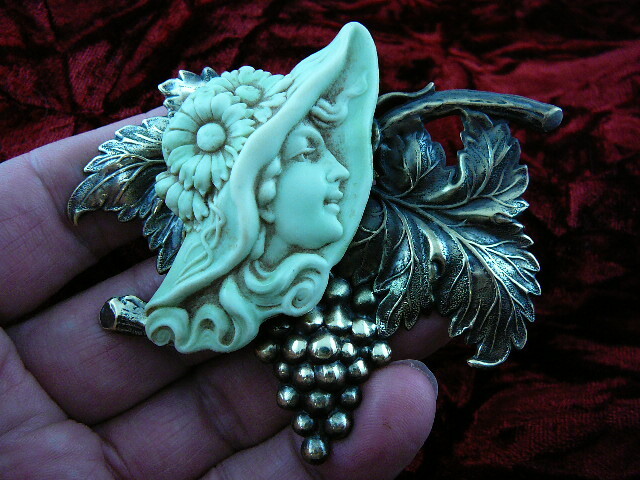 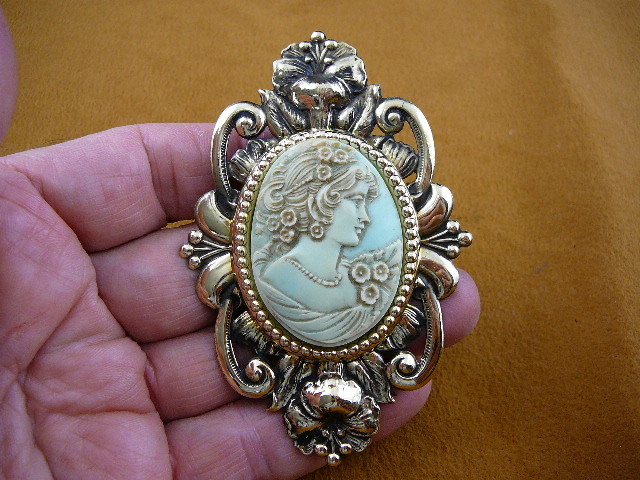 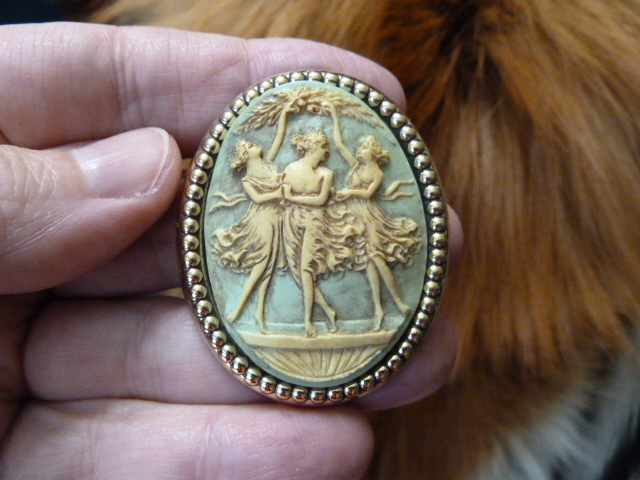 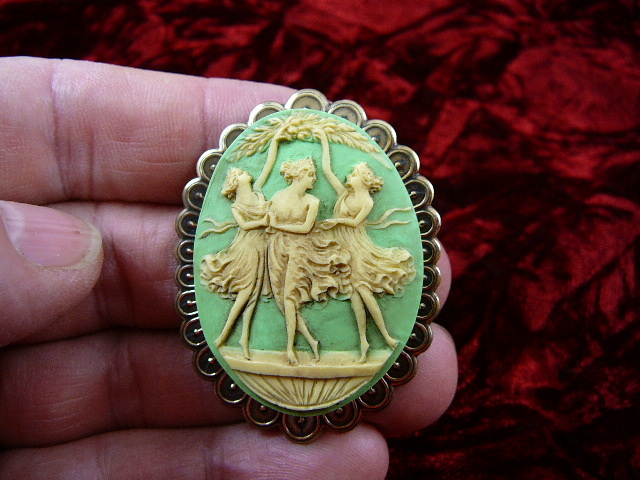 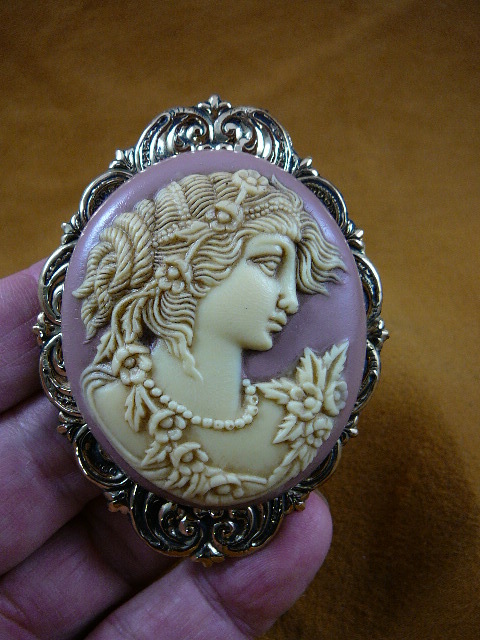 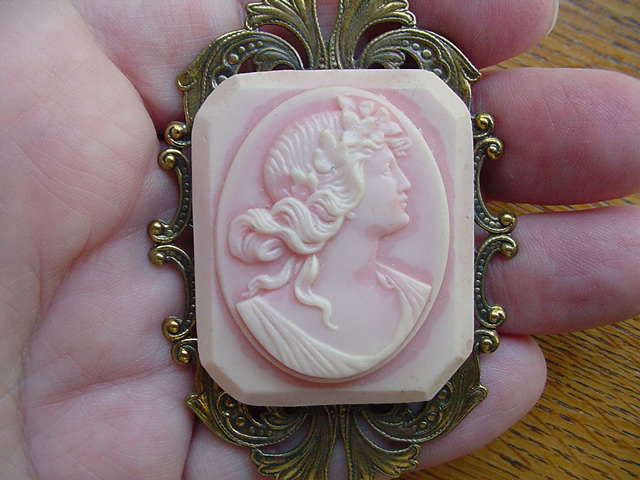 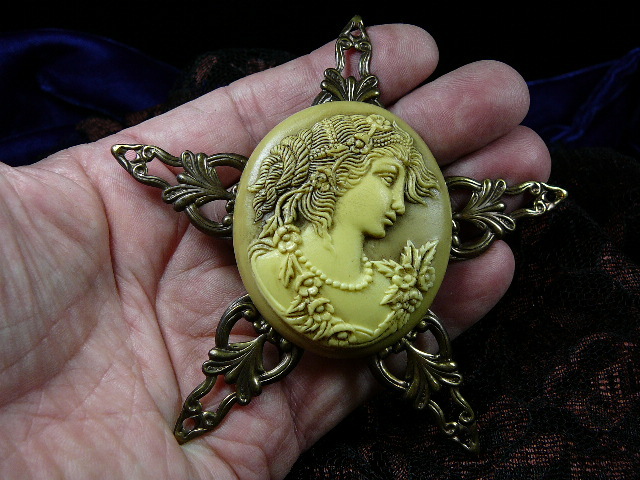 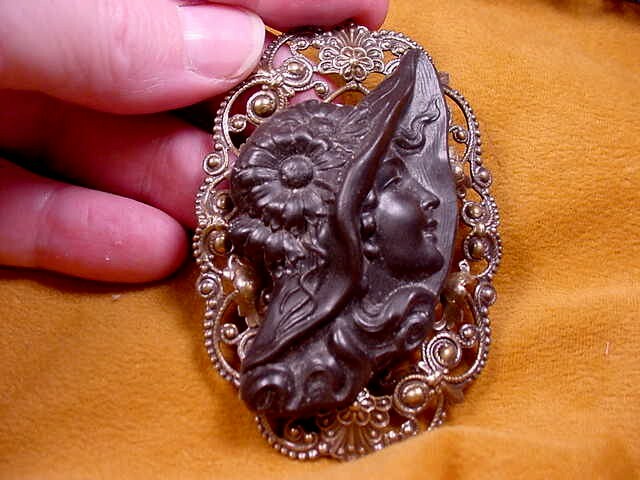 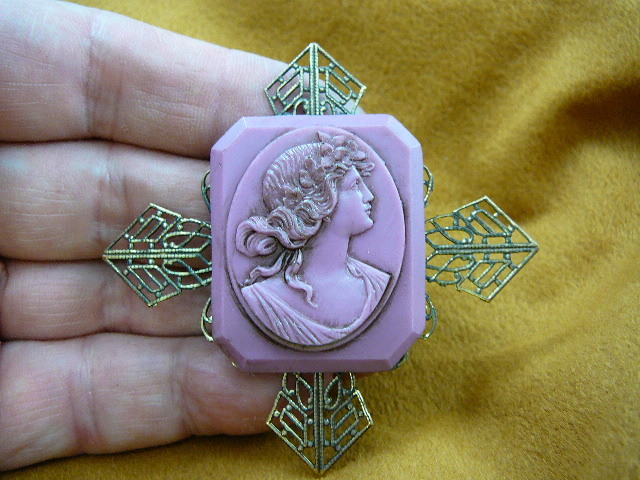 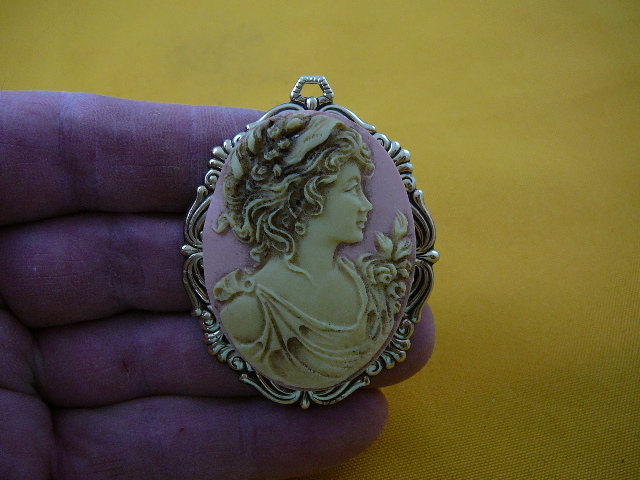 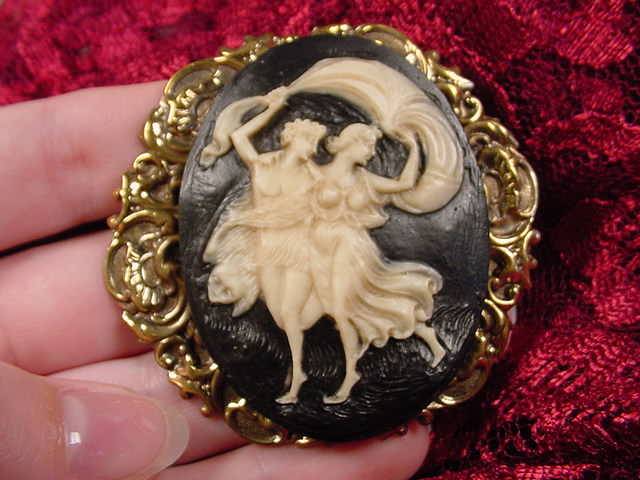 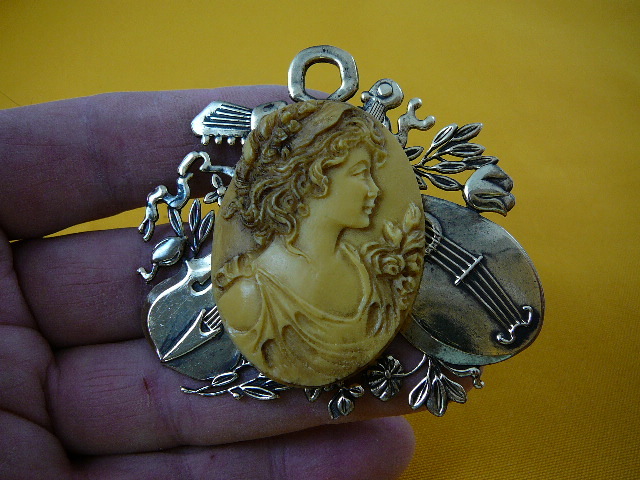 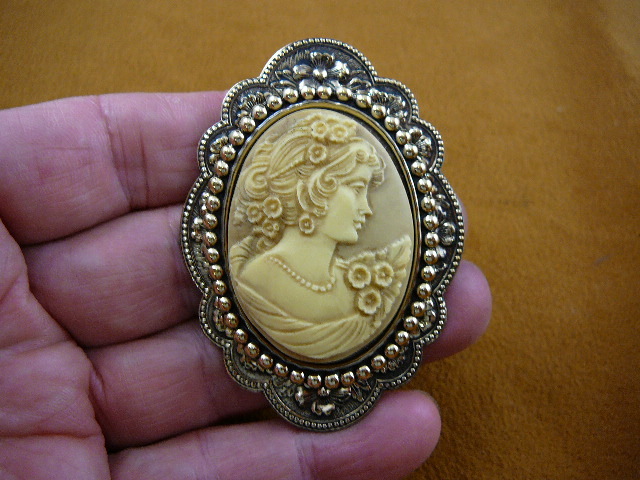 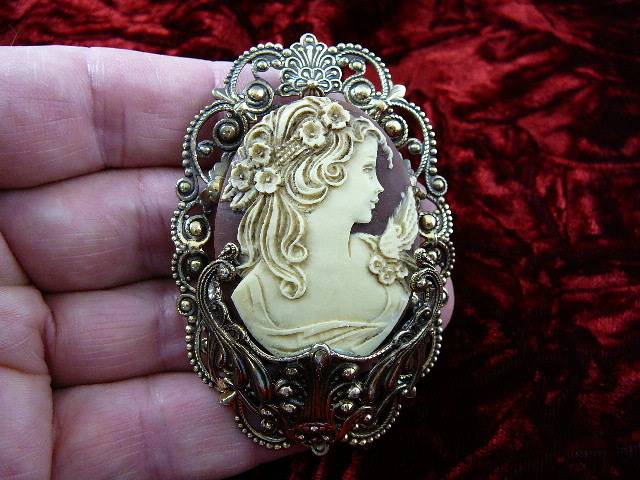 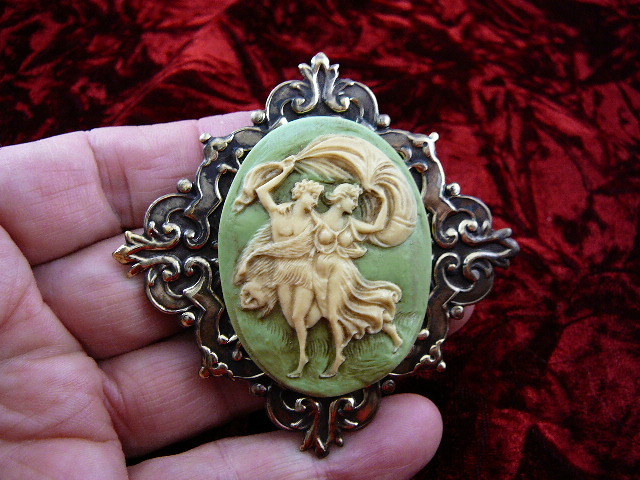 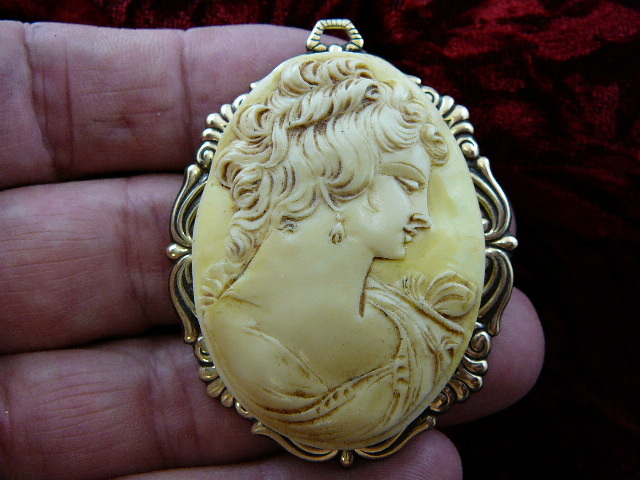 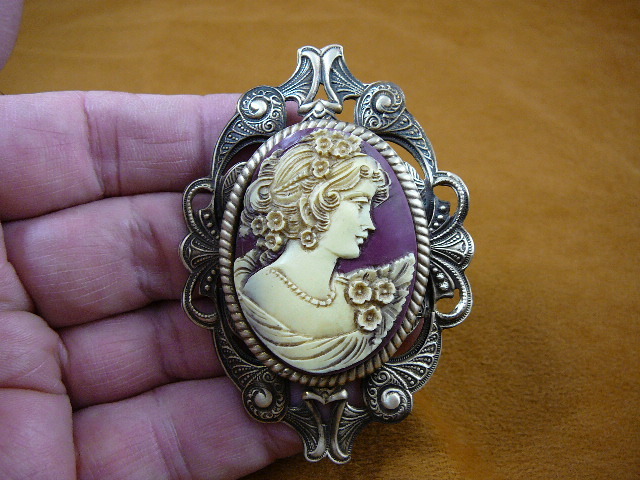 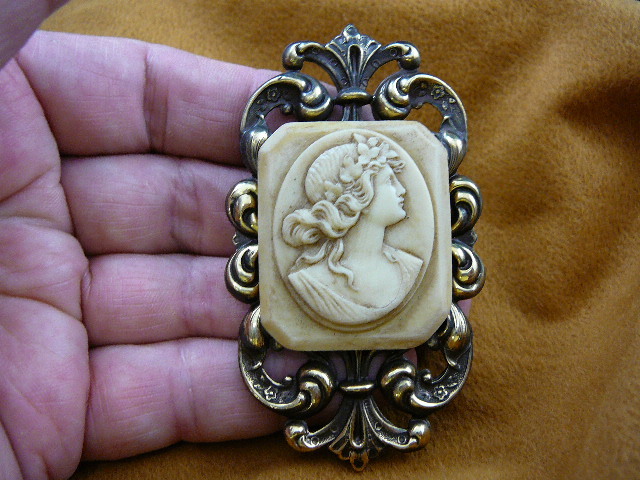 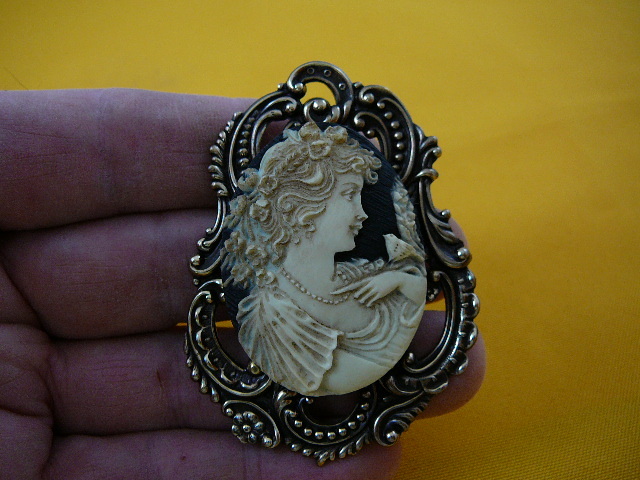 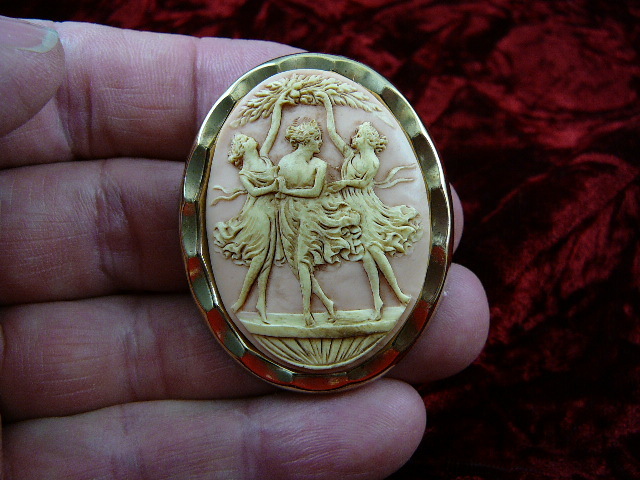 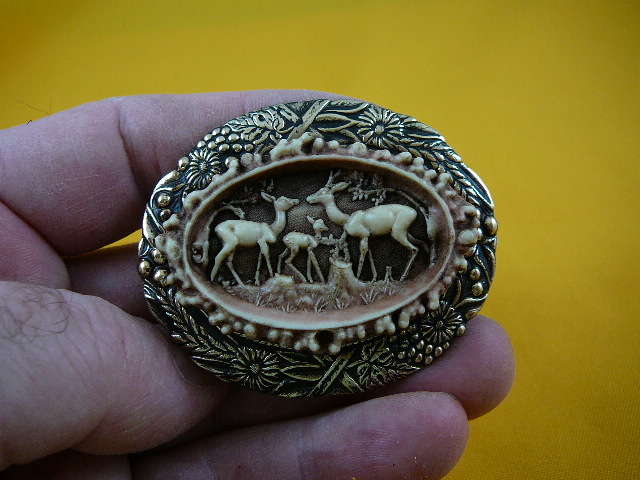 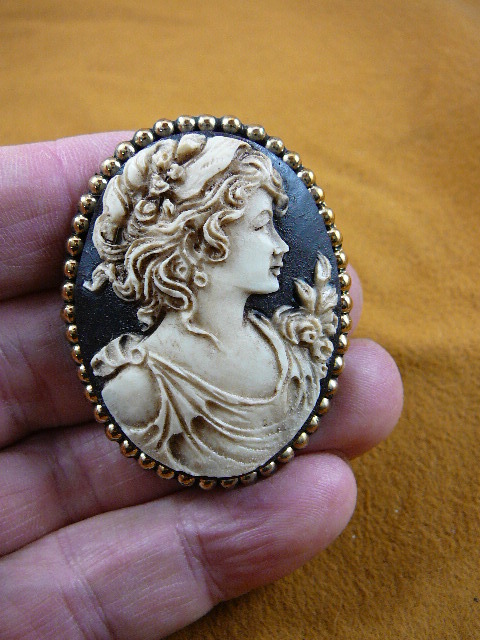 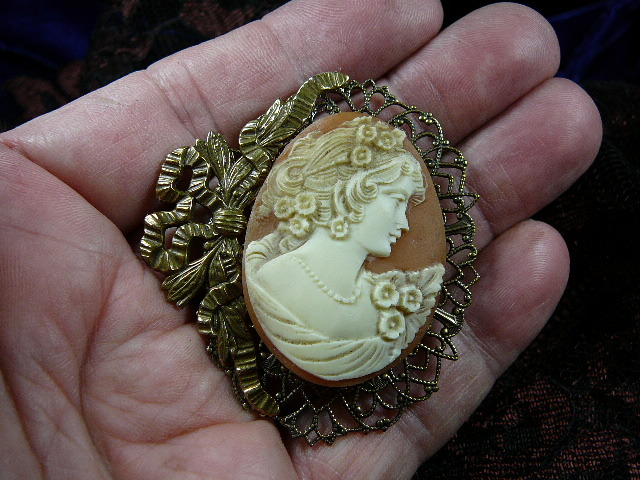 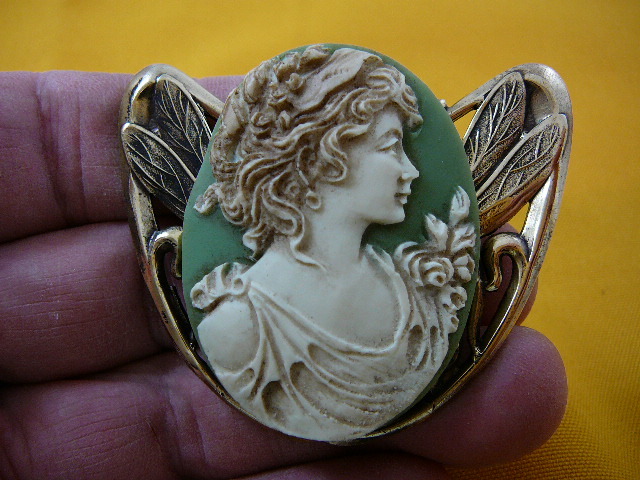 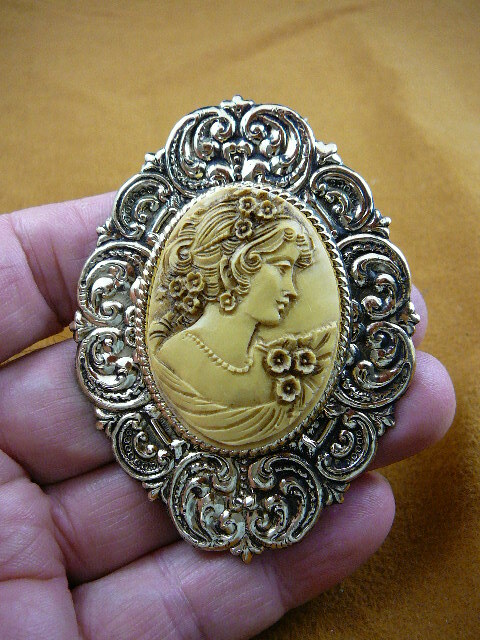 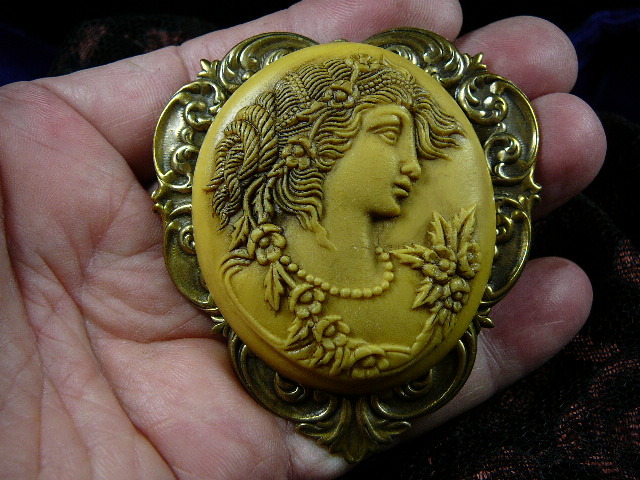 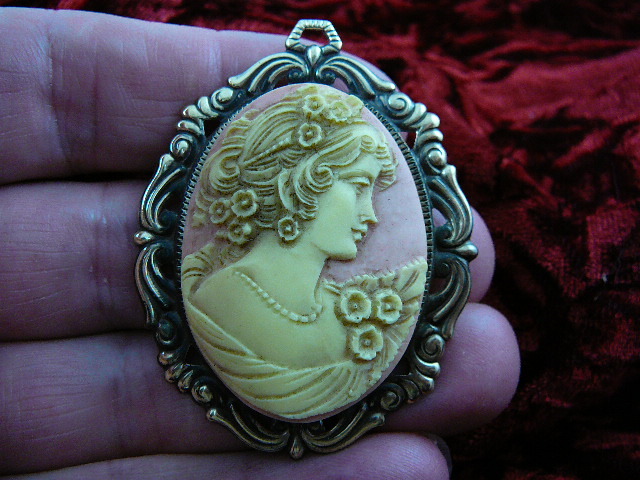 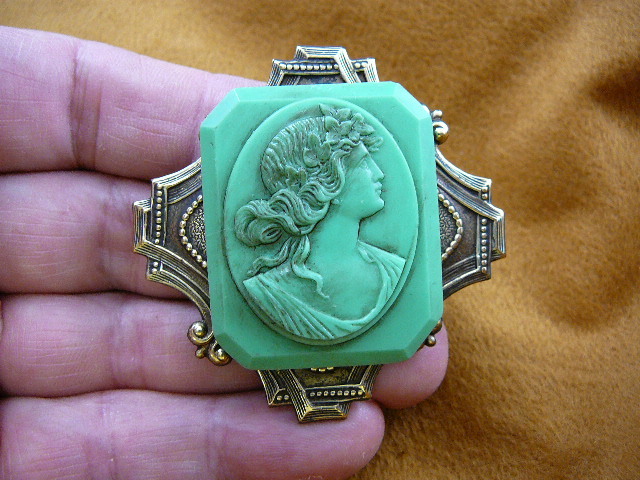 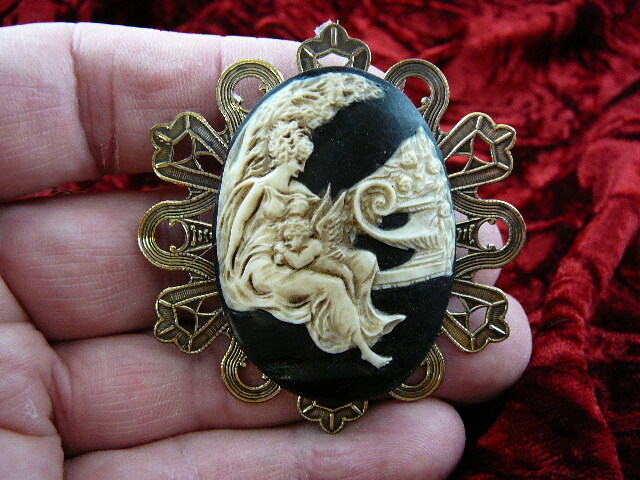 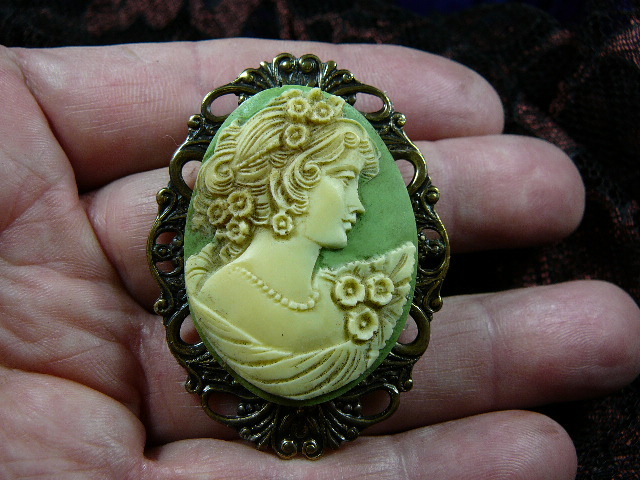 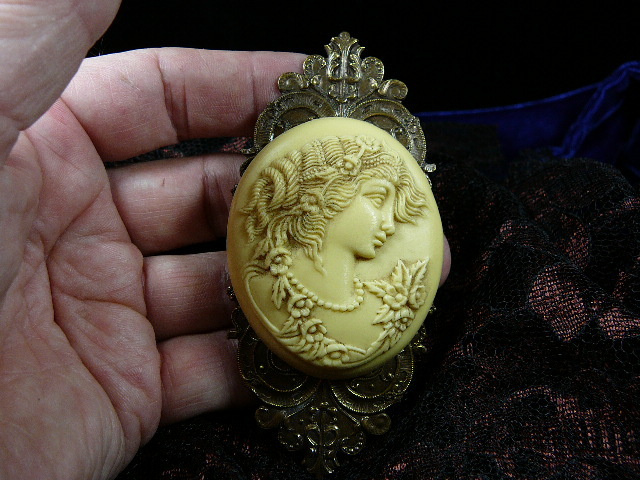 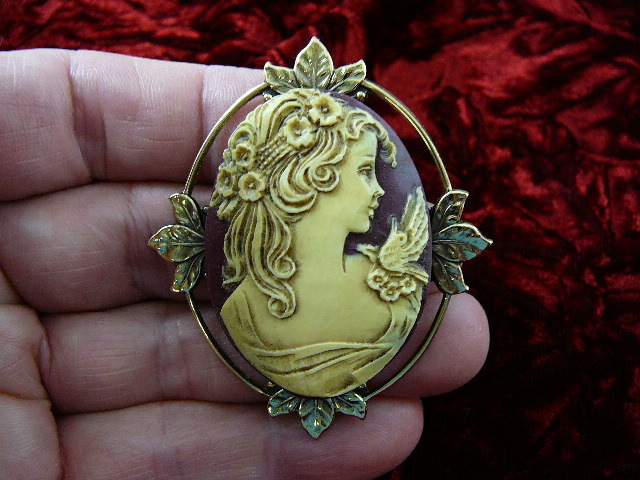 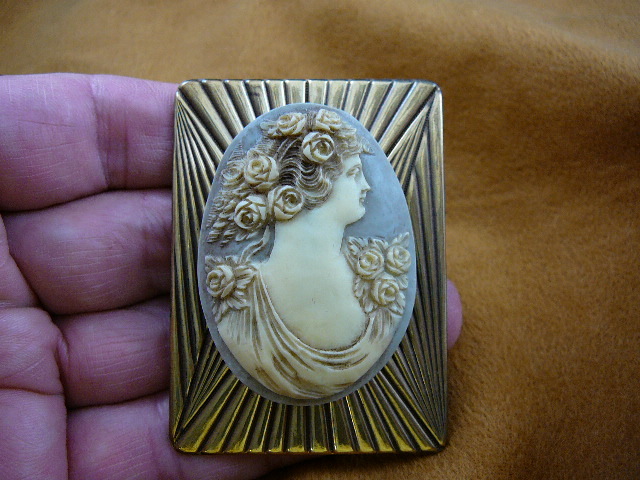 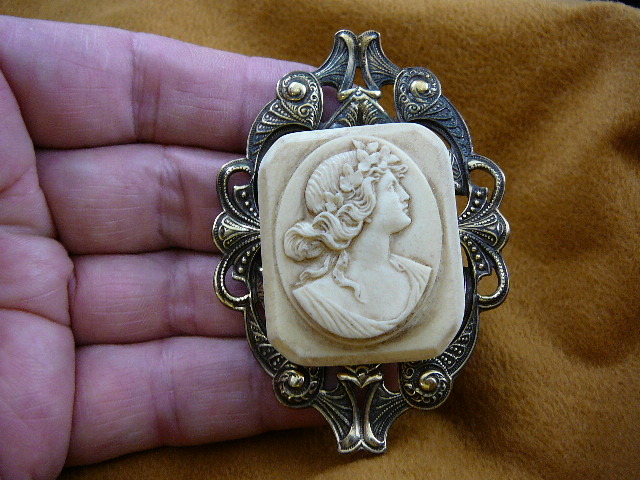 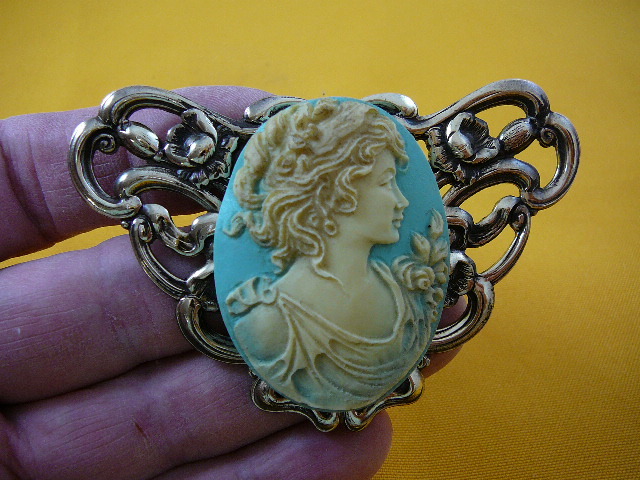 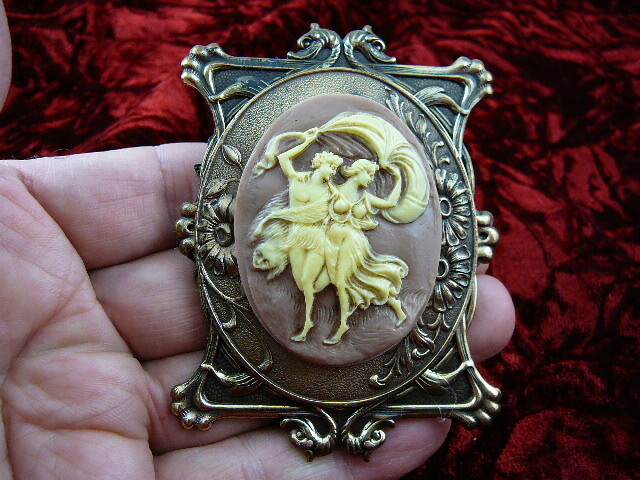 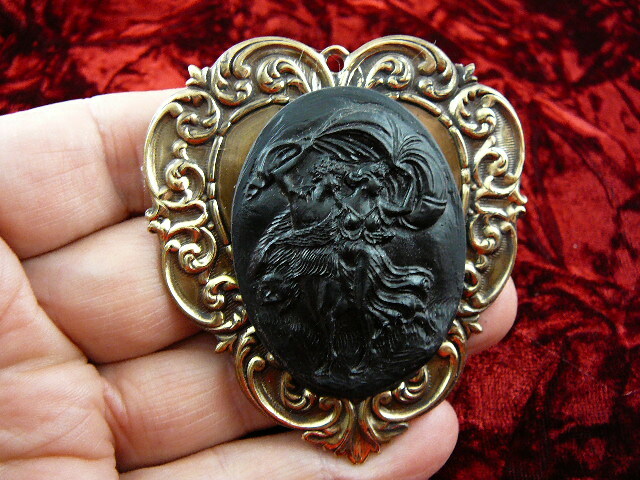 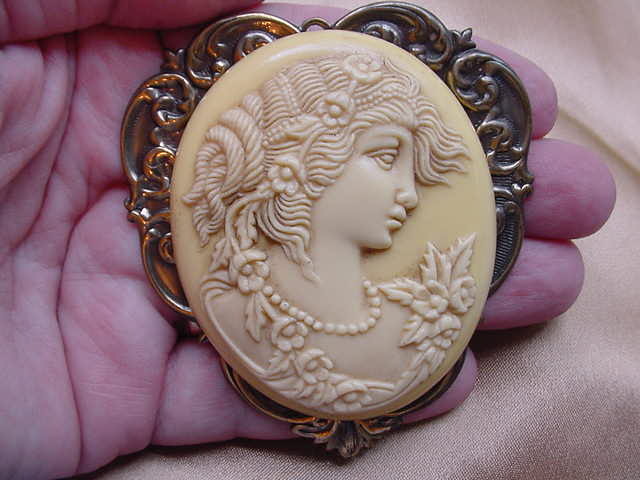 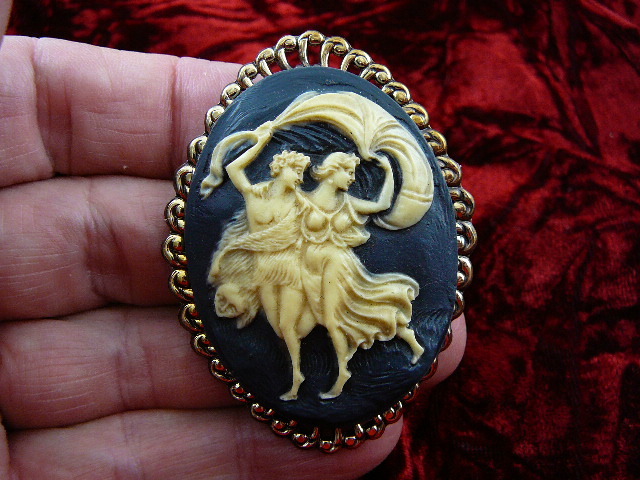 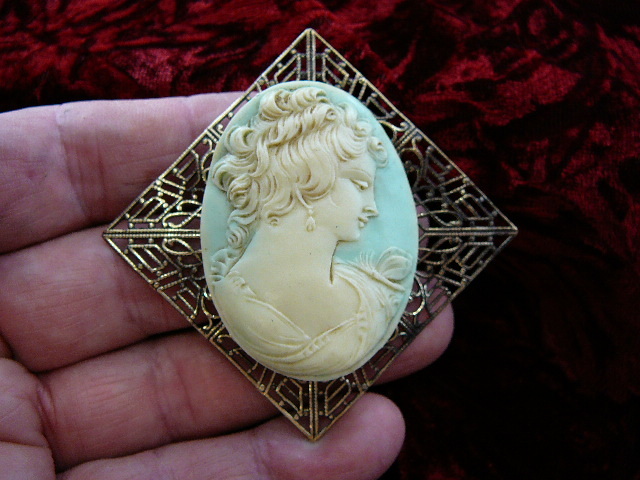 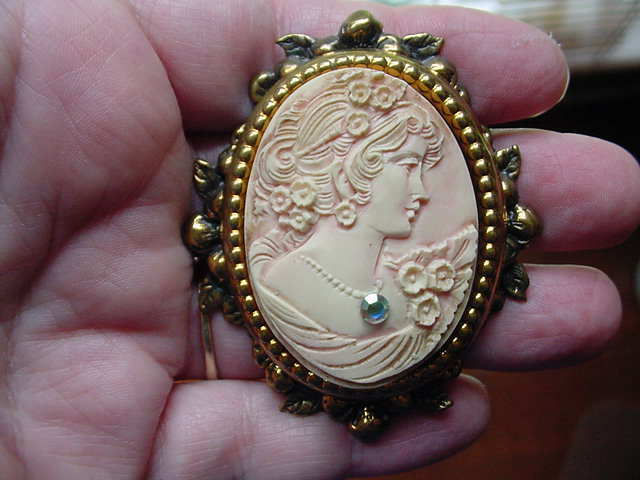 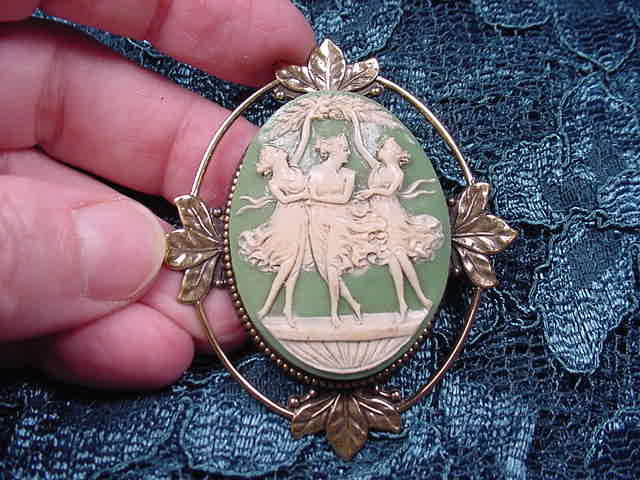 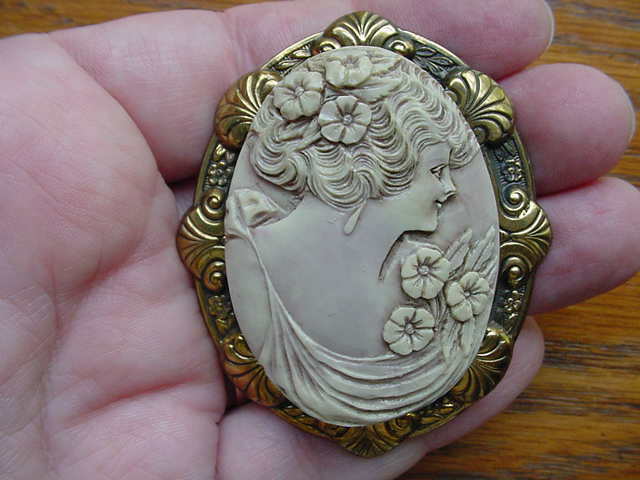 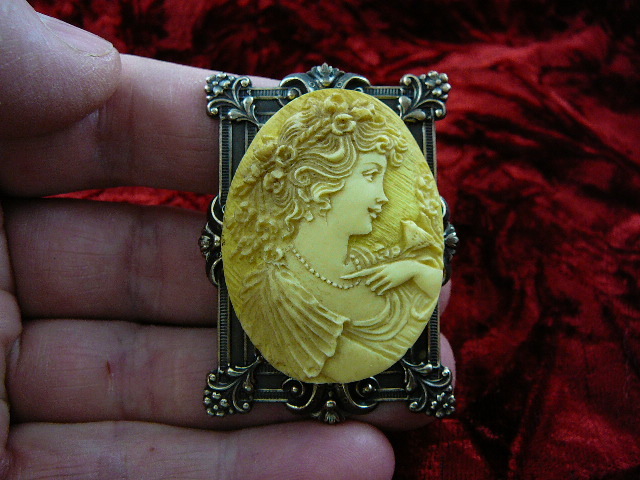 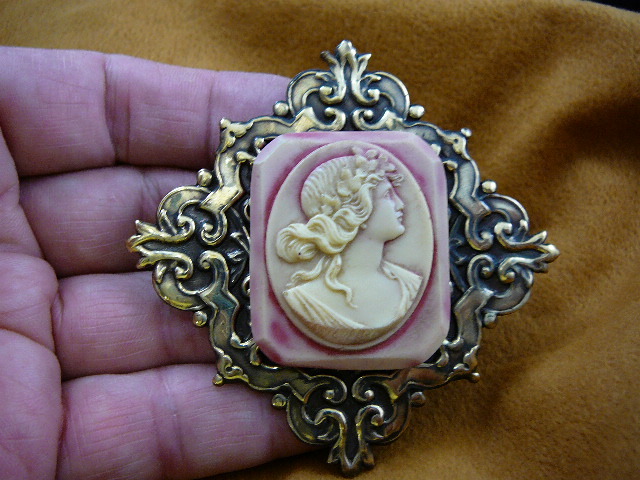 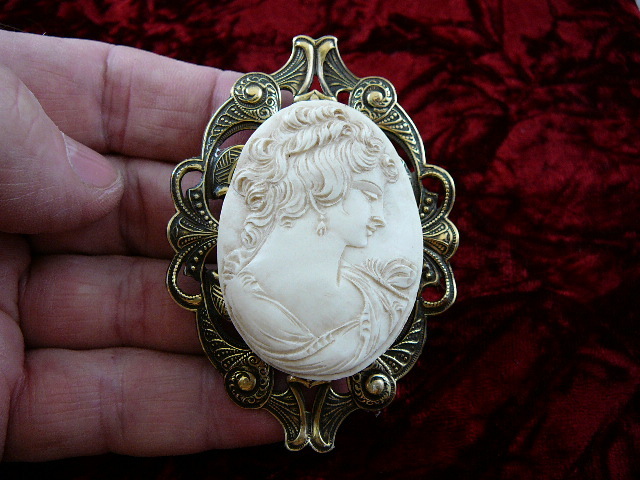 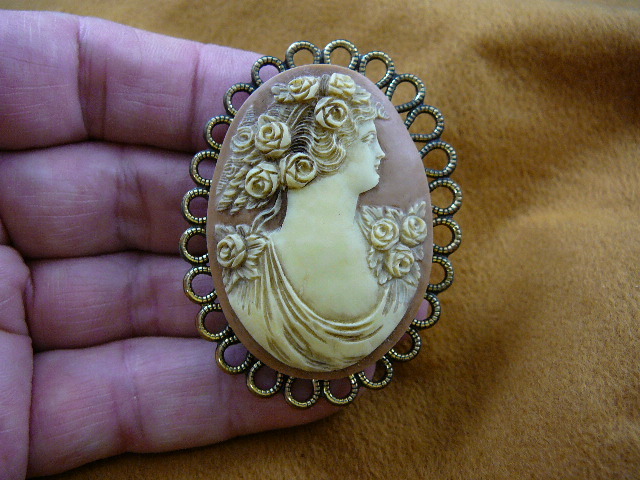 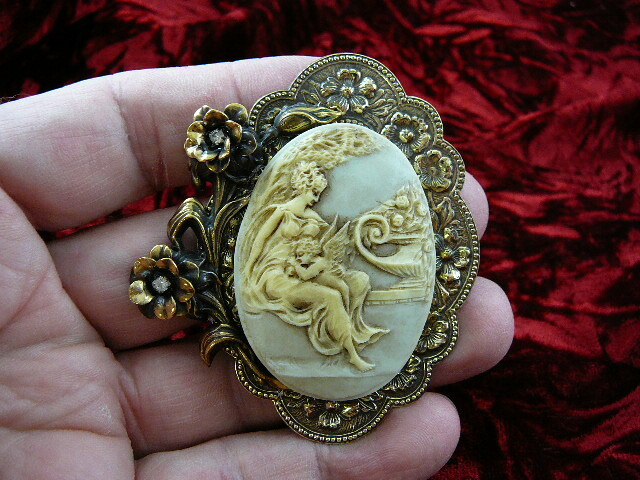 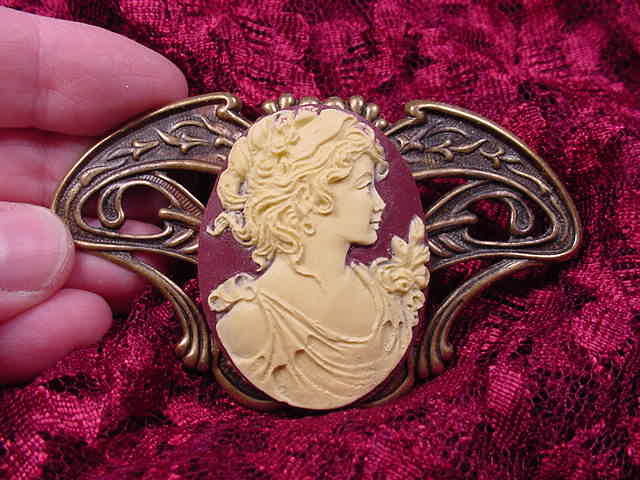 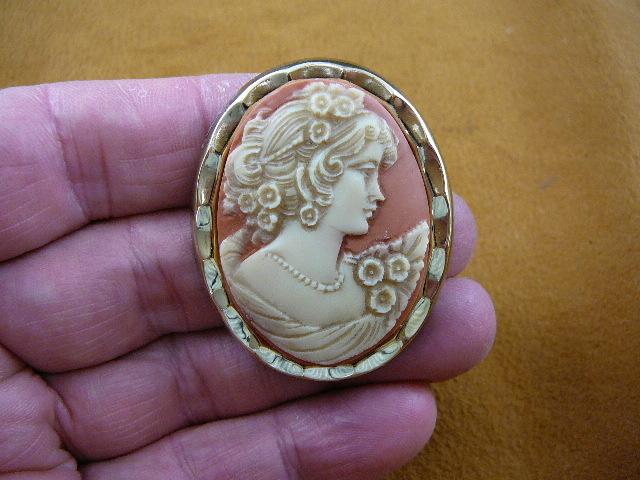 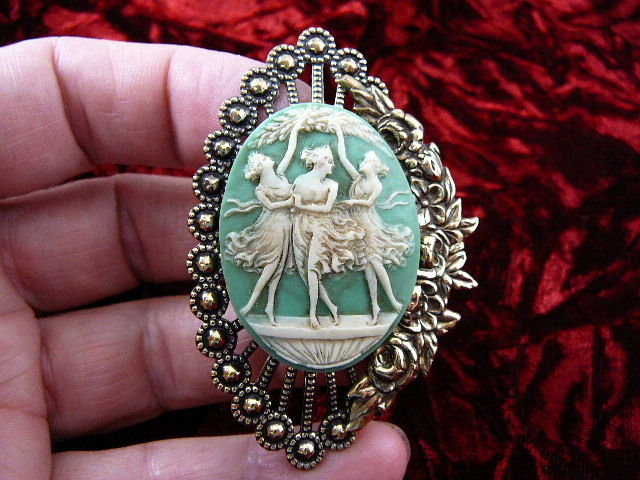 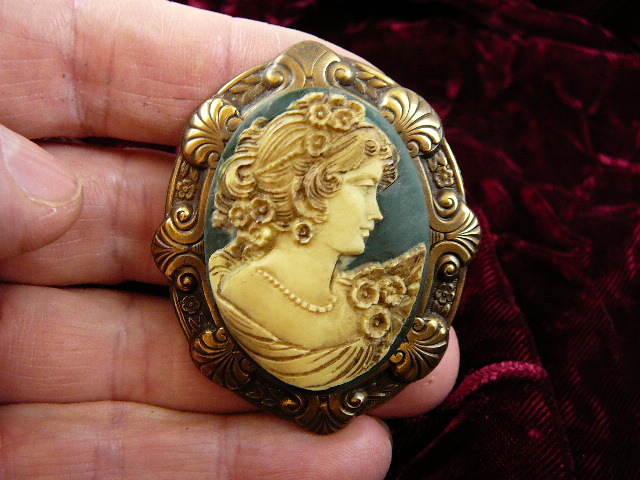 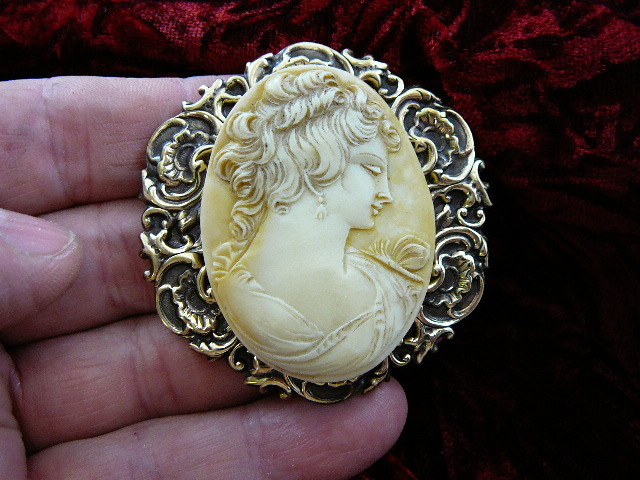 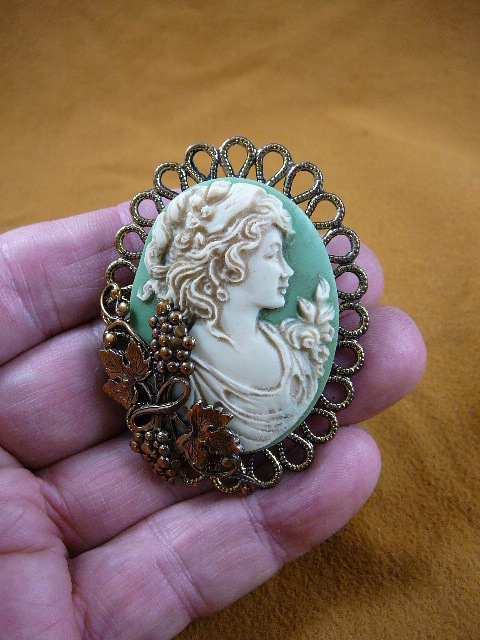 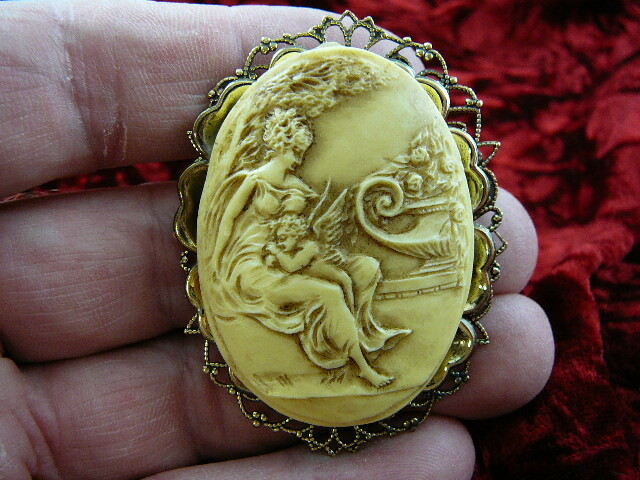 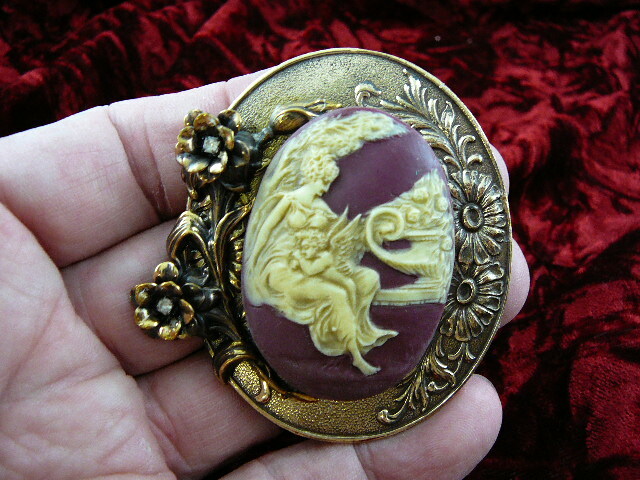 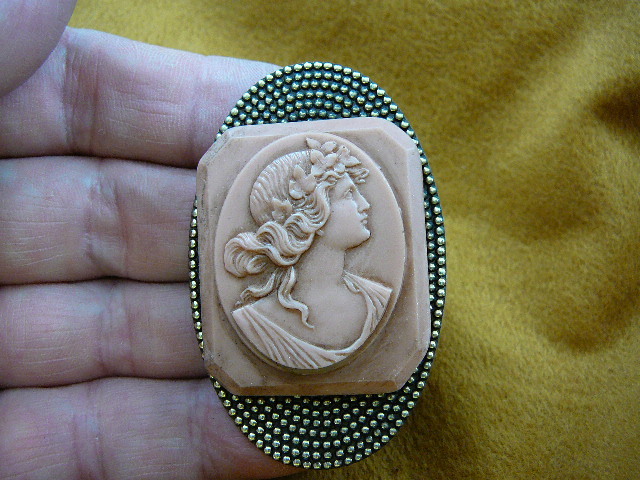 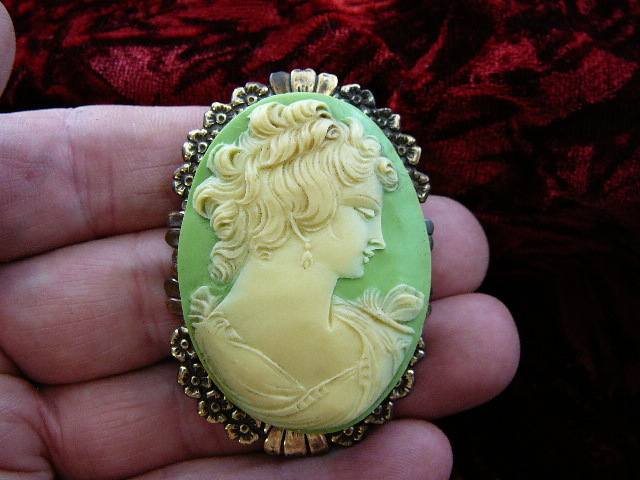 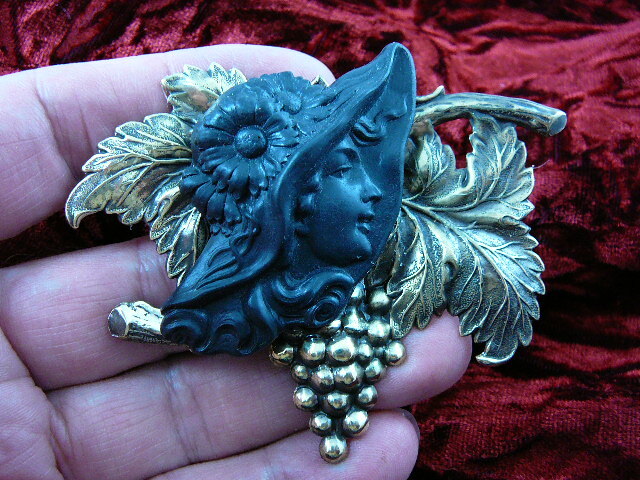 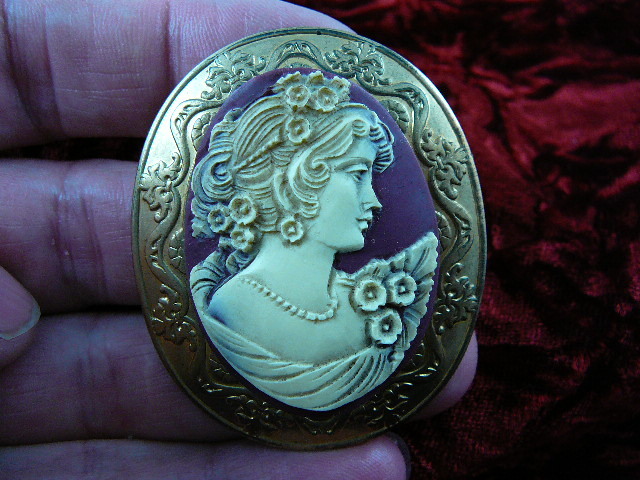 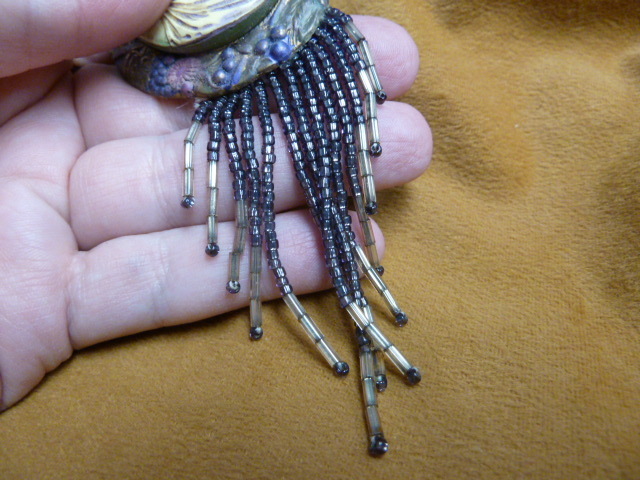 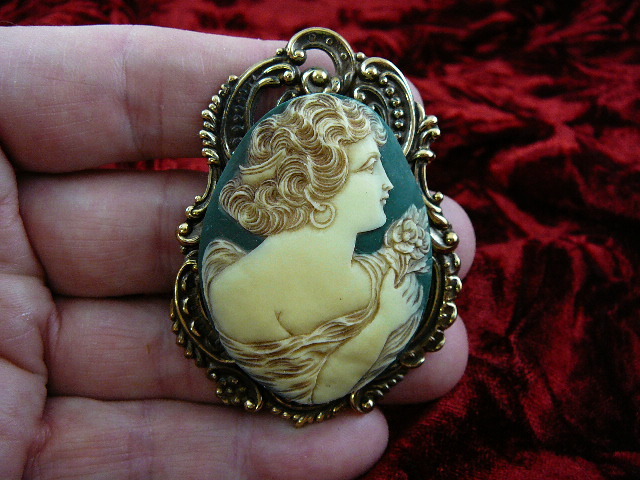 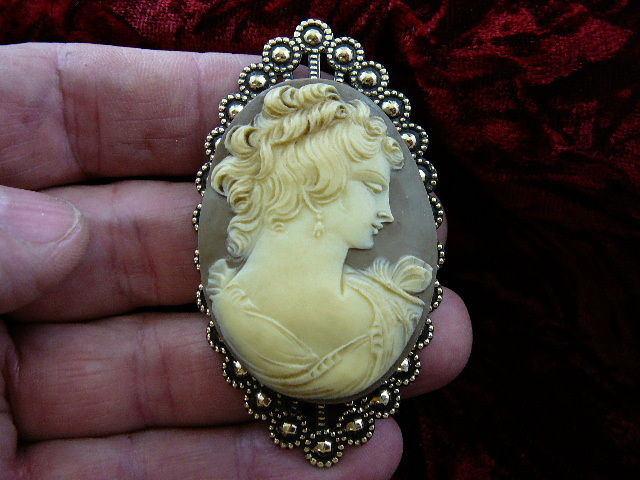 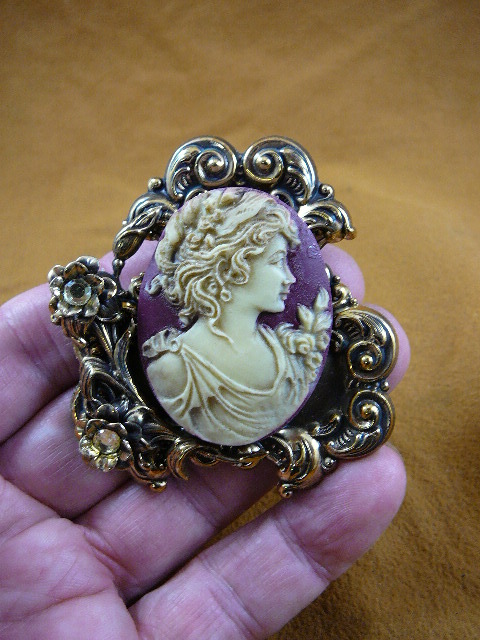 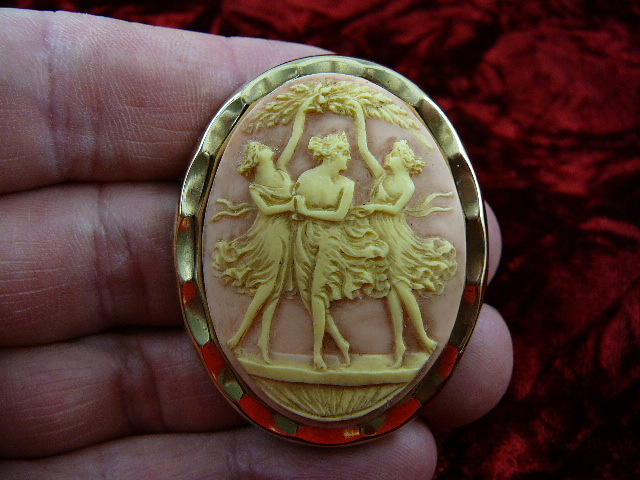 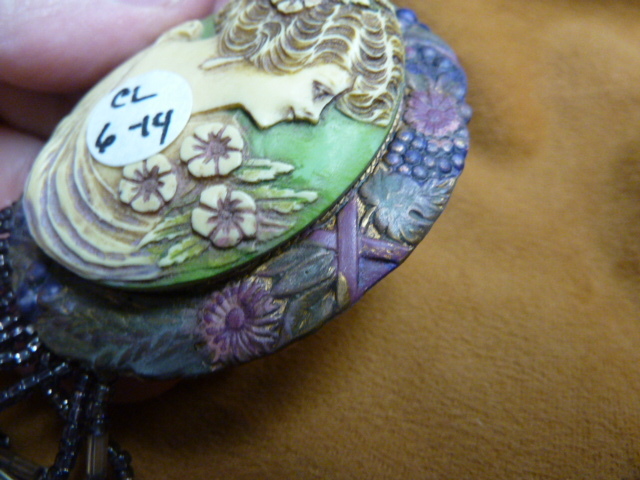 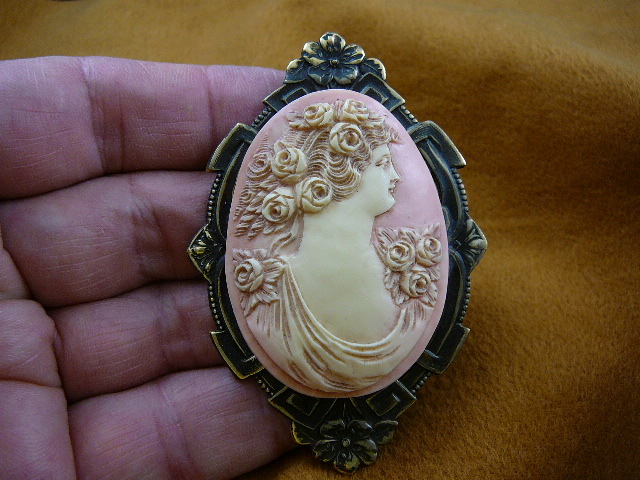 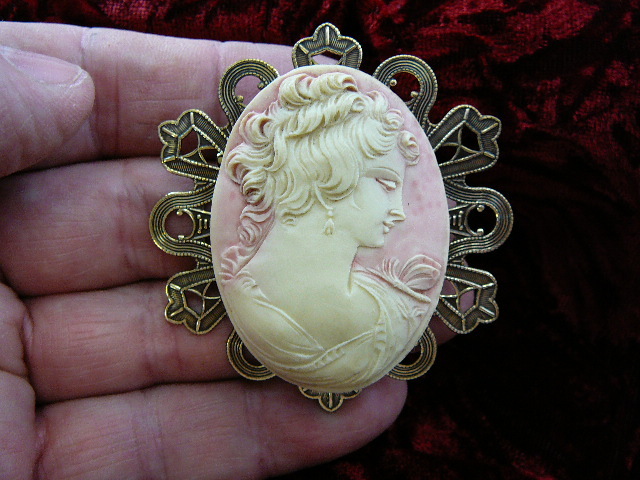 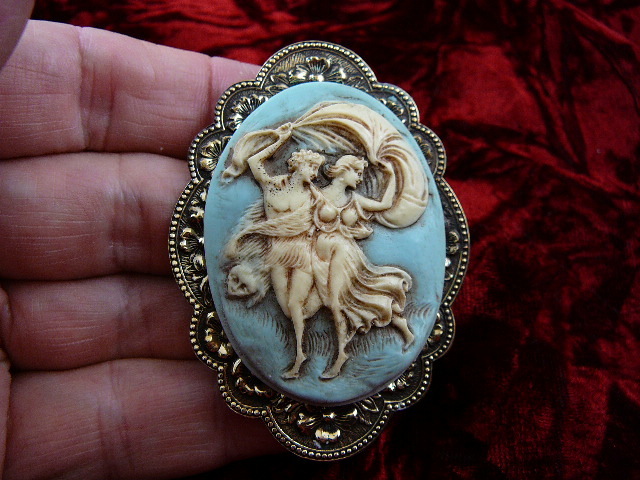 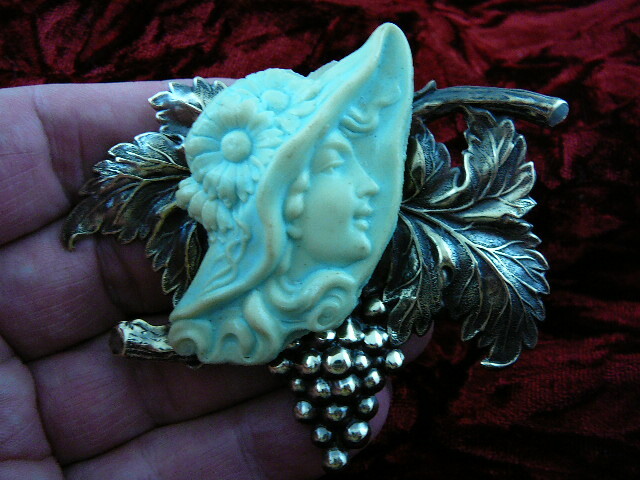 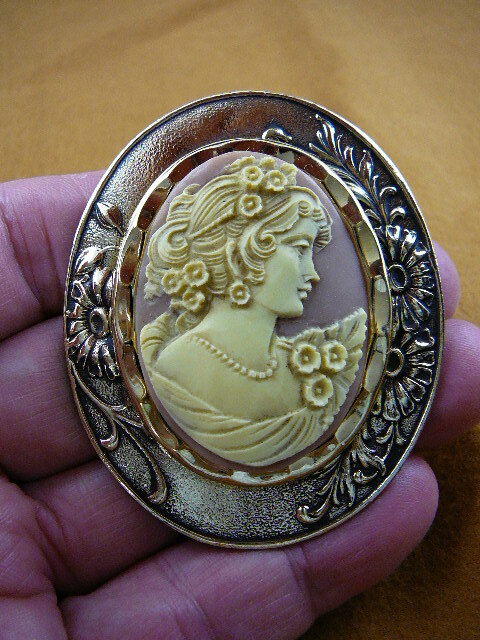 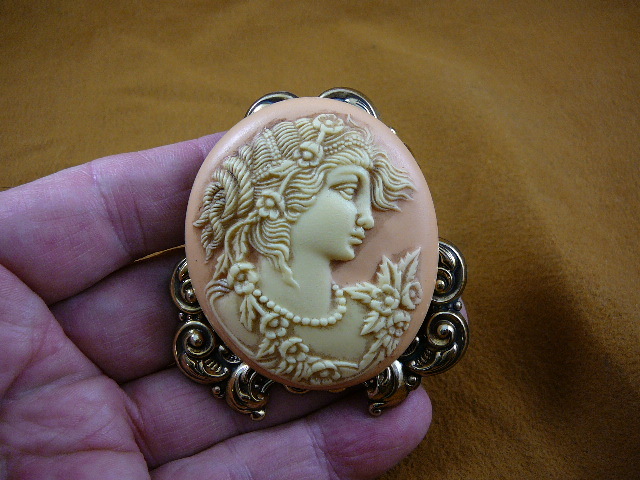 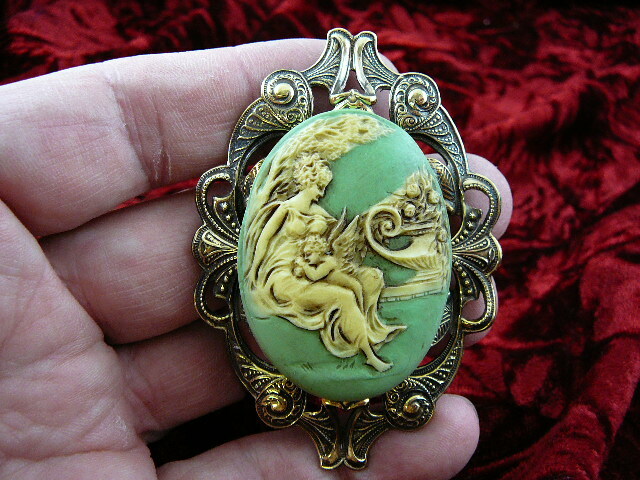 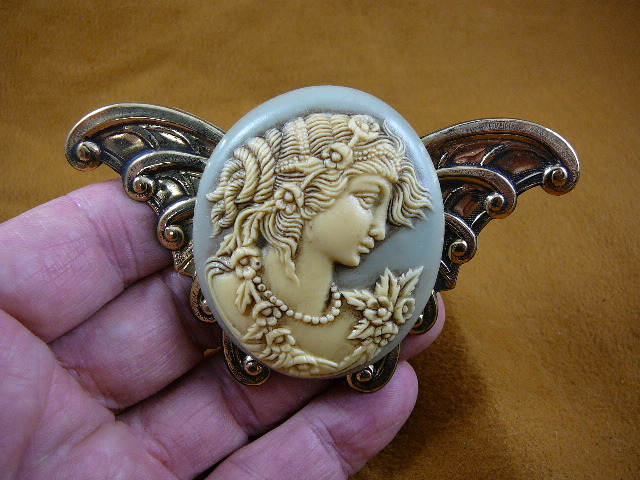 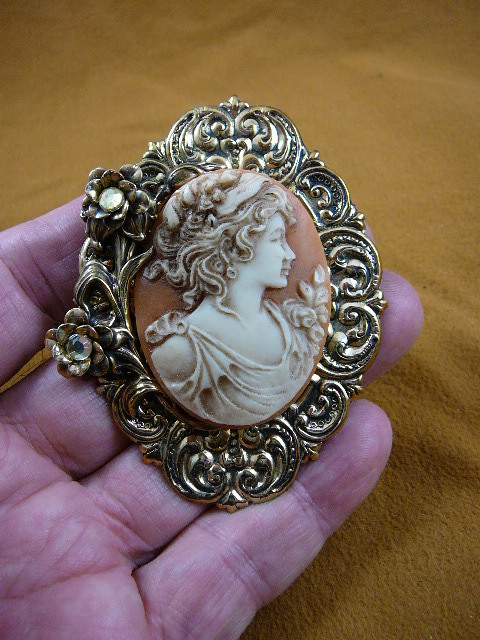 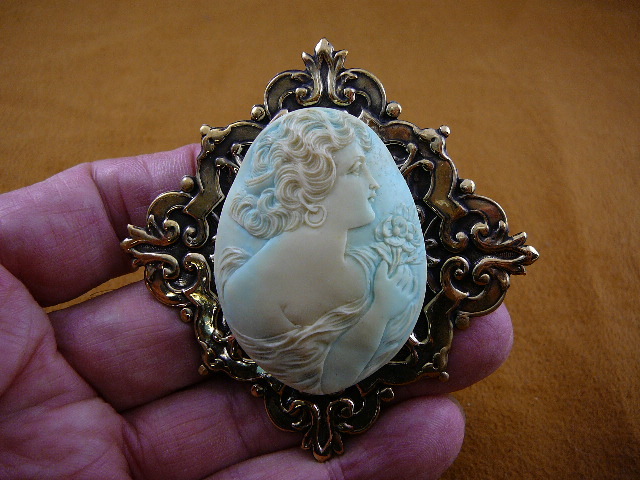 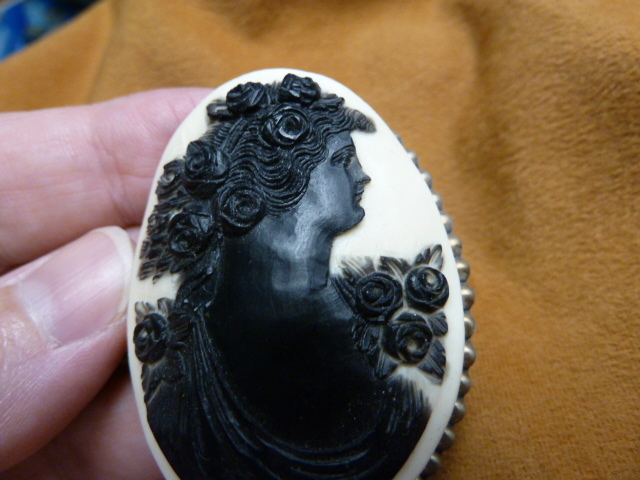 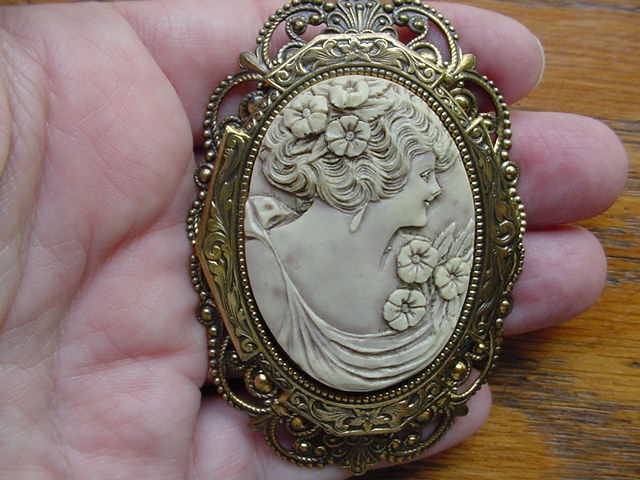 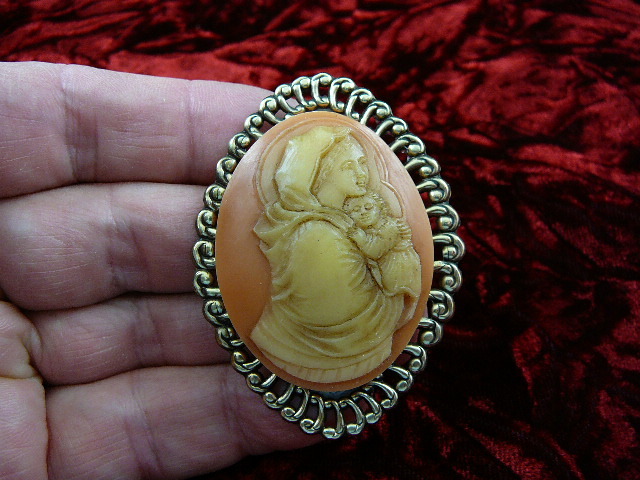 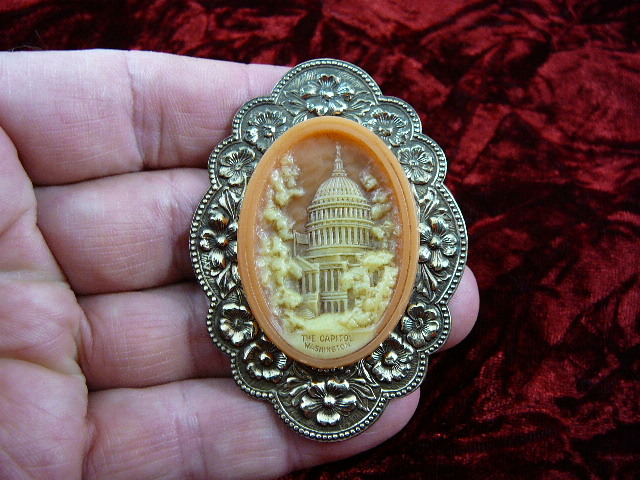 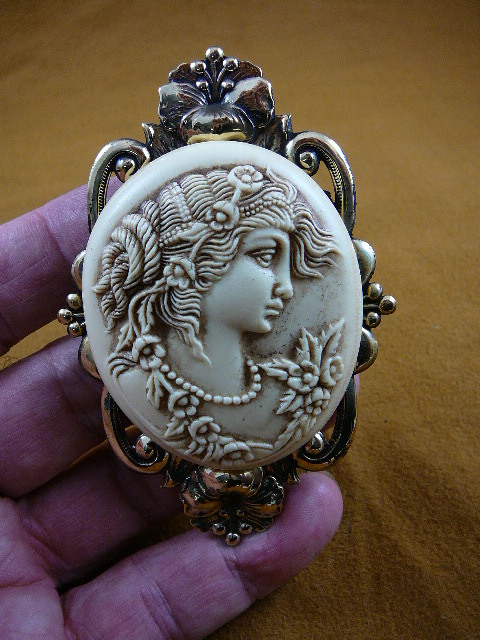 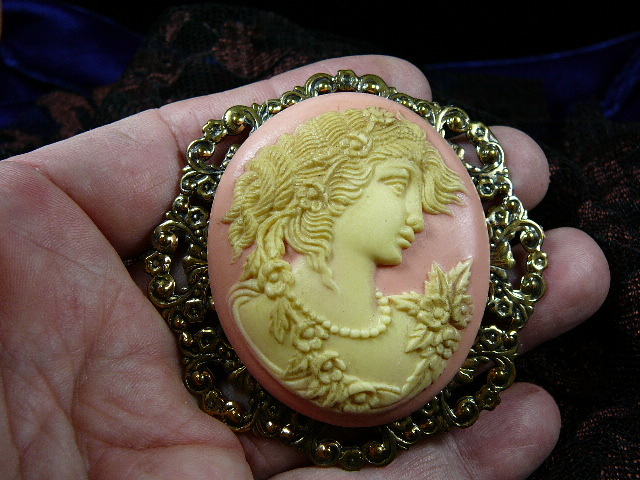 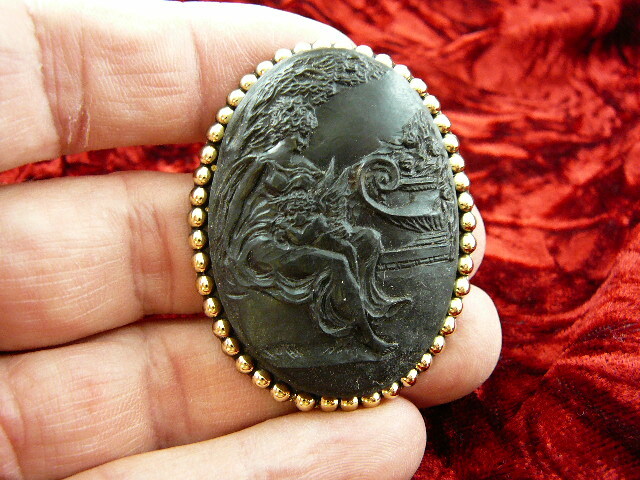 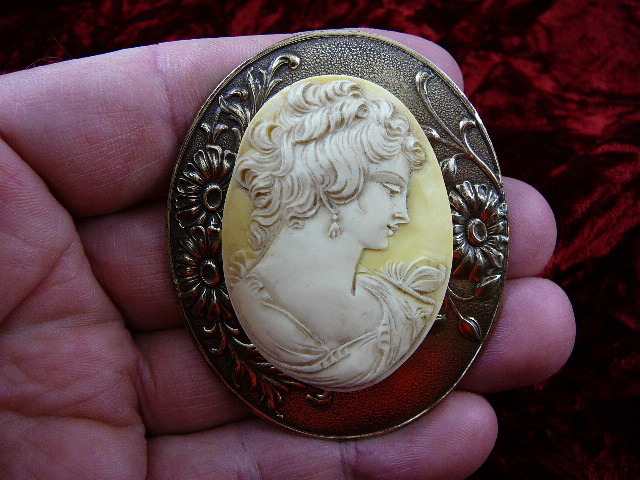 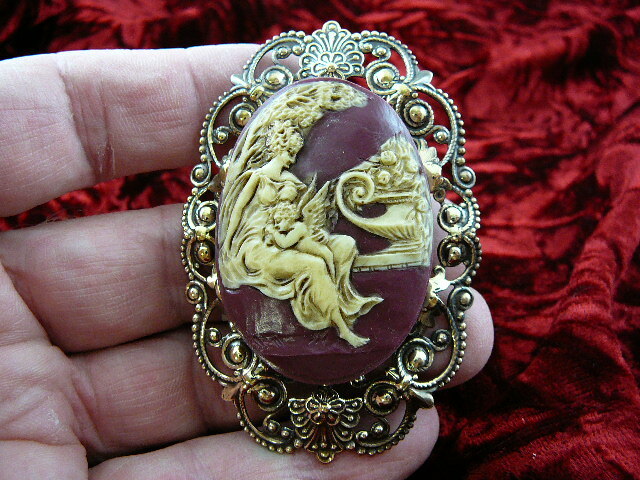 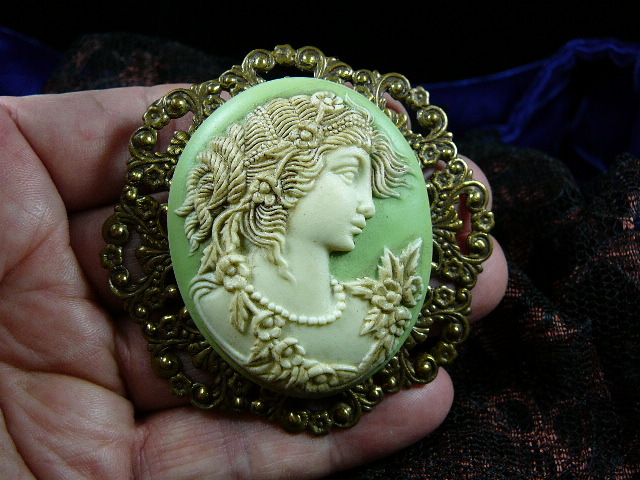 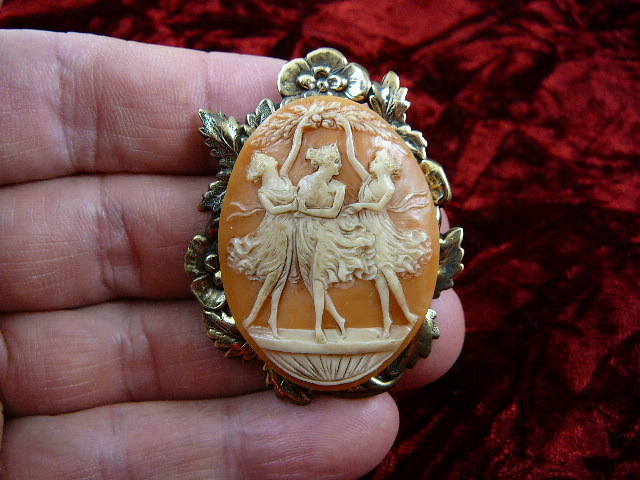 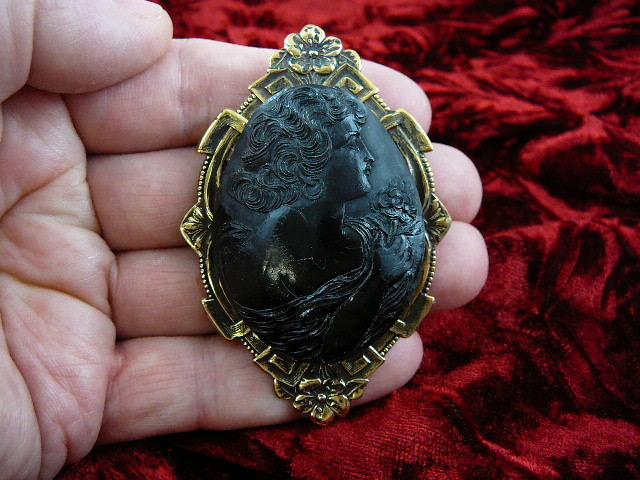 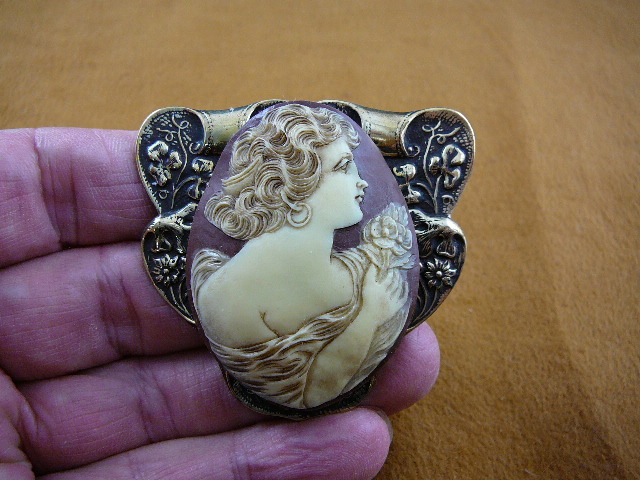 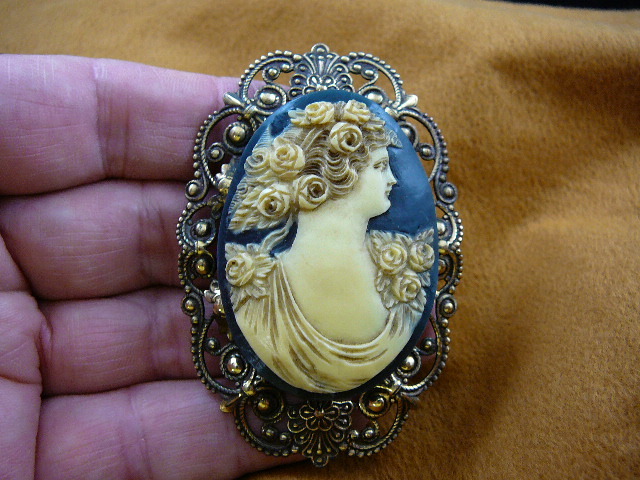 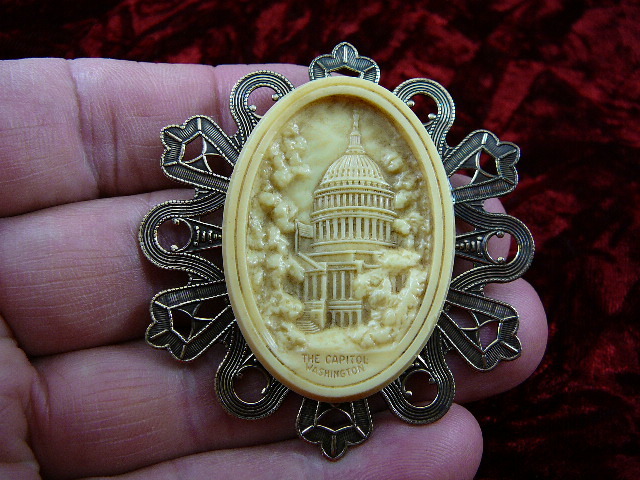 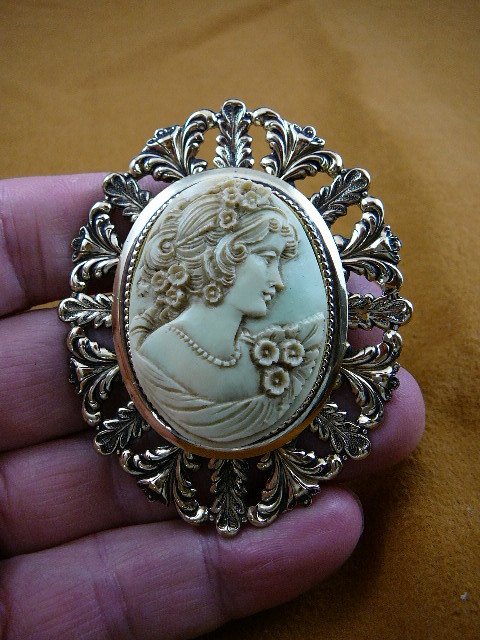 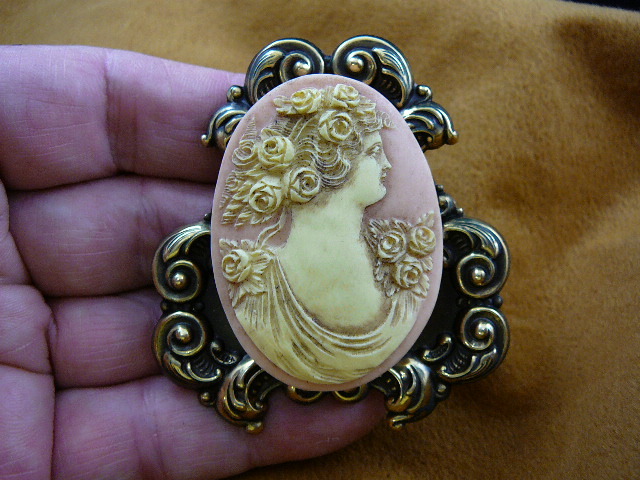 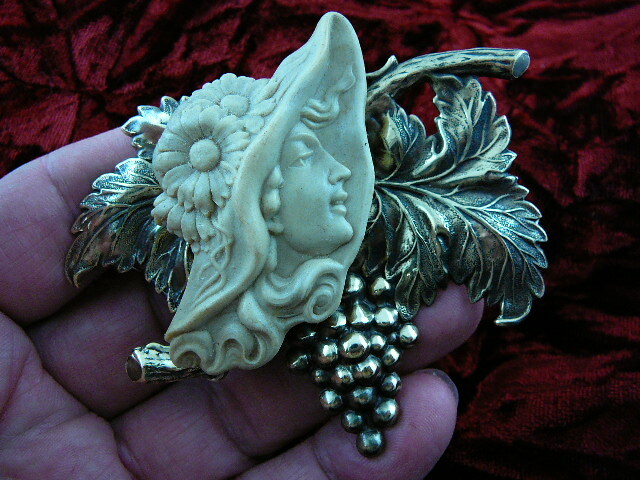 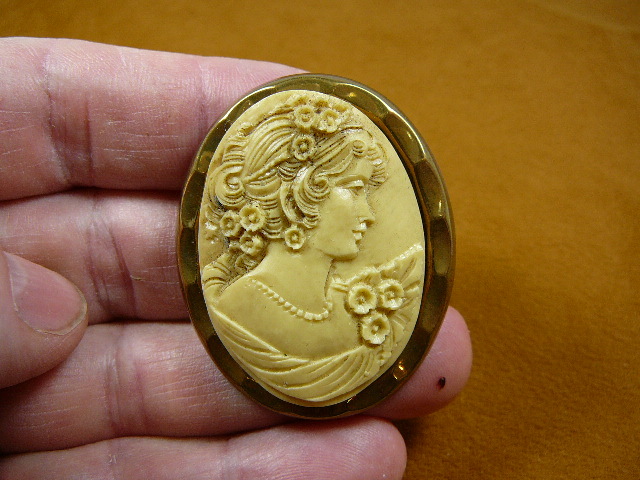 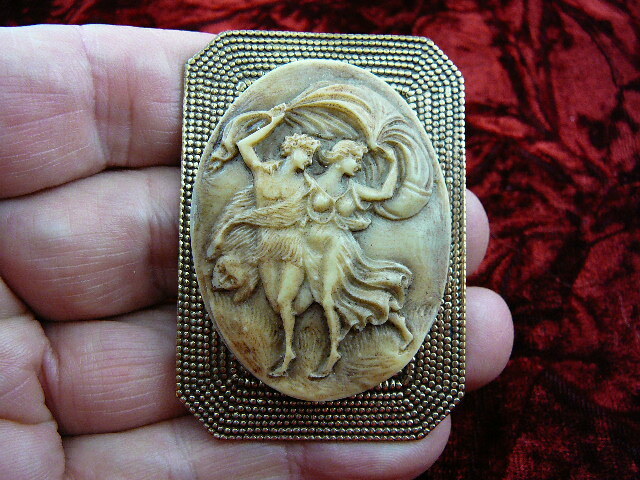 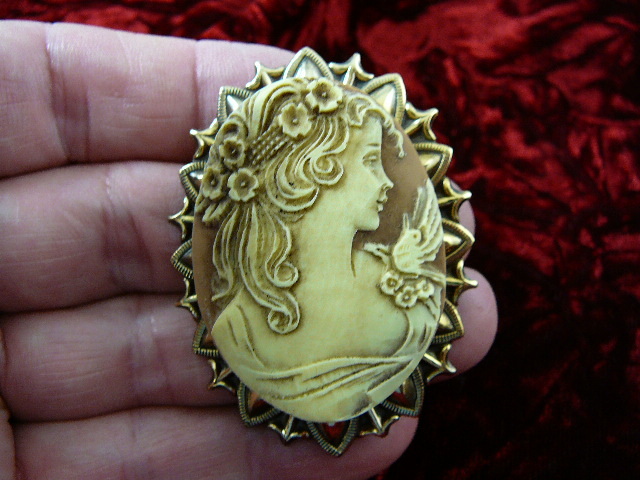 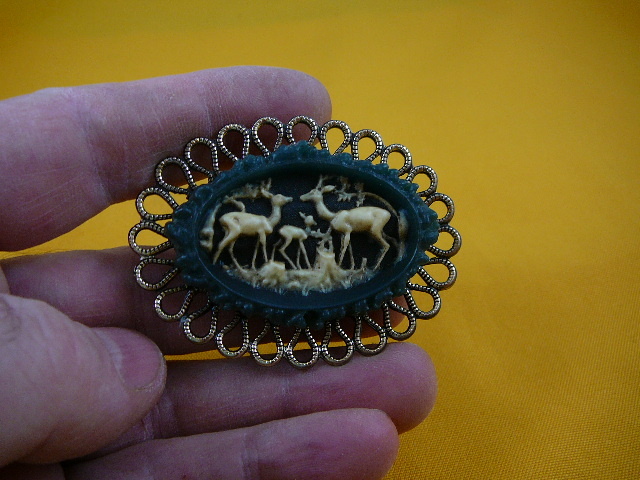 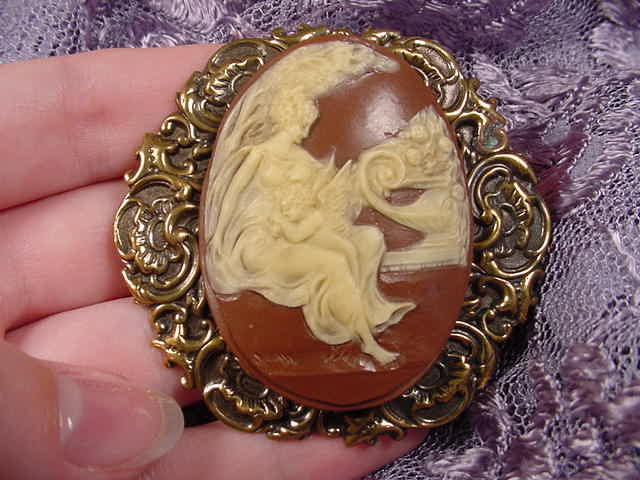 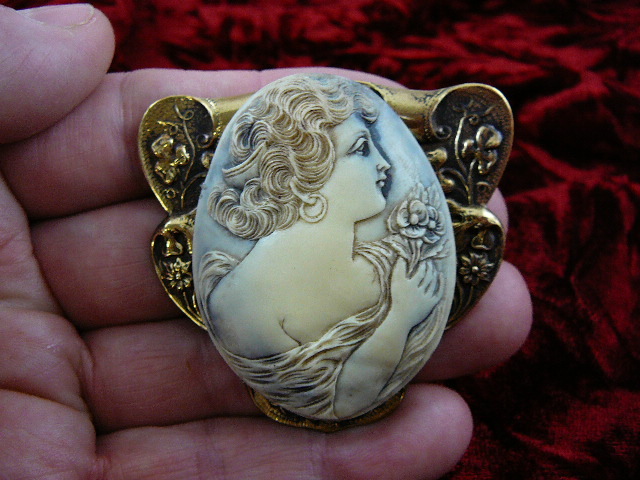 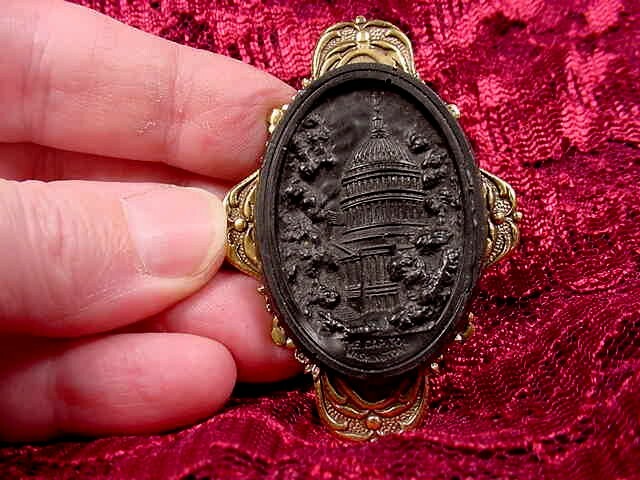 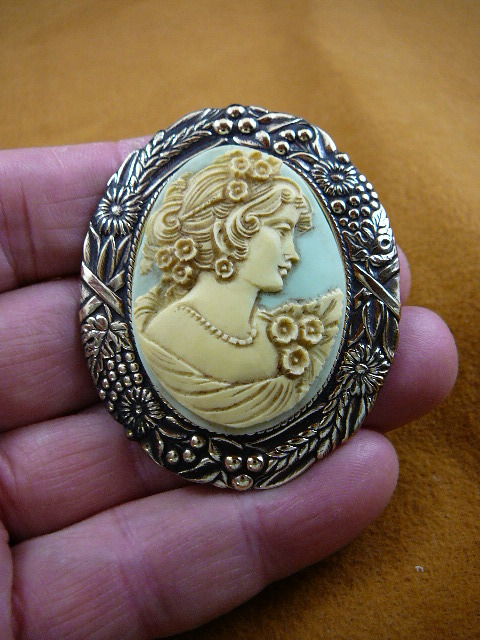 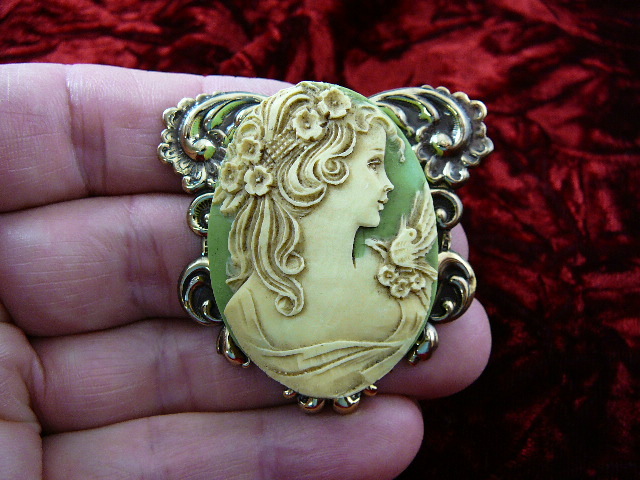 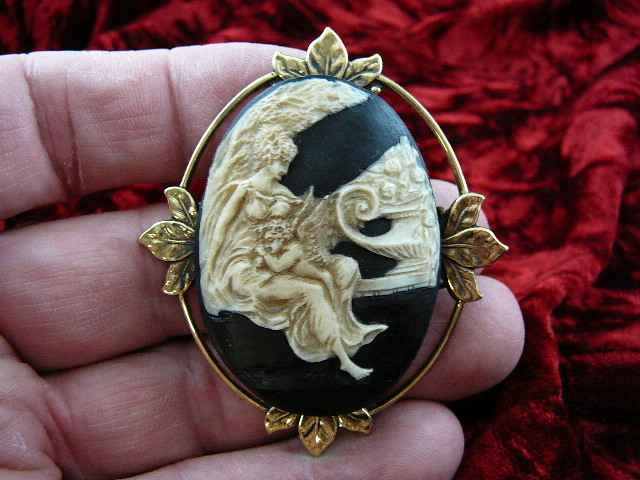 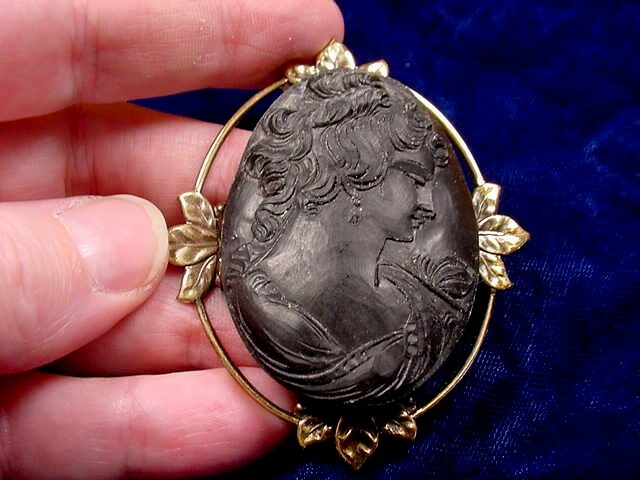 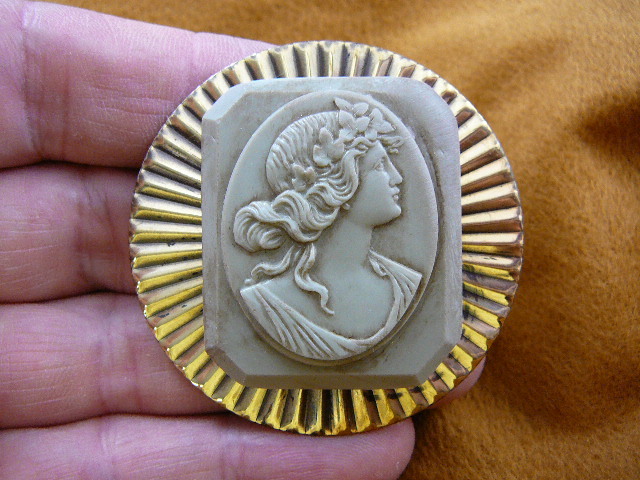 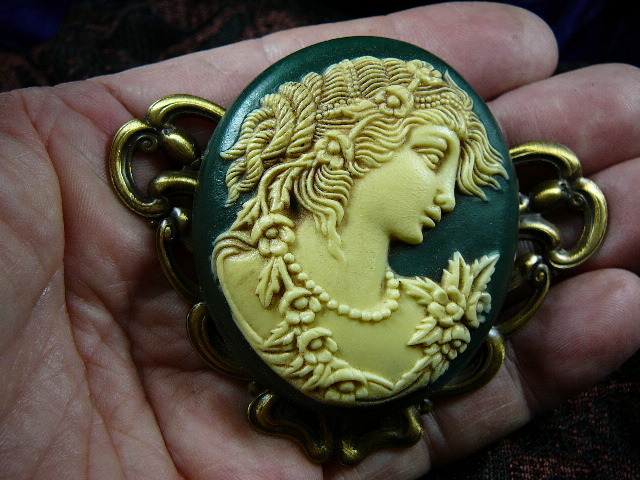 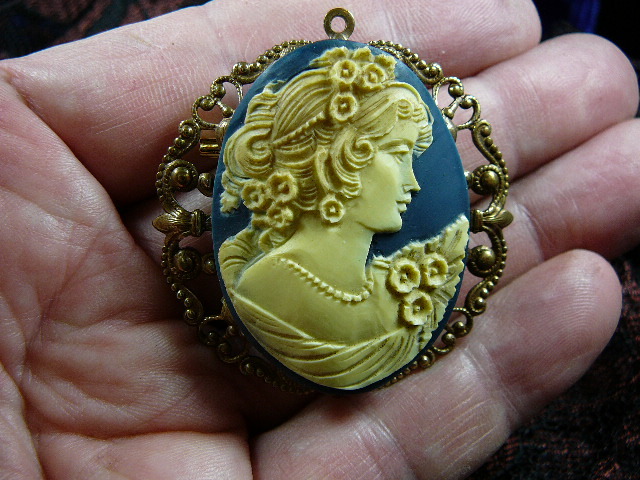 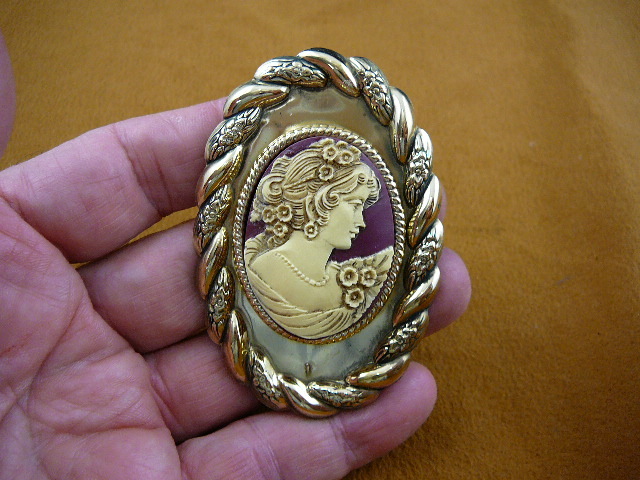 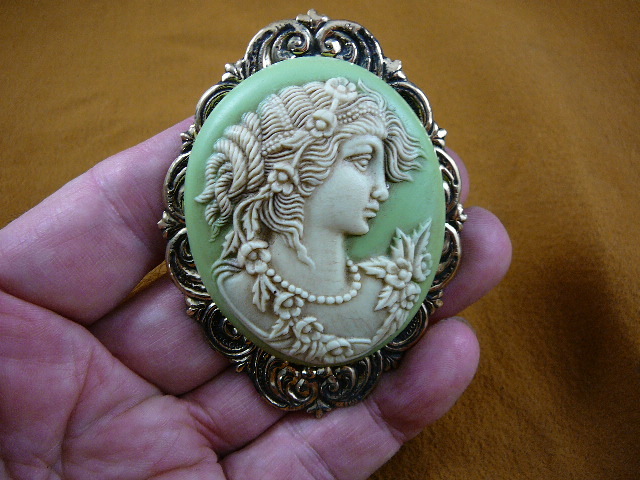 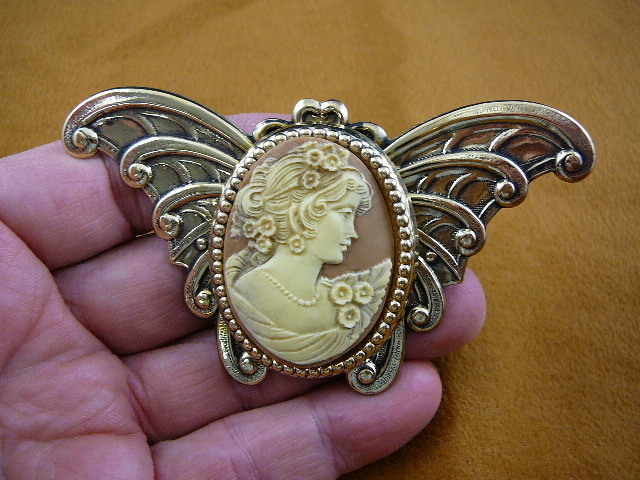 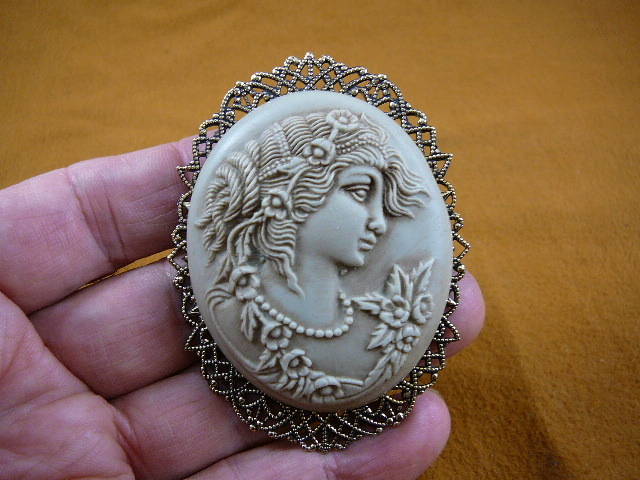 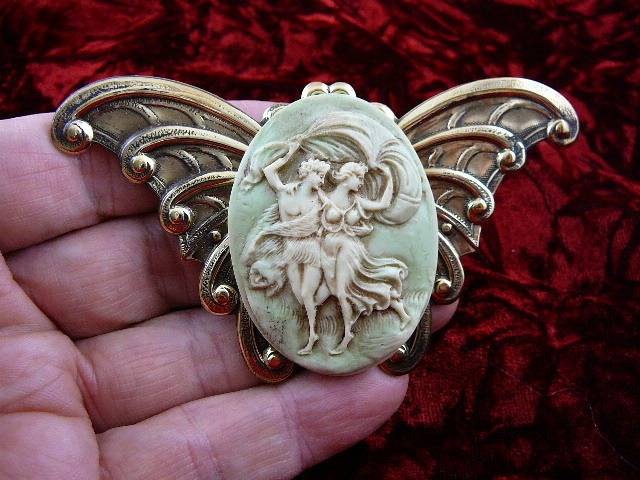 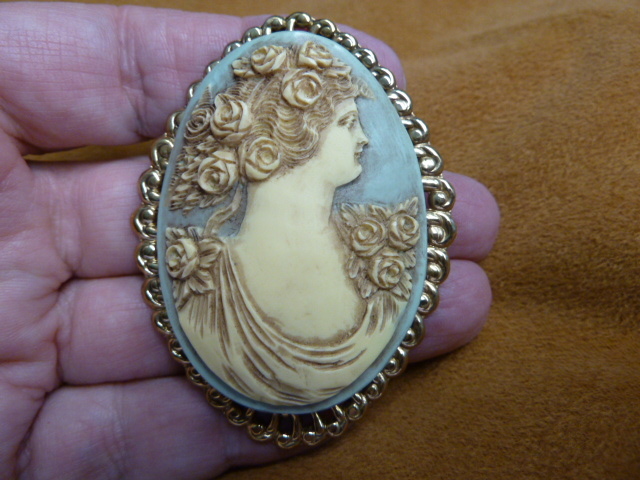 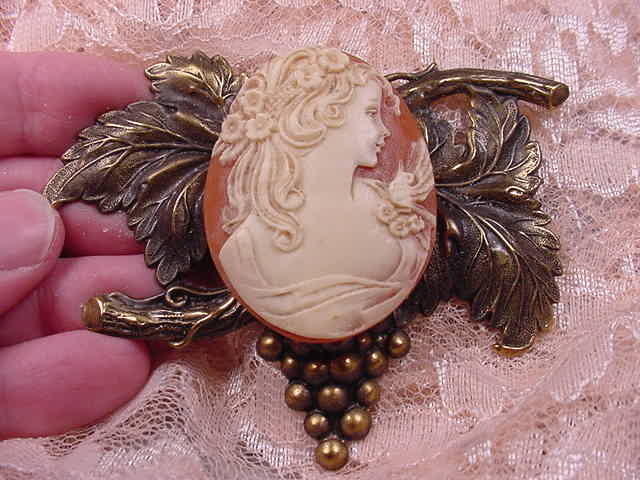 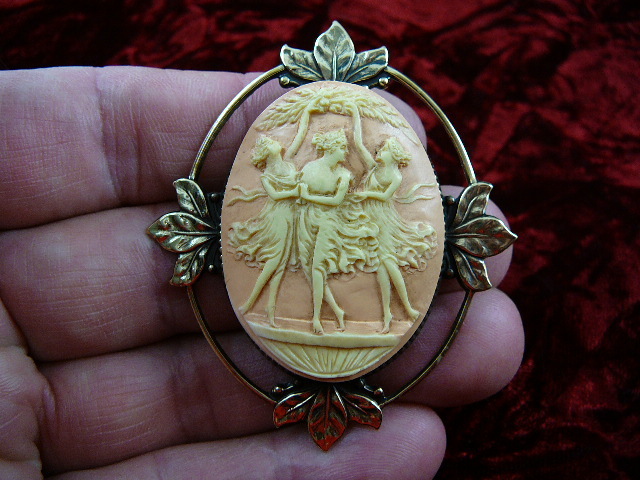 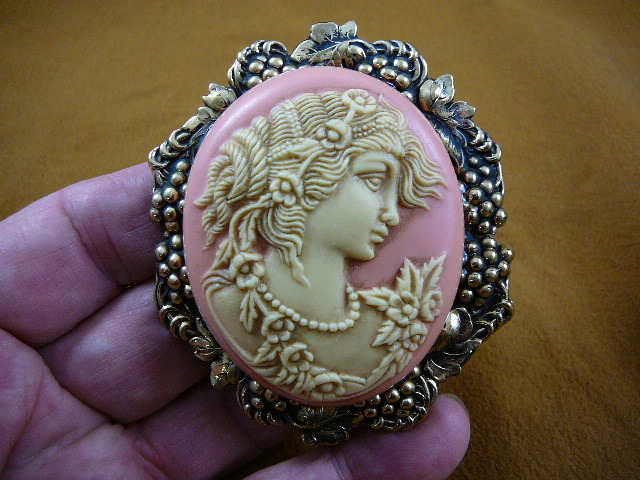 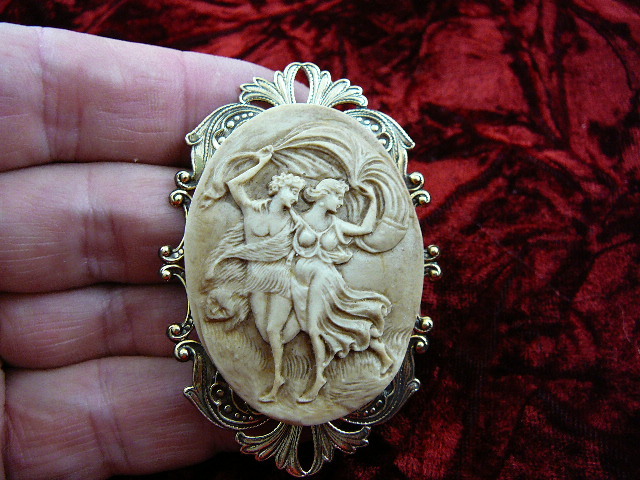 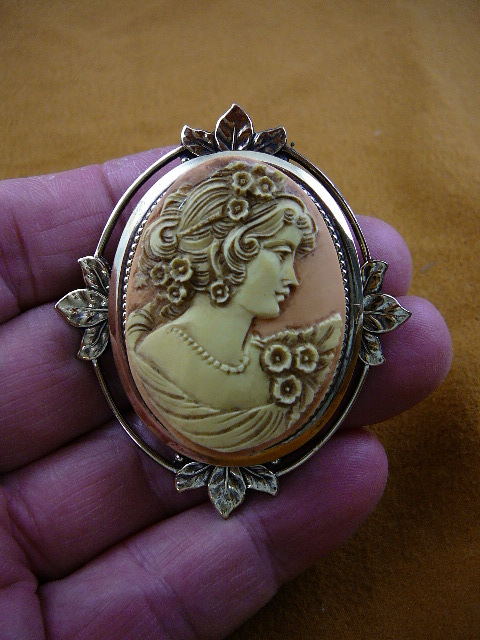 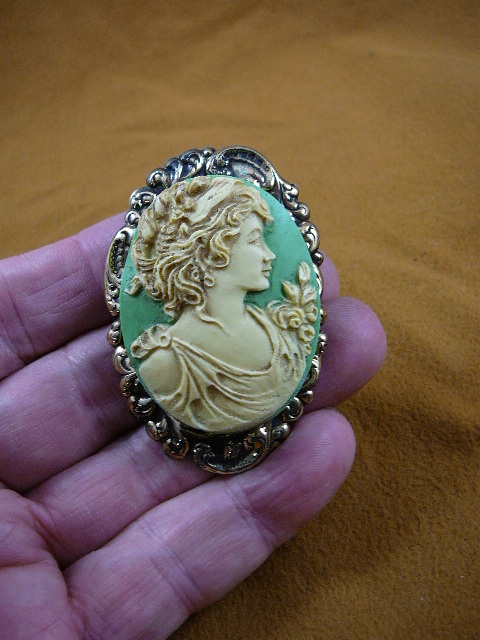 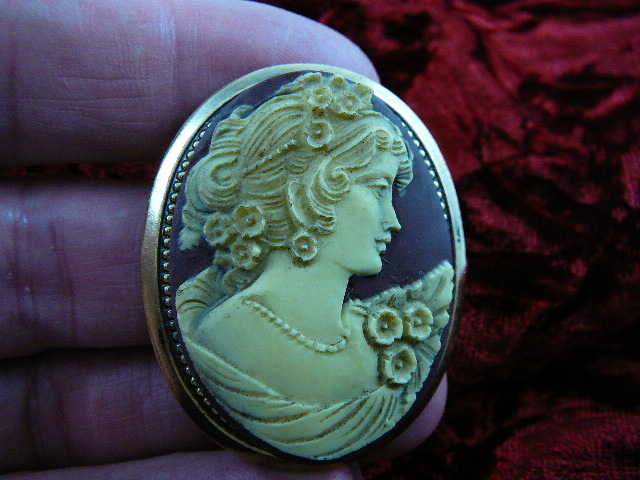 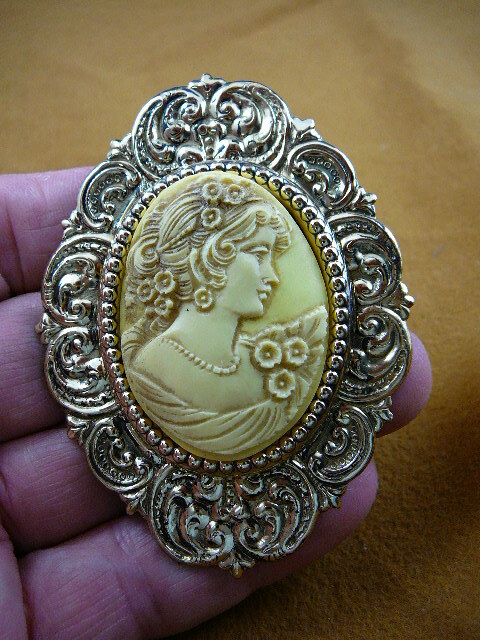 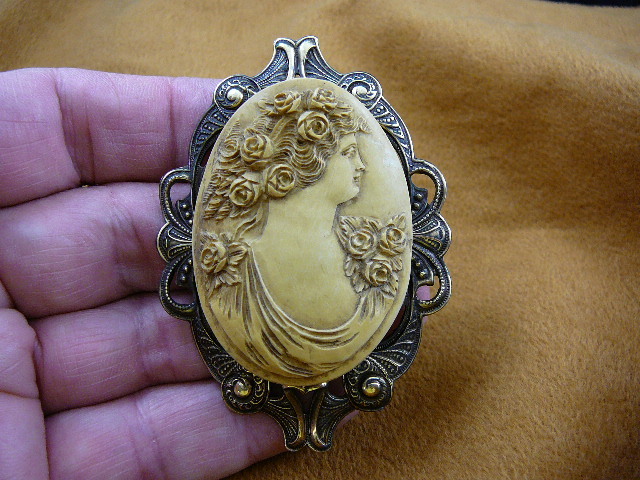 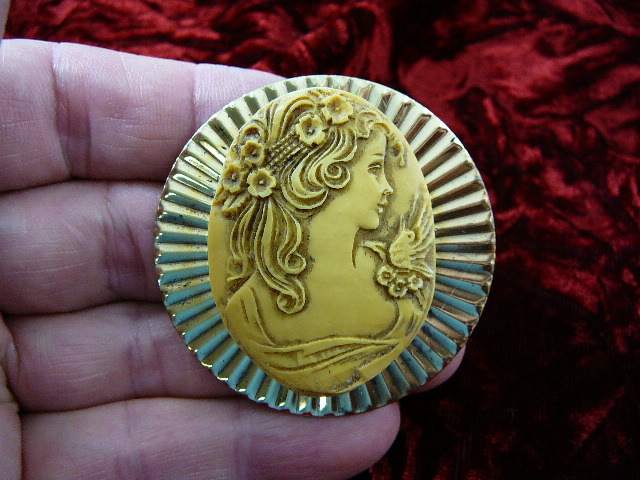 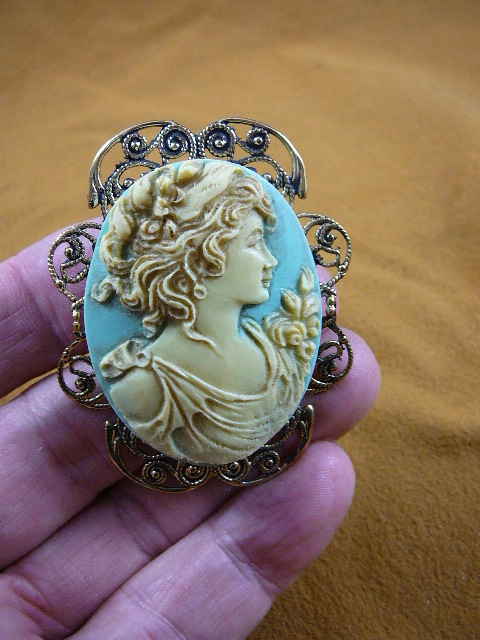 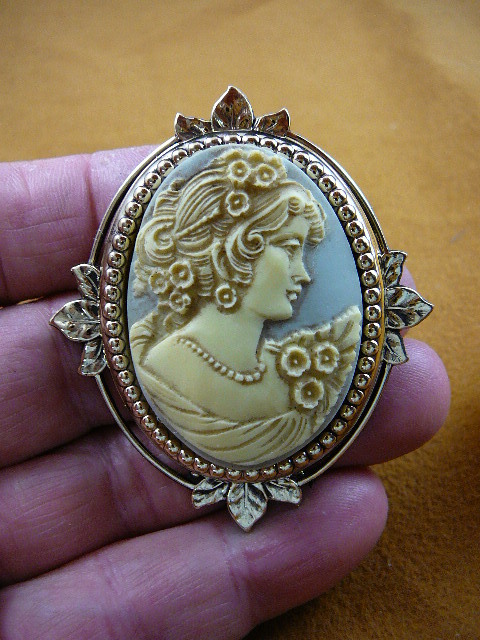 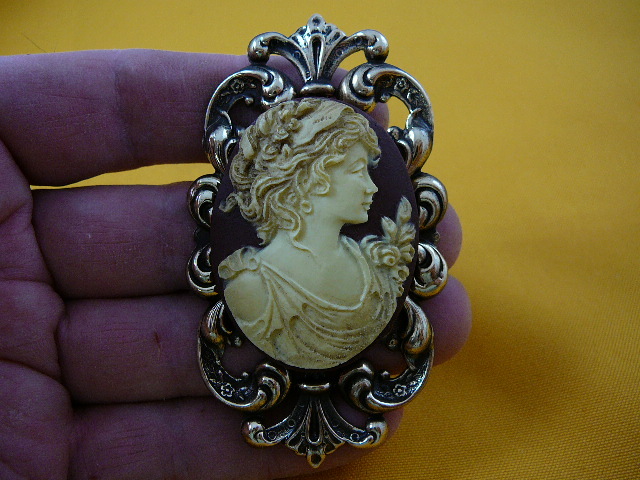 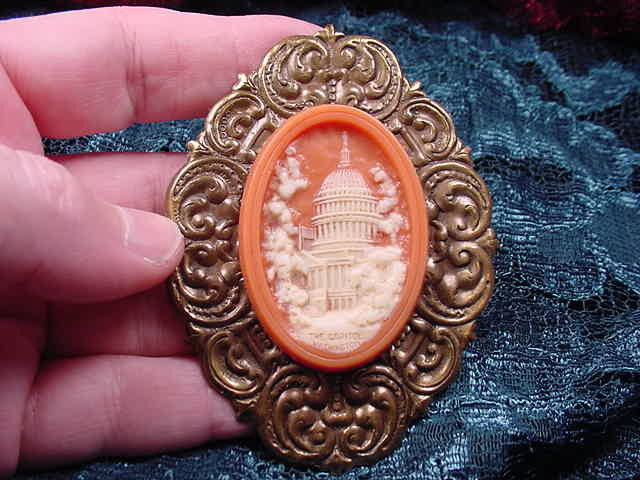 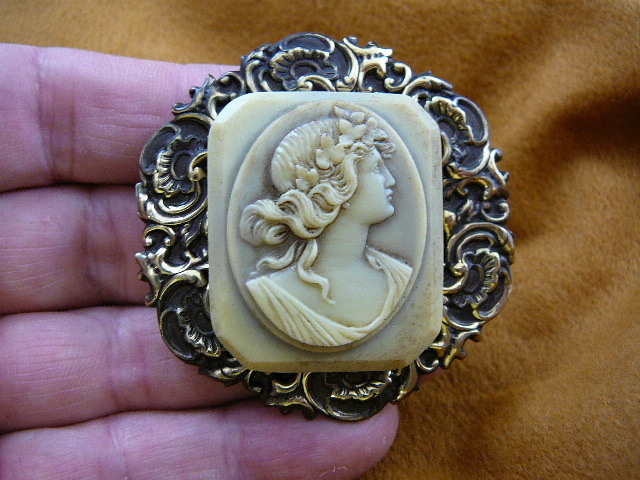 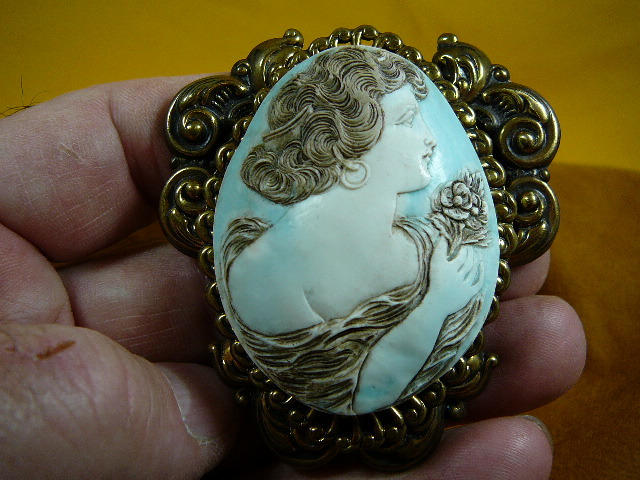 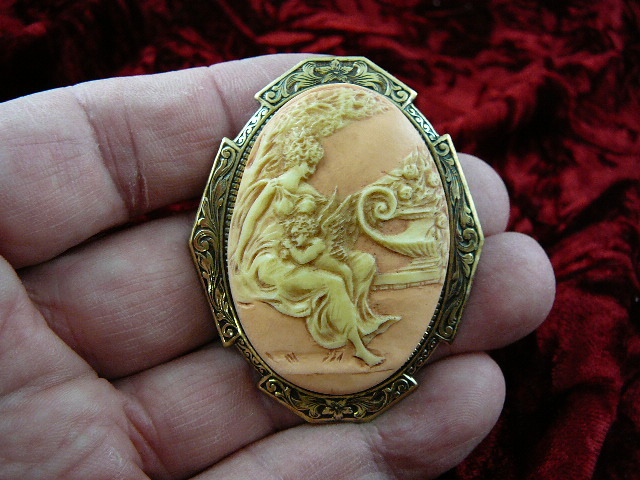 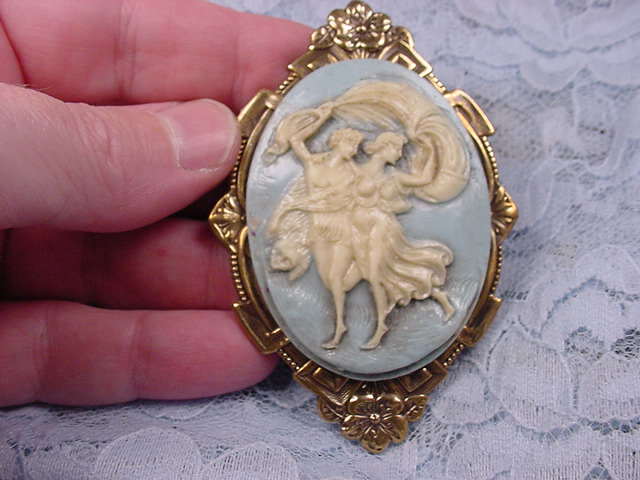 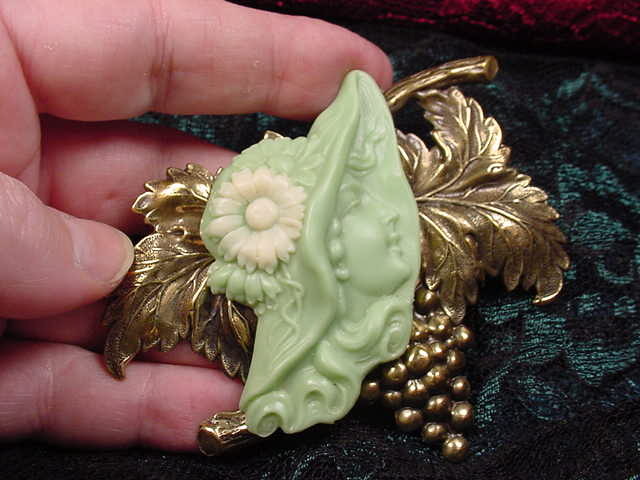 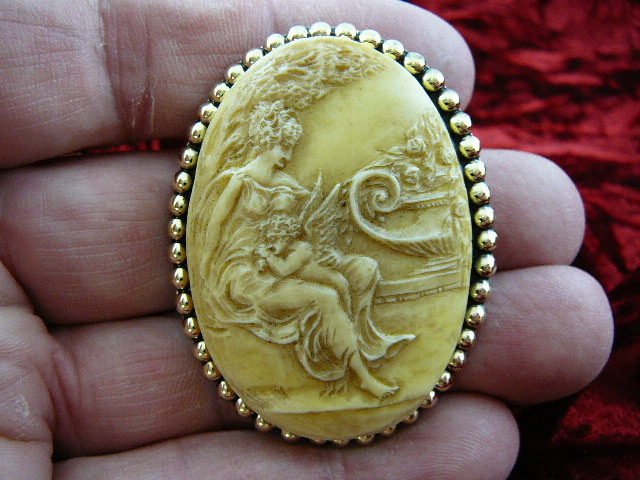 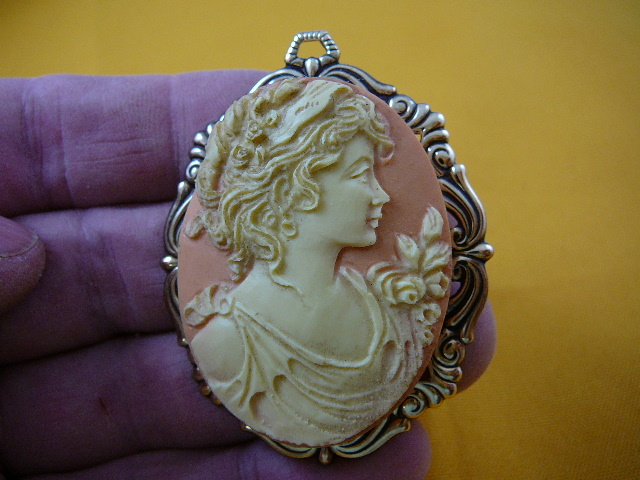 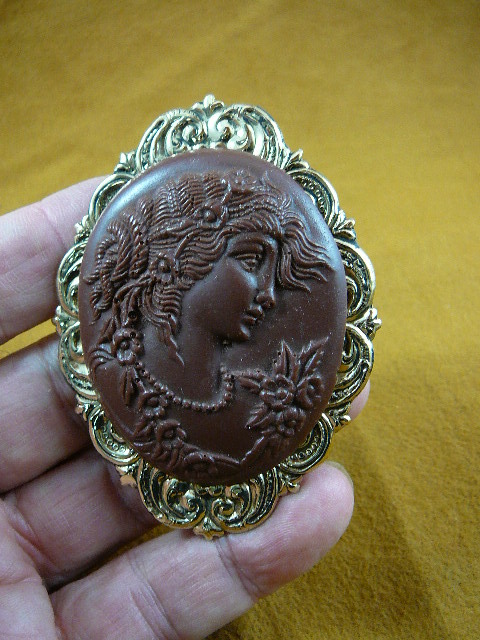 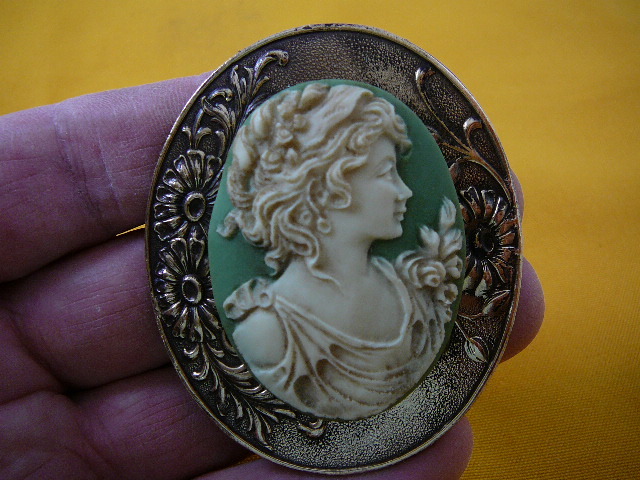 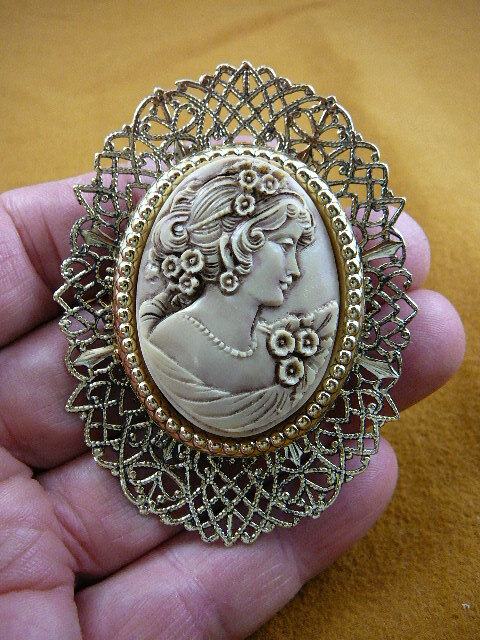 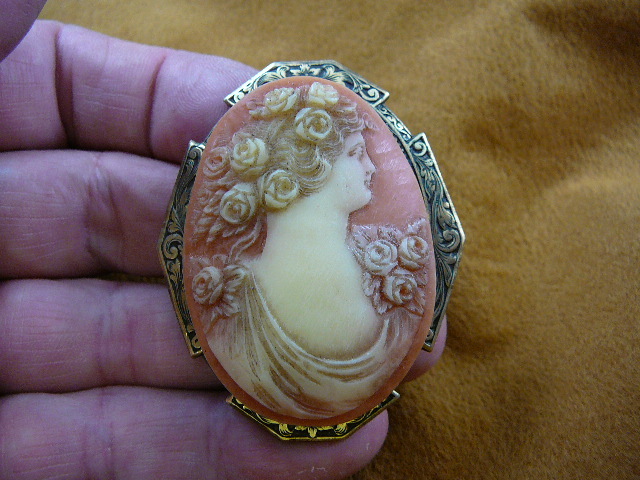 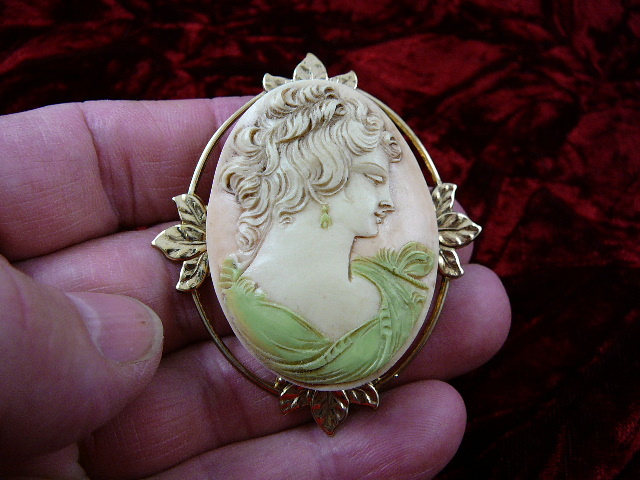 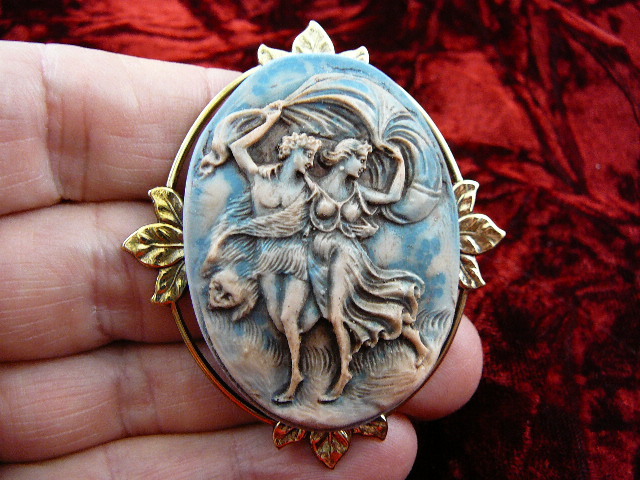 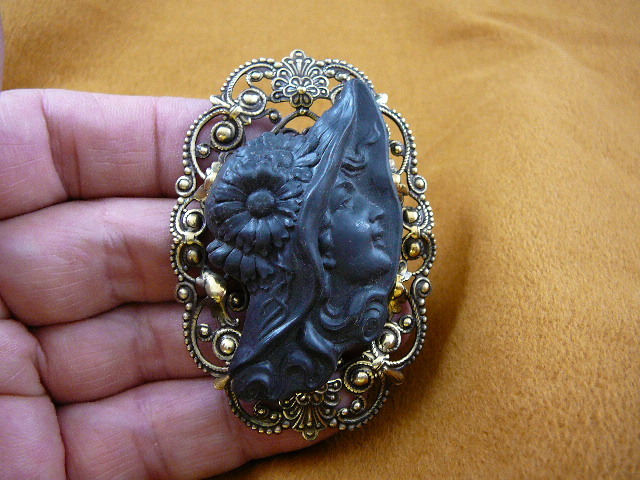 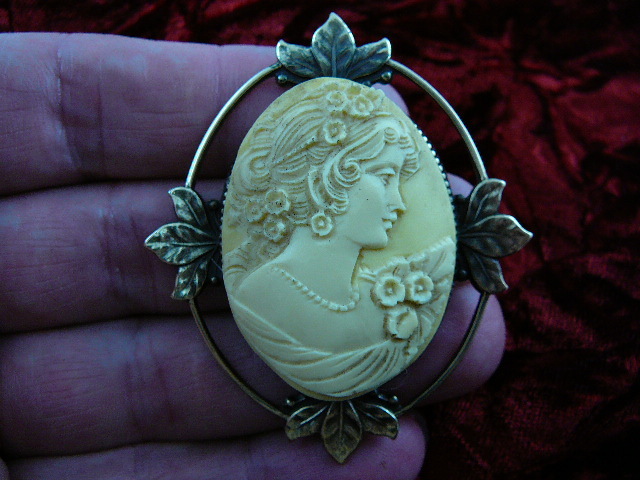 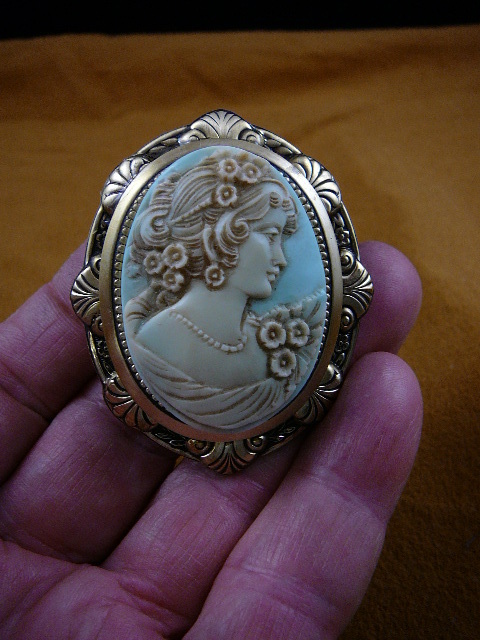 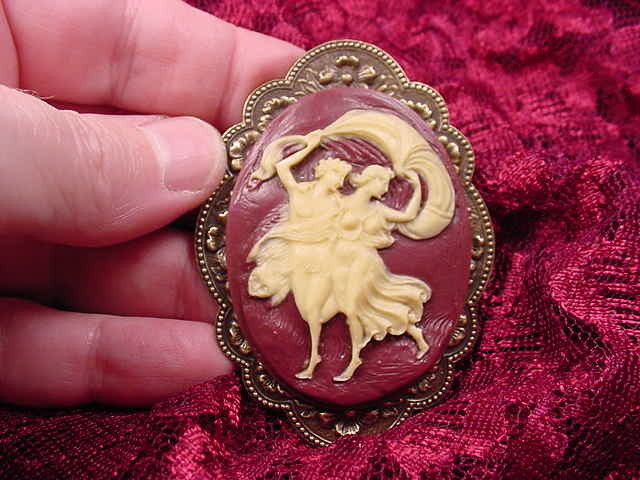 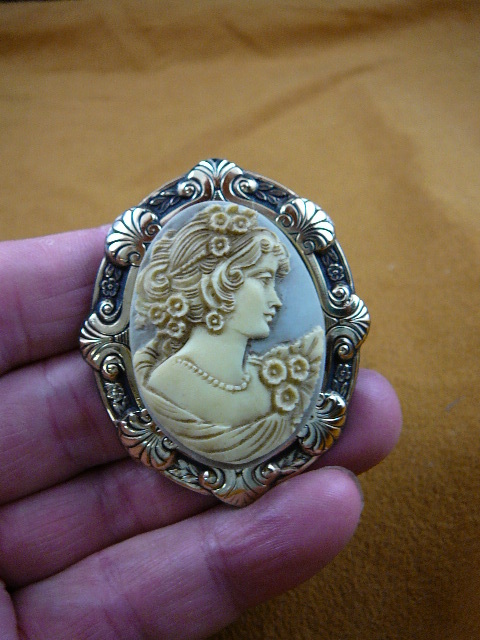 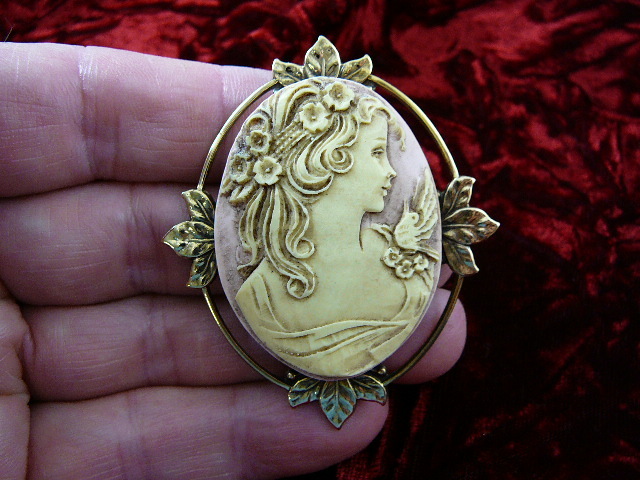 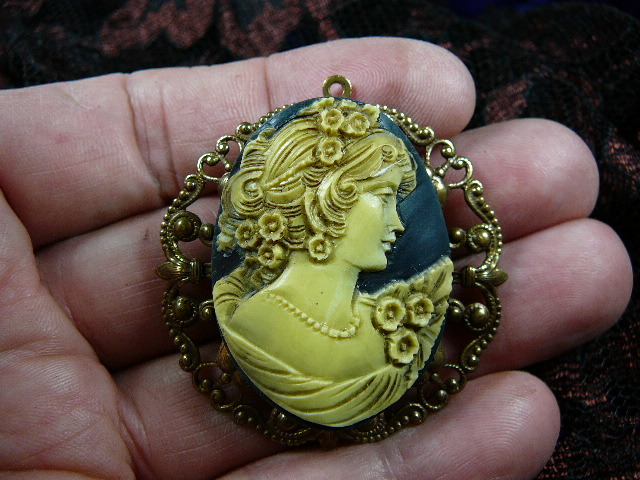 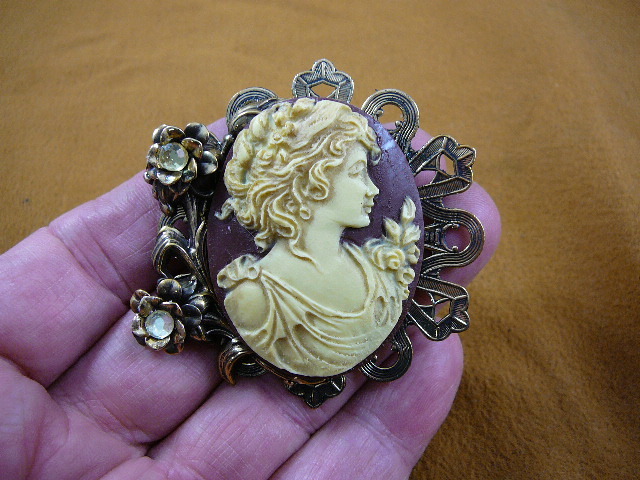 The original is worth $1,000, this high quality cameo in its style of beauty is unequalled. 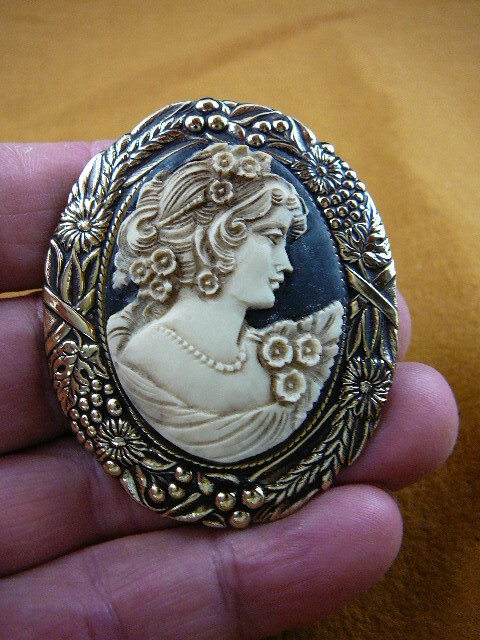 A robust yet graceful woman with a Mona Lisa smile has the most exquisite detail throughout her hair, gown and flowers I've seen yet, one of my faves. 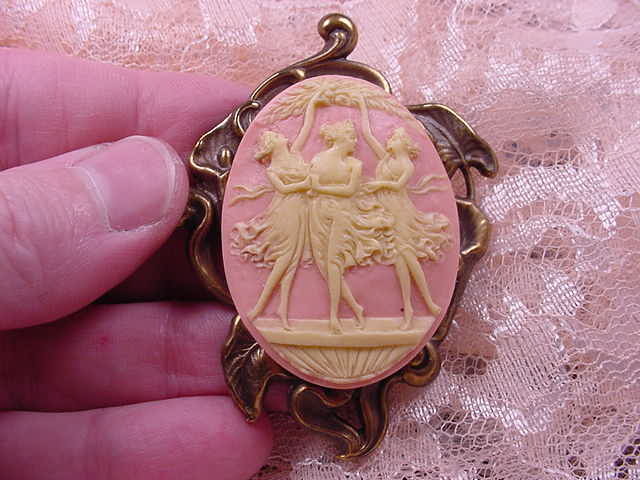 Also the best detail of all the Three Muses we have, excellent! 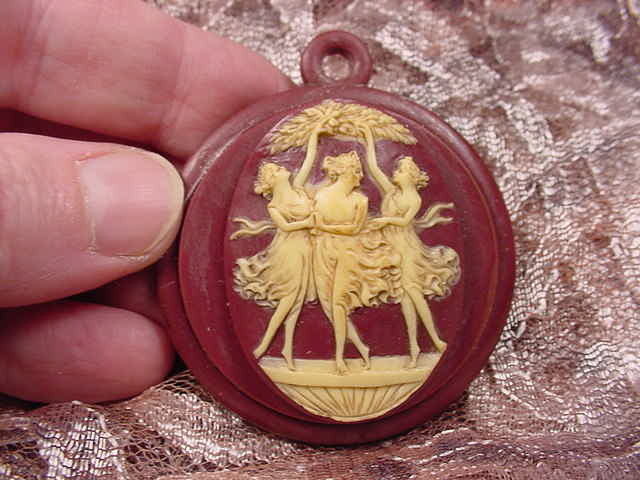 In Greco-Roman religion and myth, the THREE MUSES represent a group of sister goddesses, daughters of Zeus and Mnemosyne (Memory). 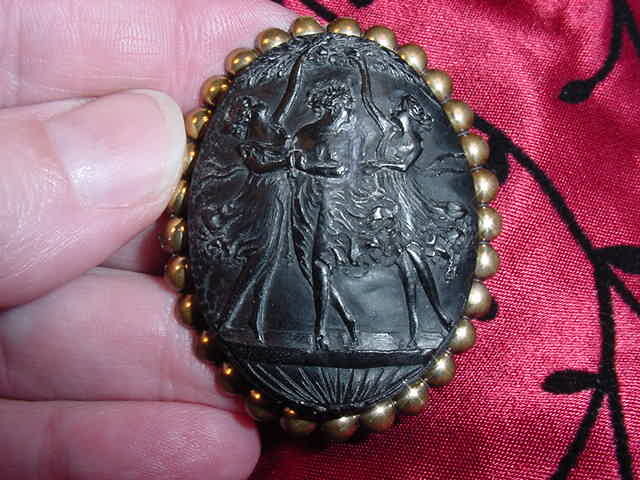 A festival was held in their honour every four years near Mount Helicon, the centre of their cult in Greece. 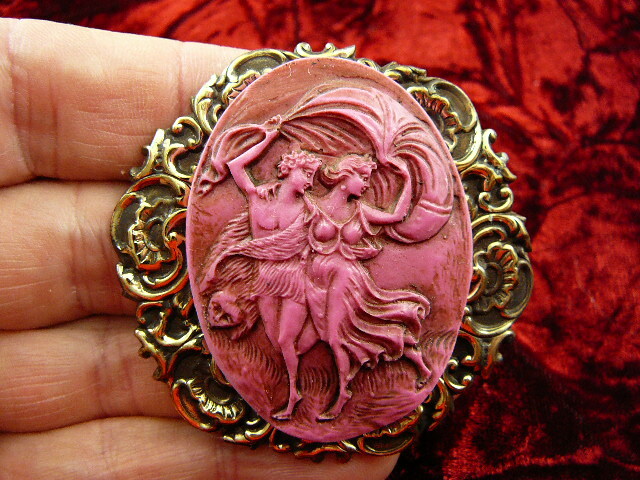 They probably began as the patron goddesses of poets, though later their range was extended to include all the liberal arts and sciences. 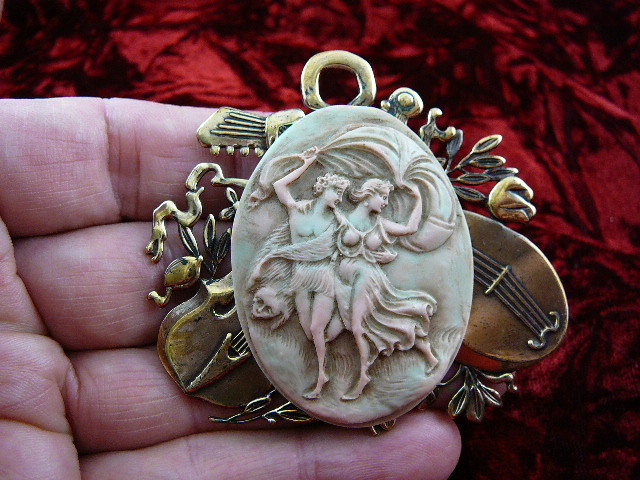 Nine Muses are usually named: Calliope (heroic or epic poetry), Clio (history), Erato (lyric or love poetry), Euterpe (music or flutes), Melpomene (tragedy), Polyhymnia (sacred poetry or mime), Terpsichore (dancing and choral song), Thalia (comedy), and Urania (astronomy).